DCICPT: UNI - Sector Analysis Inspector Paul D., Lisbon, June 2, 2008. 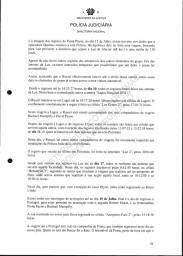 After performing the analysis that led to the report dated 5 February 2008, there was requested an analysis of the records of the activity of the mobile phones of the parents of Madeleine and the other members of the group accompanying them on vacation to Portugal. 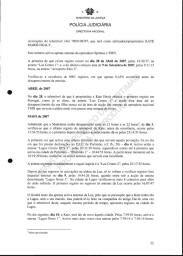 For that [to be done] Excel files were obtained from the 3 national mobile phone operators for the period between 28 April and 27 July, 2007. The data received were duly cleaned and processed to ascertain, through activation of phone antennae, the places where they were and where they may have moved. 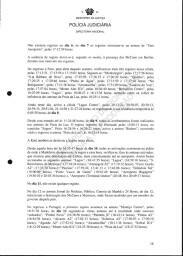 This report deals with the daily mobile phone activity of each of the 9 individuals and also with the intervals of time that the mobile phones of the parents of Madeleine were without any contact [made no contact with antennae]. While in the first [former] case all records from arrival until departure were processed, in the second [latter] case only those records between midnight on 3-4 May and midnight on 14 May were studied. 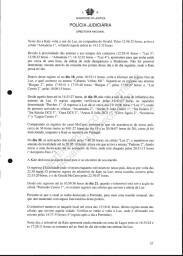 This was done to determine if other investigation theories could arise through the analysis of those data, which [theories] could lead to the discovery of what occurred on the night of 3 May, in apartment 5A, at the "Ocean's Club in Praia da Luz". In this analysis nothing resulted that can add to / change the hypotheses raised in the previous report. In the first phase the records obtained were processed, formatting the data from all tables into a common structure and data-type, namely: times and dates were formatted uniformly; country codes 351 and 44 were removed. 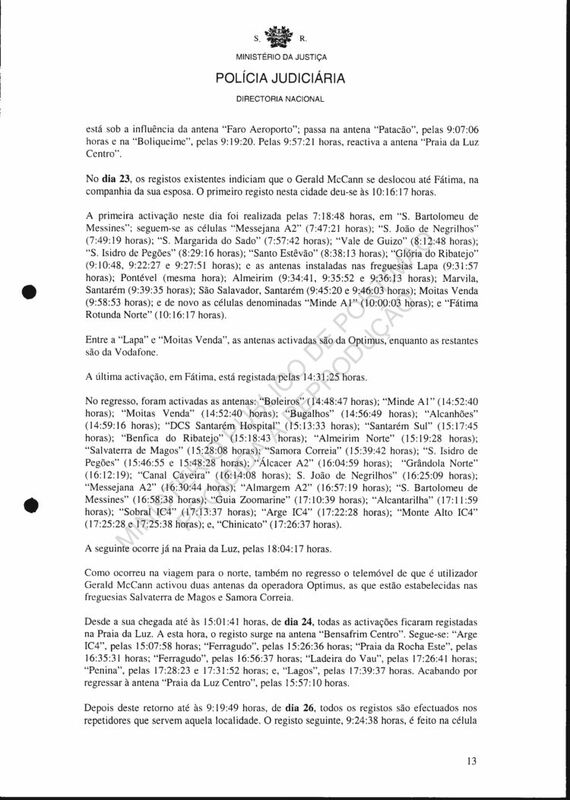 Optimus sent 31 pages of requested mobile phone numbers, separating the contacts by their type - "SMS-in"; "SMS_out"; "voz_in" and "voz_out". In fact, they should have sent only 4 pages [of actual useful data], given that the rest was made up of these extraneous characters. This operator, contrary to the other two, opted to show parish, county and district of the place in which an antenna was located. In those tables it was very frequently noted that those [data] fields (Parish, County and District) are filled with the word "Unknown" (unknown). It was determined that that word identifies an antenna activated in [by] another carrier. For example, in the listing for "44771325####_voz_out" there is a voice call attributed to that number (the mobile phone of Russel O'Brien); on 4 May, at 12:03:33. In the fields in question is the above word. The antenna that the mobile phone of the other party, Kate Healy (44774884####); activates is installed in Portimao, Faro. Now, this communication appears in the listing of Kate's mobile phone and not in Russel's listing. This communication is also registered on the TMN network, where one finds registered the majority of the mobile phone activations of that witness. 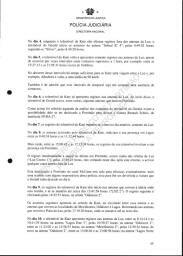 In the records of this operator there are further curious situations that were not possible to explain. In some cases it is unknown which antenna was activated either by the calling mobile phone or by the called device. One example of that arises also in the above list: a record on 20 May at 20:19:45. It is known that Russel was not in our country on that occasion, the record should appear in listings of Kate, however that does not occur. Always when this situation was found it was decided to eliminate those records, due to the fact that they are safeguarded by other operators or because the location of the mobile phone was not so remarkable as to cause interference [distort the analysis] due to erroneous "readings". It was decided therefore to analyse [only] objective and firm [reliable] data. In the case of operator Vodafone errors were found in the data of phone (44)7771591#### - Rachael MARIAMMA JEAN MAMPILLY. The data are repeated in the pages "Cham. Rec. 44777159####" and "SMS Rec. 44777159####". 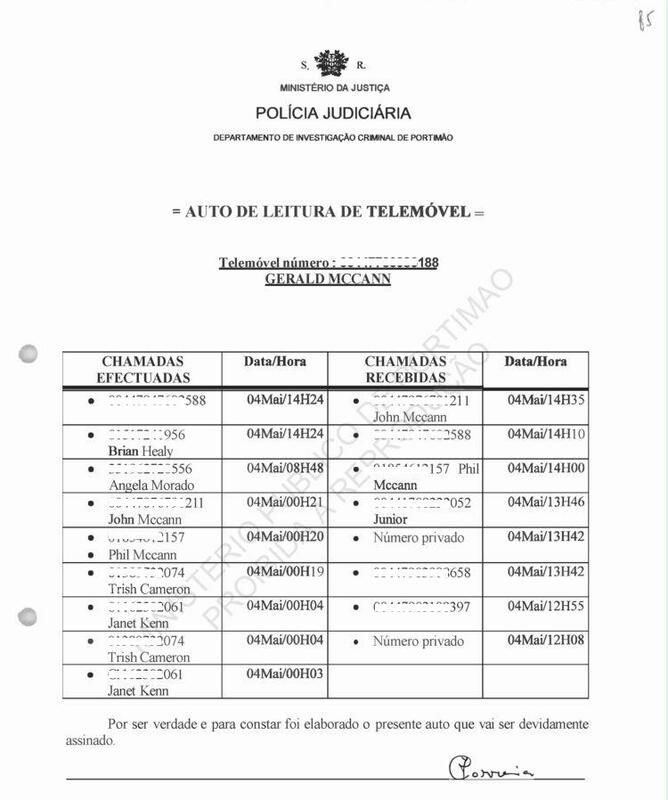 Also in the data provided by this operator are 14 SMS messages received by the mobile phone of Gerald Patrick McCann, sent by the number 4477850####, however in the first listings obtained by the analysts, referring to the activations of the antennae that serve the area from where Madeleine disappeared, for the 2nd to 4th May, those messages had originated from mobile phone number 4478152####. No anomaly was found with respect to the operator TMN. The news database, available to this Police force through the "Intranet" was used whenever possible, to infer the movements of Madeleine's parents, who had become the centre of attention of reporters. 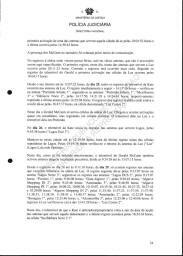 In the same way were used data contained in official police file records that served to confirm some movements of the members of the group, at least in their movement to DIC in Portimao. Whenever the data permitted, they were compared with the records in order to determine if the movements were 'en masse' or individual. We should always remember that this report was prepared based on records from antennae, so it must be borne in mind the possibility of the user of a mobile phone having been in some other place other than those [places] indicated, and of that there would be no record. 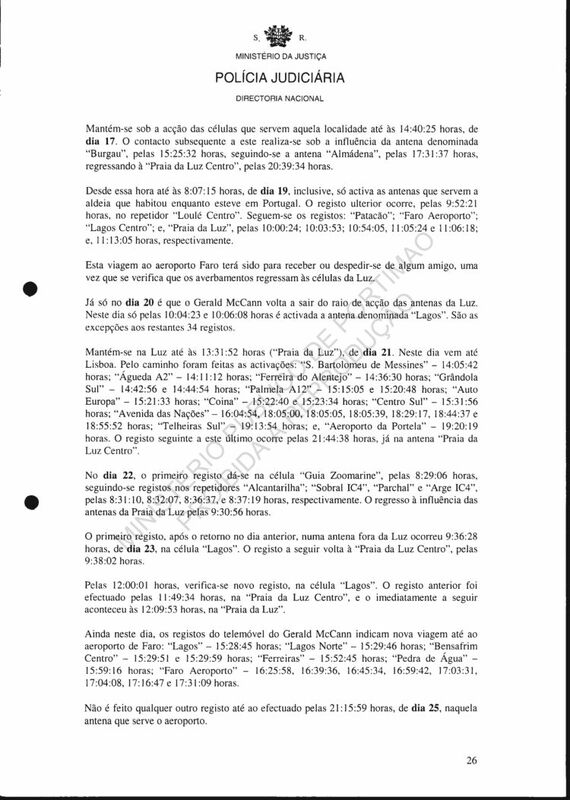 This report is divided into two parts: the first contains the descriptions of the daily records and in the second are the time intervals in which there was no communications from the McCann mobile phones. As regards the identification of the antennae there are two types. Optimus chose to identify the parish where they are installed, while TMN and Vodafone chose to indicate the name they assigned to the antennae. In this case the denominations were respected, without making any changes to them. 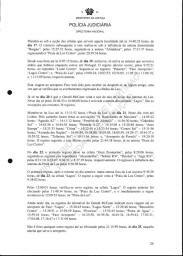 In this report, in the first case the name of the parish is indicated and, in the second case, the antenna name is found between quotes (" "). 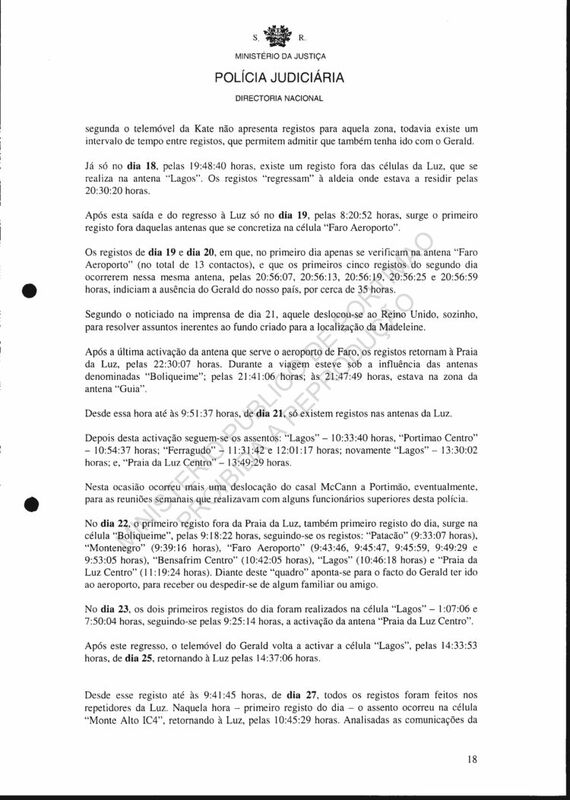 Annexed to the report are maps of the antennae records of the mobile phones mentioned before, maps of the intervals without communications and maps of the locations of the antennae activated, prepared using the computer software Microsoft AutoRoute. In this case, when one antenna, represented by a "pin" was activated more than once, windows containing the times of activation are shown. 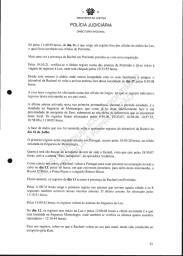 Besides the above, which was based on the analysis of the daily records of the mobile phones of the members of the group, there was also analysed the data of the mobile phones of the parents of Madeleine for the days between 4 and 13 May, to verify intervals of 30 or more minutes without any records. In 30 minutes, according to the Microsoft AutoRoute software, at an average of 70km/h, it is possible to make a round-trip journey between the village of Luz and the localities of: Raposeira, if travelling West; Bensafrim, if travelling North, and Odi?ere if going East. That movement would have produced records only in the antennae that serve Praia da Luz, and thus the absence of any record. Despite the short time after the disappearance, the McCanns already had large media coverage, there having been no other news considered more important by the different media organisations. Thus, it was not possible to access information that was sufficiently clear to prevent raising some questions. In truth, even though this coverage had been exhaustive and intensive, the print media to which they had access did not cover all movements of the McCanns. It is recognized that they could have been "watched" 24 a day, but there had been no official news of that, it being also likely that the reporters had been absent during the night, or had not followed them. This analysis shows that the McCann mobile phones did not activate any antenna during the night time, except for the first two days (4 and 5 May). It is understandable that on 4th there is a large volume of communications traffic during the morning, in the immediately after the disappearance. That is seen more on Kate's mobile than that of Gerald. Nonetheless, there had been two intervals of time in which neither one nor the other generated a single record. Those periods are between 4:15 and 6:00am, and between 7:15 and 7:45am. 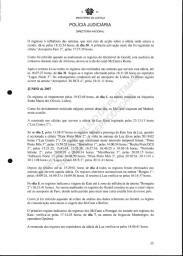 The fact stands out that most of the witnesses who had been there in support of the search for Madeleine, in the first moments after the alert of the disappearance, stated for the record that they had stopped looking for the child around 4:00am, there having been a few who had stopped later and others earlier. Also on 5th, during the early morning the mobile phones of the couple were inactive except for some contacts at around 01:45, but there is a gap without any contacts from either one or other [phone] between 5:00 and 7:00. At that time, at that time of year, there is already enough light for any kind of movement, even within a city, without public lighting. 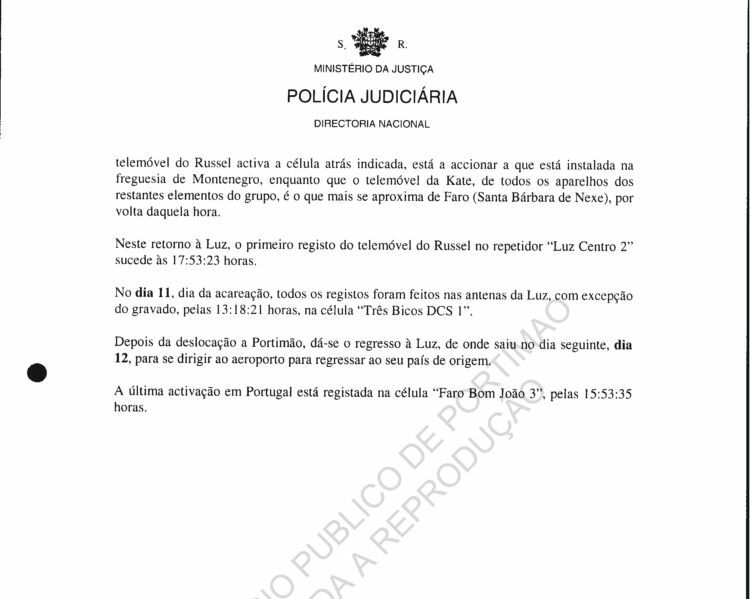 The group that travelled to Portugal, of which the missing child had been part, having faith in the activations of the adults' mobile phones up to the date of the event, travelled only between Faro airport and Praia da Luz. In that period of time a stream of communication traffic had been maintained that can be accepted as normal for anyone who is on vacation. From the 4th until 17 May the mobile phones of those persons, save for some exceptions already mentioned previously, the antennae with the most records of traffic are those that serve the localities of Luz, Lagos, Portimao, and others that are in between Praia da Luz and Portimao. 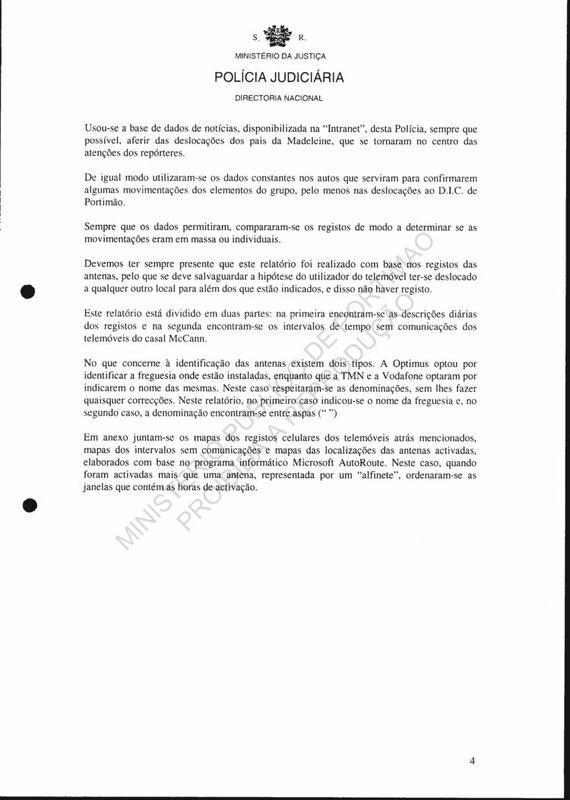 The antennae in Portimao were activated when the people (witnesses and parents of the child) went to the DIC in that city to give their formal statements on 4, 10 and 11 May. With the exception of Matthew, Fiona and Dianne all had gone to or spent time in Lagos from their date of arrival until 17 May; Jane on 4th; Kate on 4th, 9th, 10th, 12th and 14th; Rachael on 10th, 11th and 17th; Gerald on 13th, David on 10th, 12th and 13th, and Russell on 10th. On 17th everyone will have returned to the United Kingdom except the parents of Madeleine and the Payne couple. There is no precise information about Matthew. His mobile phone stops having records from the 16th, but presumably it travelled with his family - wife and daughter - given that Rachael's telecommunications device stops presenting records the next day. As for the Payne couple, the return to their country of origin takes place only on 22 May. 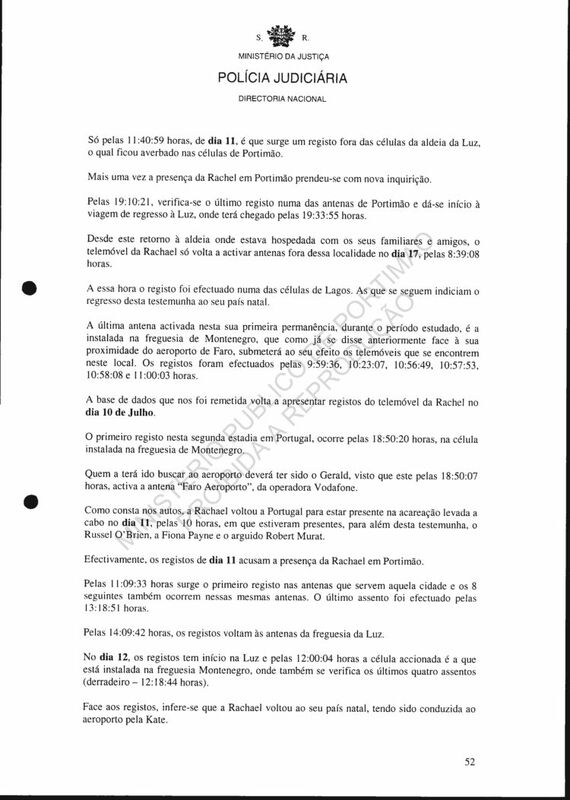 Between 17 and 22 May, there is no change worthy of recording in the activities of the 4 members that remained in Portugal, with the exception of Gerald who travelled, between 20 and 22); as was indicated at the time items concerning this mobile were analysed. Although there are no records of Fiona's mobile phone in this her first stay in Portugal, as she travelled with her husband, it is likely that she had travelled with him. Thus, and as the mobile phone of David presents records up to 22nd, it is worth noting that she had remained by his side. As seen when an analysis was made of contacts of Fiona's mobile phone, there are no records in the period between 28 April and 22 May. 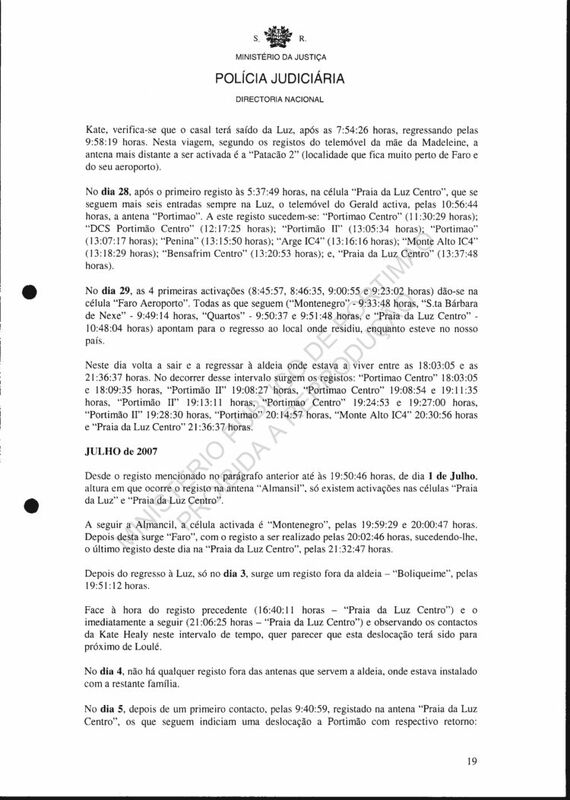 The mobile phone records of this witness only occur between 29 June and 2 July (her 2nd presence in Portugal) and between 10 and 12 July (her 3rd presence). In the period from 23 May to the end of that month, the McCanns had embarked on a campaign that had begun at F?ima on 23 May. Between 29th and 30th, the couple, as already mentioned in the study of both, is absent from our country, having left the by way of Faro airport. 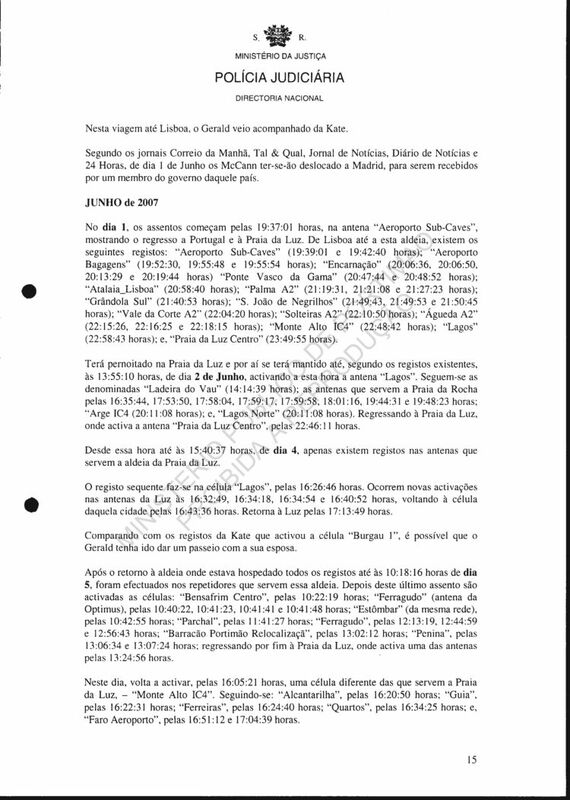 On the last day of the month, the records point to the presence of the McCann couple at Lisbon airport, from where they had departed for another trip. The remaining days of this period were passed between Luz, Lagos and in some locations to the east of Luz. The return trip started on the 31st occurred [finished] on 1 June. In the period between this last day [of May] and 30 June, are records that indicate the presence of the Payne couple, again, in our country. The return occurred on 29th, and this time they remained in Portugal until 2 July. Meanwhile the parents of Madeleine had travelled to various places in the Algarve, namely: Burgau, Sagres, Budens, Portimao, among others, having their "base" at Luz. They went more than once to the airport to receive or to bid farewell to friends and / or relatives. Nor did they always travel in the company of each other, but during this month of June they made two trips out of Portugal, one between 5th and 7th, and another between 10th and 12th. In the period from 1 to 31 July, the McCanns maintain a routine similar to the previous month. They continue to travel between Luz, Portimao, Faro airport, Lagos and other places. Again they left our country: Gerald, the first exit, leaves on 12th, while Kate travels on 13th, but they both return at the same time. The second [exit], only Gerald leaving on 22nd and returns on 26th. From 19th, the McCanns began to move with greater frequency to the triangular area of Sagres- Raposeira-Budens. Still in this month occurs the return of Fiona, Rachael and Russel, on 10th. As already mentioned previously, the three were present in the confrontation with Robert Murat on 11th, leaving on 12th. Between 1 and 31 August the McCanns did not receive any visit from friends with whom they had come to spend holidays. However, they continue to move between different locations in the Algarve. On 3rd they spent the morning in Huelva, and on 21st and 28th they travelled to Lisbon. It is not known what could have done in Lisbon, on those two times. Gerald, in this month is the only one of two who travels by plane. He leaves on 23rd and returns on 25th. The trips continue to the area of the triangle referred to above. In September the McCanns continue to circulate in the area of Luz, Lagos, Budens, Raposeira and other places. 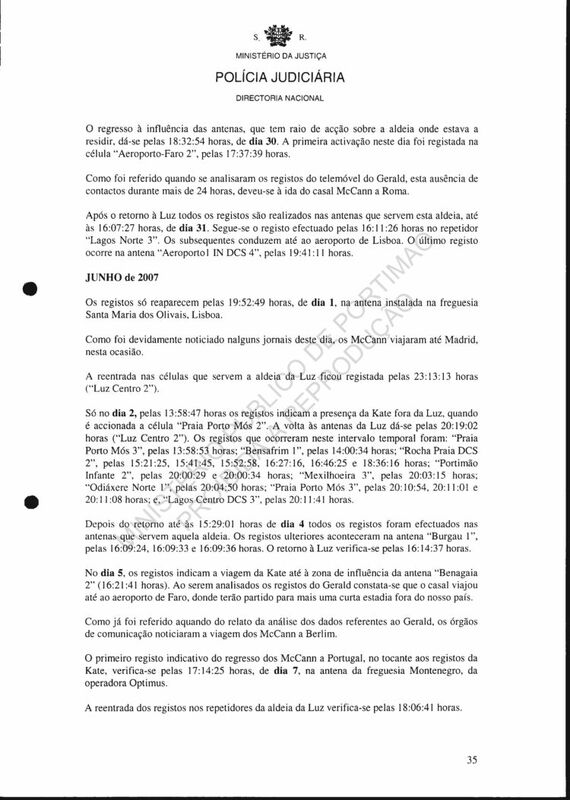 In this month the McCanns were questioned and they left Portugal, the data having stopped from 9th. Summarising, examining the data submitted by the three carriers and data uploaded to the case file nothing useful was determined that changes the analysis report previously delivered. 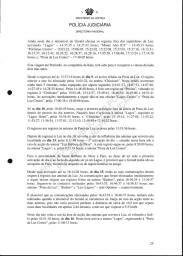 Attached are daily maps of the records of mobile phones by holder / owner, map of the intervals without communication from the couple's equipment between 4 and 13 May, and maps of locations where the antennae were activated, produced by the computer software program "Microsoft AutoRoute ". 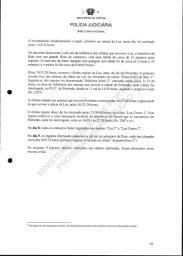 To determine from the various television stations and print media, if the coverage of the activities of the McCann couple occurred for 24 hours a day, and whether, if so, they were followed in the different trips they made. Report pages 5 and 6. Activations of mobile phone (44)774-884-4837; Owned/used by: DAVID ANTHONY PAYNE. Maria) while the latter is on "Luz (Lagos)", both from operator Optimus. long holiday, it activated the antenna "Luz (Lagos)" for the first time. at 8:53:07,9:51:14, 10:16:32 and 10:30:51.
outside of Luz, and the last in that city on this day was at 16:28:15.
return to the Luz antennae is observed. At 12:35:32 on that day [10 May] appears the first record on one of the antennae that serve the city of Lagos, owned by Optimus. [The phone] will have remained in Lagos from that time up to 16:43:39 [inclusive]. The return to the village of Praia da Luz will be observed at 17:28:58 when it activates one of the Optimus antennae at 17:28:58. From that time until 22nd, there exist only records on those antennae. On this day there occur two activations on the antenna installed in the [parish] of Montenegro, municipal area of Faro, at 7:54:13 and 8:03:14. On 29 June, at 12:32: 10, records from this mobile phone reappear [resurge]. mobile phone to activate that location. 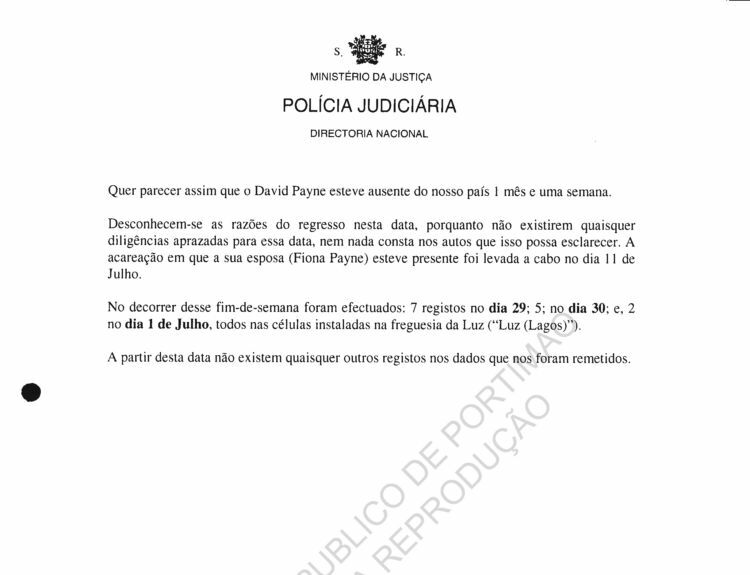 It would appear therefore that David Payne was absent from our country for 1 month and one week. The reason for his return on this date are unknown, since there exist no records of investigation work assigned for that date, nor anything recorded in the case file documents which might clarify it. The confrontation in which his wife (Fiona Payne) was present was [only] carried out on 11 July. During that weekend there were: 7 records on 29th; 5 on 30th; and 2 on 1 July, all on the antennae in the [parish] of Luz ("Luz (Lagos)"). From this date onwards there exist no other records in the data that was sent to us [by the phone operators]. Report pages 7 and 8. This number activates antennae of the operators Optimus and TMN. The first record occurred on 28 April, 2007, her date of arrival in Portugal, at 20:30:50; and the last at 10:23:07 on 17 May. [The phone] only activates the antennae installed in the [parishes] of Luz (Lagos) and Montenegro (Faro), and in the city of Portimao. Up to the date of the disappearance of Madeleine McCann, the tables referring to the mobile phone of Dianne Webster show 5 records, all in Luz. After the disappearance the record of contacts relating to the mobile phone used/owned by Dianne has a strong [heavy] increase in the volume of voice calls and messages. On 4 May, some while after the alert was given, the communication apparatus of this witness activated twice the antenna "Luz (Lagos)", at 0:34:31 and 1:17:17. After this last [record] there only appears a new record at 10:26:04, on that same day, that is, during the "critical night" the mobile phone of Dianne did not have much activity. From that time until 16:32:32 it will have remained in the coverage area of the antennae of Praia da Luz. After that record there appear the last two activations of that day in the city of Portimao (20:19:27 and 21:50:23). 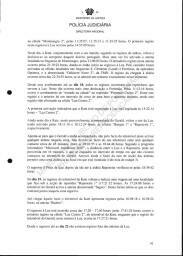 This witness gave statements in the DIC [offices] of Portimao at 20:50:00, see pages 77 ff. 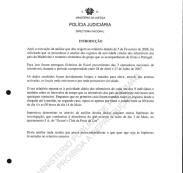 of the case file documents..
From the records mentioned above it can be affirmed, with some reservations, that the first time that Dianne left Praia da Luz since her arrival was to go to the P.J. as part of the inquiry..
After the trip to this city Dianne returned to the place where she had been on holiday in our country, there resurging a new record on the antennae of Luz at 10:11:12 on 5 May. From her return on that day until 11th all records were made on those antennae. On 7 May there exists not a single record, on the other days in this time period there occurs at least one entry. On 11th at 11:13:19 Dianne went again to Portimao, where she remained until 19:03:17. On its return to Praia da Luz [the phone] activates one of the antennae of that locality at 21:34:07..
From that occasion until 17th, the date that she returned to her country there ceasing to exist any more records after that date, the mobile phone of Dianne only activates the repeater "Luz (Lagos)". On that day there were three records: at 8:33:12, 9:22:07 and 10:23:07 on the antenna installed in the [parish] "Montenegro". Report pages 9 and 10. Activations of mobile phone (44)779-627-2586; Owned/used by: FIONA ELAINE PAYNE. - between 15:20:07 on 10 July and 10:50:11 on 12th of the same month. 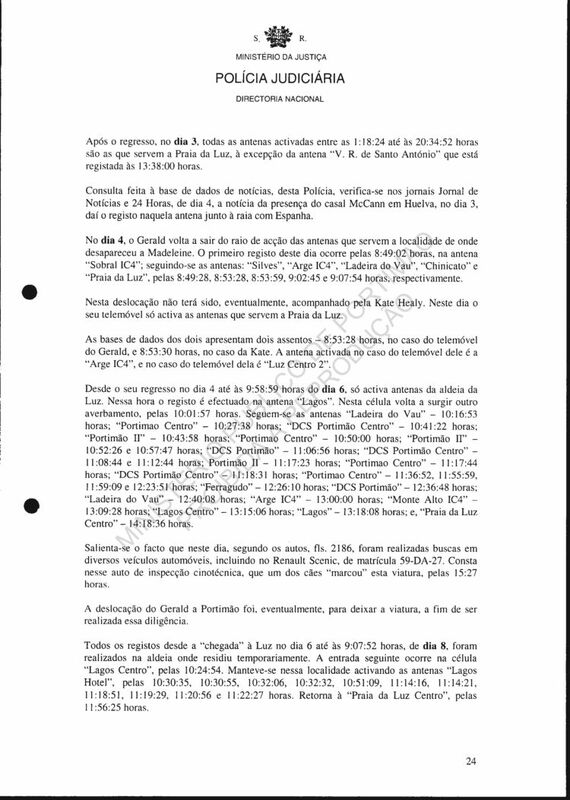 That is, Fiona, by mistake of dates, came with her husband on the weekend of 29 June, for the confrontation with Robert Murat that was scheduled for 11 July, where there were also present Rachael Mampilly and Russel O'Brien, according what is recorded in the case documents, and what was repeated in the dailies CM (Correio da Manha), 24Horas and JN (Jornal de Noticias). The Paynes returned to their native country, after detecting the possible error, Fiona coming back for a third stay in our country between 10 and 12 July. 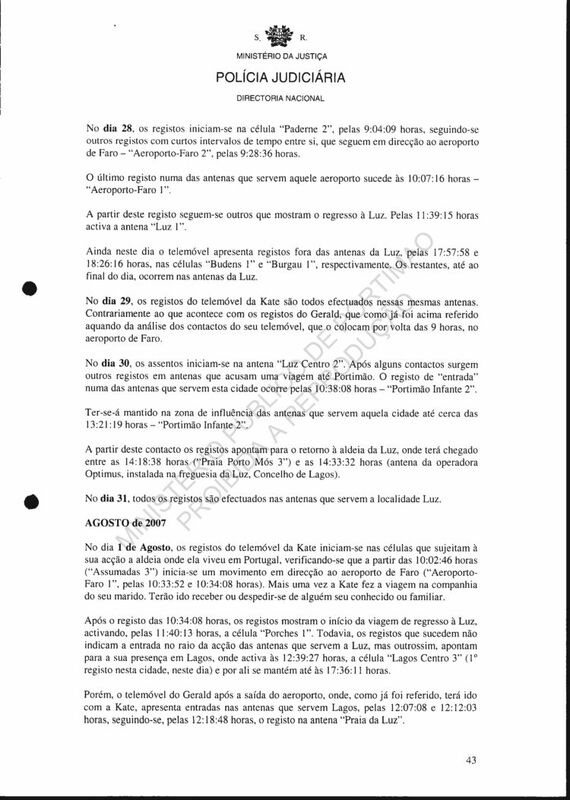 The first three records (8:41:45, 8:41:48 and 8:41:51) on her return to Portugal on the last weekend of June, beginning of July, occurred on the antenna installed in the [parish] of Luz in the municipal area of TAVIRA and not in the [parish] of the same name in the municipal area Lagos. The phone [or She] would have been in transit given that some seconds later (at 8:42:00 and 8:42:03) the antenna at Vila Nova de Cacela registered contacts [from the phone]. On 29th there exists no further record. The next records occurred on 30 June: the first was made at 15:23:33 and the second, and last on this day, at 17:16:57, in Praia da Luz. On 1st, it made no activation, and on 2nd the first record was observed at 6:24:00 on the antenna "Luz (Lagos)". Those that followed indicate [the phone] moved in the direction of the Faro airport. At 7:01:12 and 7:01:17 it activated an antenna in Lagos; about 8 minutes later (at 7:09:10) it activated the antenna "Mexilhoeira Grande"; and at 7:52:24, 8:06:23 and 8:06:25 it is found in Faro airport where it activates the antenna in the [parish] of "Montenegro" (see footnote 1 [on page 5 under D.A.Payne]) Between 2nd and 10th no record is observed. Fiona returns to our country on 10 July, according to what has already been referred to [above], activating, on this second return, at 15:20:07, the last antenna it had activated on 2nd. [Montenegro]. The next record was made in Praia da Luz at 22:49:46. From this record up to 10:46: 17 on 12th it activates only the antennae that serve Luz. At this time it is found that it activated one of the antennae of Lagos, on which antenna occurred two more records - at 10:47:13 and 10:47:29. There follow records made at 10:49:57 and 10:50:11 on the repeater installed in the [parish] of Aljezur, municipal area of Aljezur, district of Faro. Given the existing records before these last [two], in Aljezur, there seems to have occurred an error in the records remitted by the operator Optimus, considering that, according to the computer program Microsoft AutoRoute 2007, Lagos is a distance, in a straight line, of about 26 km from Aljezur, and closer to 34 km by road. To cover this distance in about two and a half minutes one would have to travel at a speed of 816 km/h, which is impossible to be achieved in any terrestrial vehicle produced up to this time. The listing of activations of mobile phone (44)779-627-2586 end with the last record in Aljezur. Activations of the mobile phone (44)778698#### User/Owner: Gerald PATRICK MCCANN. This phone number activates antennae of two operators: Vodafone and Optimus. The first record occurs on 29 April, 2007, at 10:13:54, on the antenna "Praia da Luz Centre" of Vodafone, and the last date of 9 September, at 9:40:42 on antenna "Montenegro" of the same operator. In total this mobile phone generated 5,569 records, of which only 0,36% occur before the girl's disappearance. On 29 April, the mobile phone in question has two records on the antennae of Praia da Luz. On 30th, there are no records. 1 May, also there are no records. From 8:07:12am on 2nd, until 10:11:21am on 4th, it activated only the antennae of the locality where he was staying. On this day [4th], the records show that Gerald travelled to Portimao. The first record of a signal occurred on the antenna "Arge IC4" at 10:42:58am. About 15 minutes later it is activating the antenna "Portimao Centre" - 10:56:07am. The records stay on the Portimao antennae until 18:24:45pm. 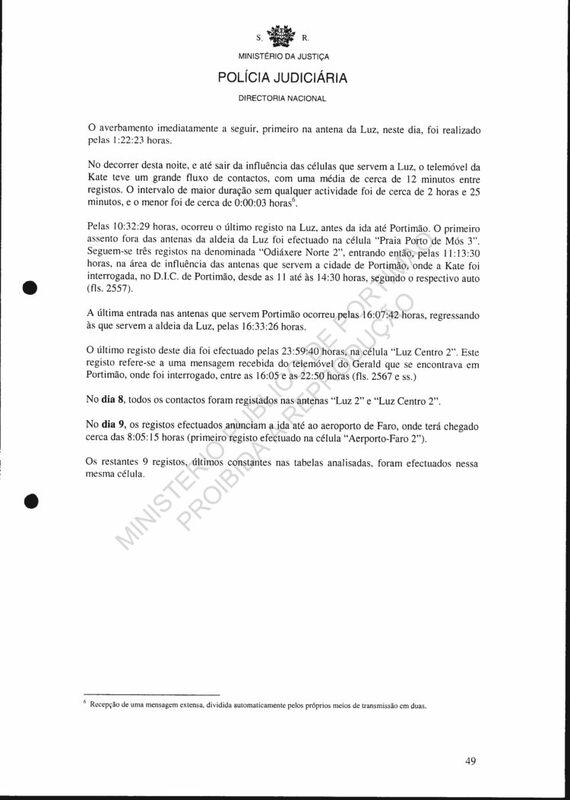 The records returned to Luz at 21:11:22pm, noting that there is an interval without contact between the last entry in Portimao and the first in the village where he was on holiday. From that time until 13:02:08pm on 10th all records were on those antennae. The record that followed this last occurs on the antenna "Portimao Centre" at 14:07:45pm. On this day, in addition to the father of Madeleine, the antennae in Portimao were activated by the child's mother, by Jane Tanner and by Matthew Oldfield. The records remain in Portimao until 2:52:56am on 11th. The return of the records to the repeaters in Luz was given as 7:55:39am on 11th. The records remain with the repeaters of that village until 13:52:29pm on 13th. The activation immediately following was registered at 13:52:42pm on the antenna called "Lagos". Due to its proximity [closeness] to the preceding record, less than 13 seconds (13:52:29); it is difficult to admit that Gerald had actually gone to Lagos, although that may have happened, it being enough to find oneself in an area of transition between the two antennae; or he may not have left Luz, but it had been the antenna? of "Lagos" supporting [accepting] the signal due to the large volume of traffic in the antennae of the village of Luz. At 14:01:04pm the records come back once again to the antennae in Luz. From this return up to 9:42:14am on 18th all activations indicate that Gerald McCann's mobile phone did not leave Praia da Luz - there are no records outside of the antennae that cover the village. The record immediately following was on the antenna "Lagos" at 10:10:24am. Based on information provided by Inspector Jo? Carlos, to whom is distributed the inquiry, family members who came to support the child's parents rented, as early as the first day of their arrival, a motor car; and given the interval of time between the activation prior to that in Lagos (9:42:14) and that immediately following in that city (10:22:55); it is acceptable that Gerald, on that day, had made the round-trip journey. Otherwise, if the car is dismissed, then we have a situation similar to that which led to footnote 2. The return of the records to Luz happened as already indicated at the time of 10:22:55am. It [the phone] only leaves the coverage area of those antennae on 20th. On this day, Gerald McCann went to the airport in Faro: at 19:56:36, l9:58:44 and 20:00:22 he activates antennae in Portimao ("Portimao Centre"); soon after, at 20:16:01, he activates the antenna "Sobral IC4"; then the antenna "Lagoa" at 20:16:51; a new record occurs on "Sobral IC4" at 20:18:03; at 20:24:22 he activates the antenna called "Guia"; coming to activate the antenna "Boliqueime" at 20:26:45 and 20:26:57, followed by the district capital where he activates the following antennae: "Faro Feira Nova" at 20:46:14 and 20:47:19; "Faro CP" at 20:51:13; and "Faro Airport" at 21:03:24, 21:10:18, 21:10:54, 21:11:41 and 21:13:51. According to the morning papers Jornal de Not?ias, 24Horas, Correio da Manha and Publico of 21 May, they had reported that Gerald travelled. In the databases that were sent to us, there were no records for that phone on 21st, they only reappeared on 22nd at 8:53:20 on the last antenna mentioned above [Faro Airport].
? 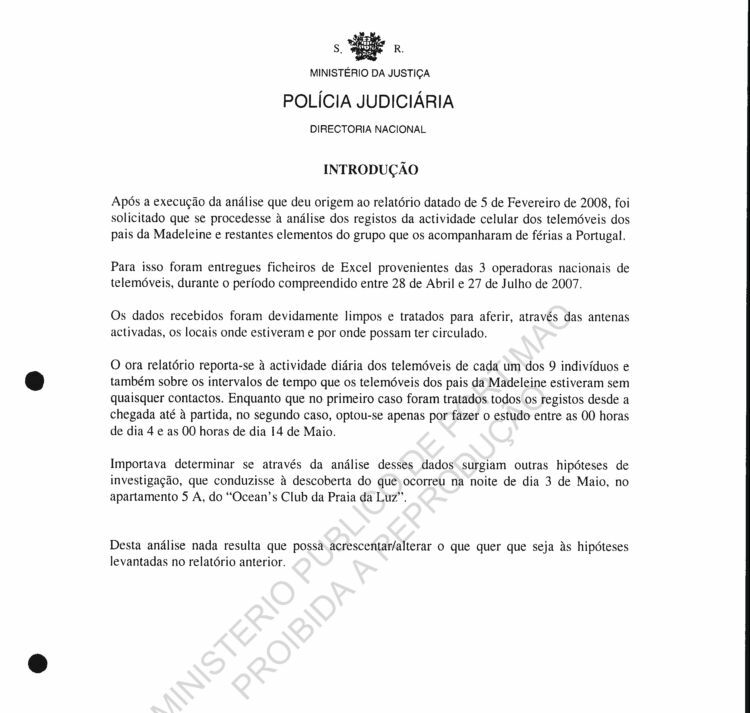 From the contact made with Engineer Sotero, an official of the Police, in DTI, the following explanation was obtained: "Given the proximity of that antenna to the village Praia da Luz, and a period of high volume on the antennae that serve that location, it could have been that the signal was relayed". 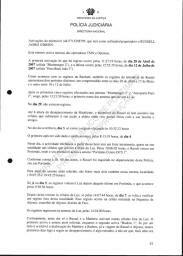 He consulted the database provided by Vodafone, with the indication of the exact positional coordinates of the antennae of that company at the national level, and with recourse to the program AutoRoute. ... under the influence of the antenna "Faro Airport"; he passes the antenna "Patacao" at 9:07:06 and "Boliqueime" at 9:19:20. At 9:57:21 he reactivates the antenna "Praia da Luz Centre". On 23rd, the existing records show that Gerald McCann went to Fatima, in the company of his wife. The first record in this city was given as 10:16:17. The first activation on this day was made at 7:18:48 in "S.Bartolomeu de Messines"; following which the antennae "Messejana A2" (7:47:21); "S.Jo? 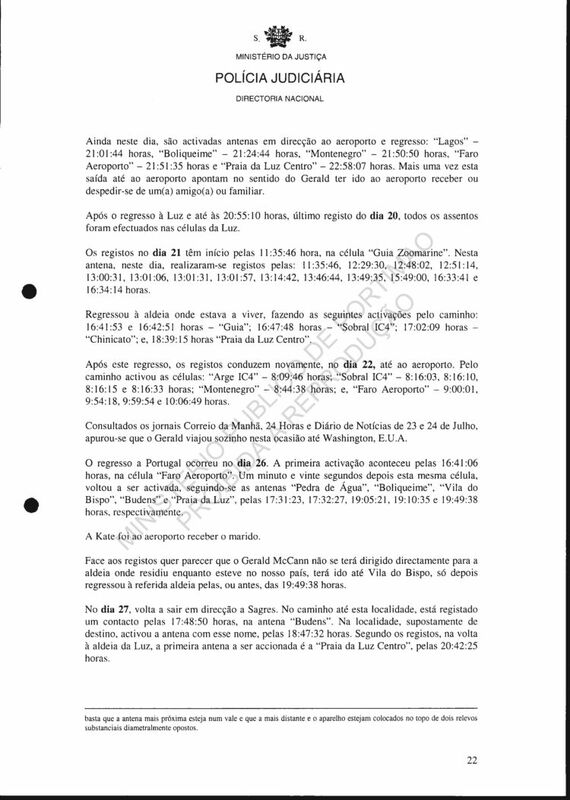 de Negrilhos" (7:49:19); "S.Margarida do Sado" (7:57:42); "Vale de Guizo" (8:12:48); "S.Isidro de Pegoes" (8:29:16); "Santo Estevao" (8:38:13); "Gloria do Ribatejo" (9:10:48, 9:22:27 and 9:27:51); and the antennae installed in the parishes Lapa (9:31:57); Pont?el (same time); Almeirim (9:34:41, 9:35:52 and 9:36:13); Marvila, Santar? (9:39:35); S? Salavador, Santar? (9:45:20 and 9:46:03); Moitas Venda (9:58:53); and again the antennae called "Mindo A1" (10:00:03); and "Fatima Rotunda Norte" (10:16:17). Between "Lapa" and "Moitas Venda" the activated antennae are Optimus, while the remaining are Vodafone. The last activation, in Fatima, is registered at 14:31:25. On the return [journey] the antennae activated were: "Boleiros" (14:48:47); "Mindo A1" (14:52:40); "Moitas Venda" (14:52:40); "Bugalhos" (14:56:49); "Alcanhoes" (14:59:16); "DCS Santar? Hospital" (15:13:33); "Santar? Sul" (15:17:45); "Benfica do Ribatejo" (15:18:43); "Almeirim Norte" (15:19:28); "Salvaterra de Magos" (15:28:08); "Samora Correia" (15:39:42); "S.Isidro de Pegoes" (15:46:55 and 15:48:28); "?cacer A2" (16:04:59); "Grandola Norte" (16:12:19); "Canal Caveira" (16:14:08); "S.Jo? 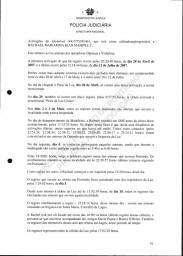 de Negrilhos" (16:25:09); "Messejana A2" (16:30:44); "Almargem A2" (16:57:19); "S.Bartolomeu de Messines" (16:58:38); "Guia Zoomarine" (17:10:39); "Alcantarilha" (17:11:59); "Sobral IC4" (17:13:37); "Arge IC4" (17:22:28); "Monte Alto IC4" (17:25:28 and 17:25:38); and "Chinicato" (17:26:37). The next one occurs already in Praia da Luz, at 18:04:17. As happened in the journey to the north, also in the return the phone used by Gerald McCann activated two Optimus antennae which are established in the parishes Salvaterra de Magos and Samora Correia. From his arrival up to 15:01:41 on 24th all activations were recorded in Praia da Luz. At this time, the record arises on the antenna "Bensafrim Centre". It follows: "Arge IC4" at 15:07:58; "Ferragudo" at 15:26:36; "Praia da Rocha Este" at 16:35:31; "Ferragudo" at 16:56:37; "Ladeira do Vau" at 17:26:41; "Penina" at 17:28:23 and 17:31:52; and "Lagos" at 17:39:37. The return [journey] ended at the antenna "Praia da Luz Centre" at 15:57:10. After this return up to 9:19:49 on 26th all records are made in the repeaters serving that locality. The next record, 9:24:38, is made on the antenna "Lagos". The successive entries, 11 in total, occur on antennae that serve that city. The last registration in Lagos, on that day, is given as 13:07:15. One then observes the return to the village where he was residing with the registration made on the antenna "Praia da Luz Centre" at 14:25:37. In this trip to Lagos Gerald was accompanied by his wife. From this return up to 8:16:05 on 29th all the registrations were made on those antennae. On this day, at 9:16:58, 9:17:06, 9:17:12 and 9:17:19, the antenna that signalled the presence of the mobile phone of the missing girl's father is "Bensafim Centre". Then there are the antennae "Arge IC4" at 9:24:48, 9:24:54 and 9:27:18; "Guia Zoomarine" at 9:36:59; "Guia" at 10:02:55 and 10:11:20; "Algarve Shopping" at 10:16:24, 10:46:57, 10:53:02, 12:02:42 and 12:10:54; "Guia" at 12:14:19, 12:19:45 and 12:21:05. Back in Praia da Luz, the first record there is at 14:23:22. Still on this day, he [again] leaves that location, activating at 15:42:20 the antenna "Lagos" ; at 15:52:23 "Arge IC4" ; at 16:14:55 "Pedra de Agua" ; at 16:16:54 "Quartos"; and at 16:33:45 " Faro Airport". These two trips were made by both parents of Madeleine. The activations only begin to resurge at 17:37:59 on 30th on the same exit antenna. Gerald absented himself from our country, accompanied by Kate, for a period of about 24 hours. According to what was reported in the media, in this time period the McCanns went to Rome, where they attended the homily presided over by Pope Benedict XVI, to whom they had presented a photograph of Madeleine. 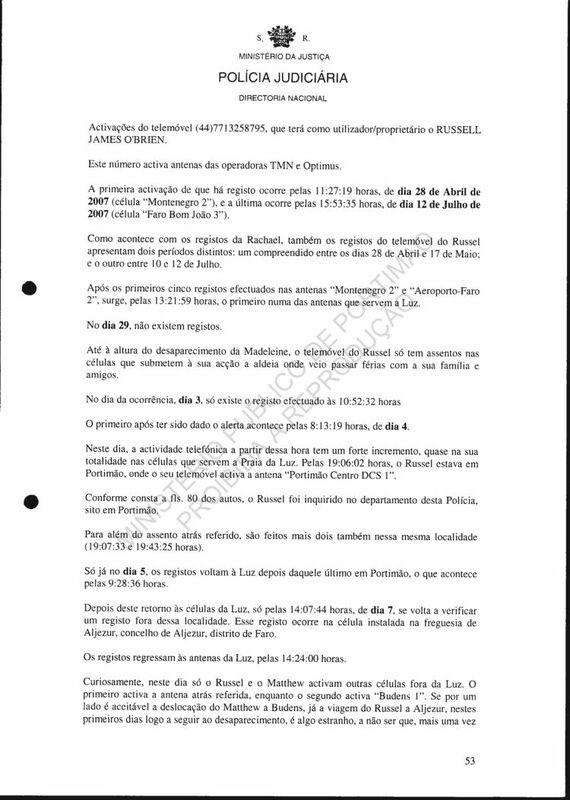 After the registration referred to above on the antenna that serves the Faro airport, the successive records provide information on the journey by Gerald McCann returning to Praia da Luz: "Montenegro" (17:39:42); "Almansil" (17:49:40 and 17:50:10); "Loule Centre" (17:51:57); "Boliqueime" (17:58:10 and 17:59:50); "Ladeira de Vau" (18:13:35); "Arge IC4" (18:17:56); "Monte Alto IC4" (18:22:18); "Bensafrim Centre" (18:24:00); and "Praia da Luz" (20:23:32). From this time until 15:59:58 on 31st [the phone] activates only the antennae of Praia da Luz. After that time, the next record occurred in Lagos at 16:08:06, followed by the antennae "S.Bartolomeu de Messines" (16:42:54); "Solteiras A2" (16:56:04); "Vale da Corte A2" (17:04:51); "Vale de Guizo" (17:44:04); "Atalaia_Lisboa" (18:20:32); "Montijo Centre" (18:22:38); and "Airport Baggage" (19:38:20). On this trip to Lisbon Gerald came accompanied by Kate. 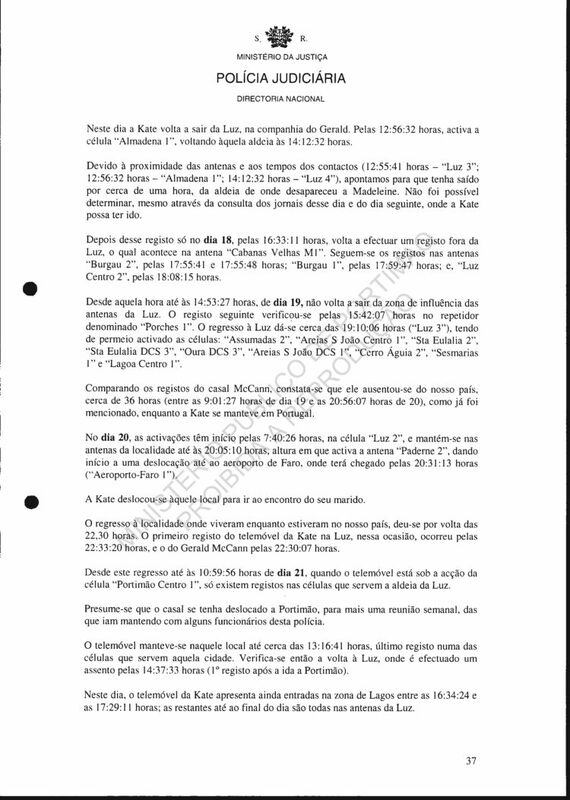 According to the newspapers on 1 June - Correio da Manha, Tal & Qual, Jornal de Noticias, Diario de Noticias and 24Horas - the McCanns had gone to Madrid to be received by a member of the government of that country. On 1st, the records begin at 19:37:01pm on the antenna "Airport Sub-Basement" showing the return to Portugal and to Praia da Luz. From Lisbon to this village there are the following records: "Airport Sub-Basement"(19:39:01 and 19:42:40); "Airport Baggage"(19:52:30, 19:55:48 and 19:55:54); "Encarnacao" (20:06:36, 20:06:50, 20:13:29 and 20:19:44); "Vasco da Gama Bridge" (20:47:44 and 20:48:52); "Atalaia-Lisbon" (20:58:40); "Palma A2" (21:19:31, 21:21:08 and 21:27:23; "Grandola Sul" (21:40:53); "S.Joao de Negrilhos"(21:49:43, 21:49:53 and 21:50:45); "Vale da Corte A2" (22:04:20); "Solteiras A2" (22:10:50); "Agueda A2" (22:15:26, 22:16:25 and 22:18:15); "Monte Alto IC4" (22:48:42); "Lagos" (22:58:43); and "Praia da Luz Centre" (23:49:55). 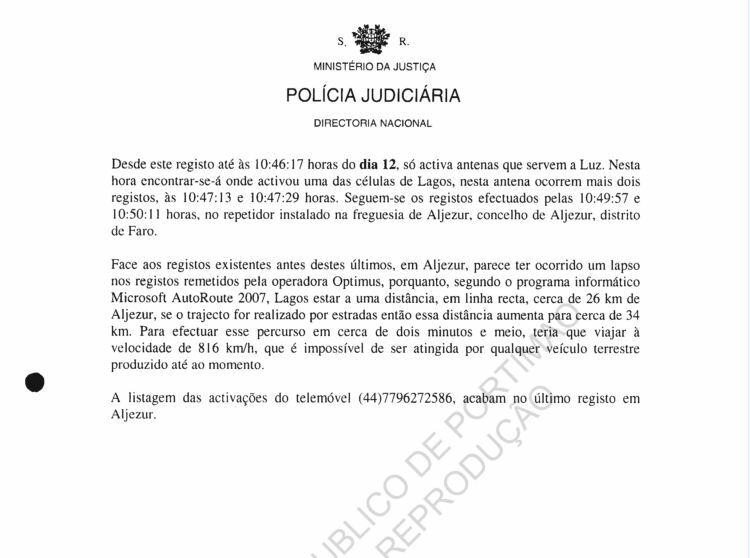 It over-nighted in Praia da Luz and there it remained until, according to the existing records, 13:55:10 on 2 June, activating at this time the antenna "Lagos". There followed "Ladeira do Vau" (14:14:39); the antennae serving Praia da Rocha at 16:35:44, 17:53:50, 17:58:04, 17:59:17, 17:59:58, 18:01:16, 19:44:31 and 19:48:23; "Arge IC4" (20:11:08); and "Lagos Norte" (20:11:08). Returning to Praia da Luz, where it activated antenna "Praia da Luz Centre" at 22:46:11. From that time until 15:40:37 on 4th there are only records from antennae that serve the village of Praia da Luz. The next registration takes place on the antenna "Lagos" at 16:26:46. New activations occur on the antennae of Luz at 16:32:49, 16:34:18, 16:34:54 and 16:40:52, returning to the antenna of that city [Lagos] at 16:43:36. It returns to Luz at 17:13:49. Comparing with the records of Kate that activated the antenna "Burgau I", it is possible that Gerald had gone for a walk with his wife. After returning to the village where he was a guest all the records until 10:18:16am on 5th are made on the repeaters serving that village. After this last entry the [following] antennae are activated: "Bensafrim Centre" at 10:22:19; "Ferragudo" (Optimus antenna) at 10:40:22, 10:41:23, 10:41:41 and 10:41:48; "Estombar" (the same network) at 10:42:55; "Parchal" at 11:41:27; "Ferragudo" at 12:13:19, 12:44:59 and 12:56:43; "Barrac? Portimao Relocaliza?" at 13:02:12; "Penina" at 13:06:34 and 13:07:24; finally returning to Praia da Luz, where it activates on that antennae at 13:24:56. On this day, it starts activating, at 16:05:21, a different antenna that serves Praia da Luz - "Monte Alto IC4". Following that: "Alcantarilha" at 16:20:50; "Guia" at 16:22:31; "Ferreiras" at 16:24:40; "Quartos" at 16:34:25; and "Faro Airport" at 16:51:12 and 17:04:39. There are no records on the 6th; on 7th the records recommence on the antenna "Faro Airport" at 17:12:59. The absence of record was due, according to the media, to the presence of McCann in Berlin during that interval in the records. Returning to Faro, in addition to [the above] entry, there are three more records on that antenna at 17:13:51, 17:13:59 and 17:15:01. Then follows: "Montenegro" at 17:17:56; "S.ta Barbara de Nexe" at 17:25:59, 17:26:15 and 17:26:20; "Quartos" at 17:29:25 and 17:29:46; "Pedra de Agua" at 17:31:59 and 17:37:10; "No Boliqueime" at 17:41:36; "Alcantarilha" at 17:51:09; "Ladeira do Vau" at 17:57:04; "Monte Alto IC4" at 18:04:40; "Bensafrim Centre" at 18:07:09; "Lagos" at 18:08:23 and 18:13:38; then entering the sphere of influence of the antennae of Praia da Luz at 18:25:11. Still on this day [7th], it activates the antenna "Lagos Centre" at 20:13:22, 20:38:07, 20:39:13, 20:39:33, 20:51:04, 21:14:38, 21:27:24, only returning to his temporary residence at 00:05:50am on 8th. 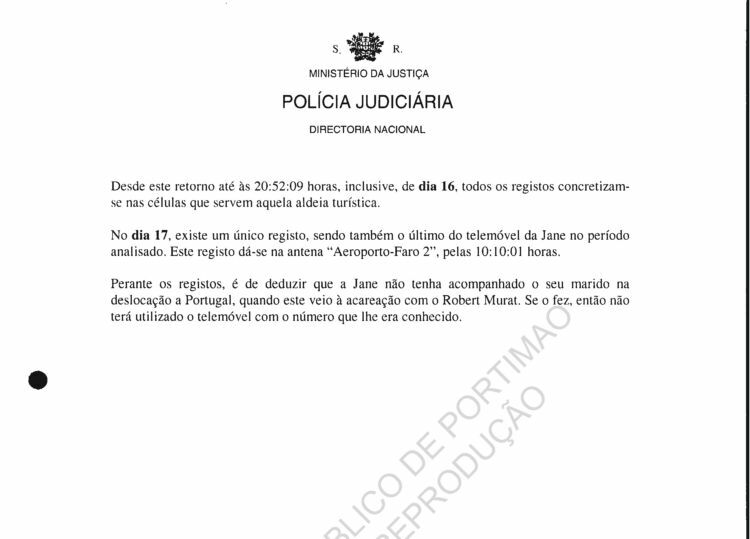 From that entry until 11:24:48 on 9th, all registrations were made on the antennae of Praia da Luz. The next record was made at 14:00:13 on the repeater "Sagres". At 16:28:56 and 16:29:22 it activates the antenna "Budens"; then it returns to the antenna "Praia da Luz" at 16:32:14. Kate also went to Sagres at this time. 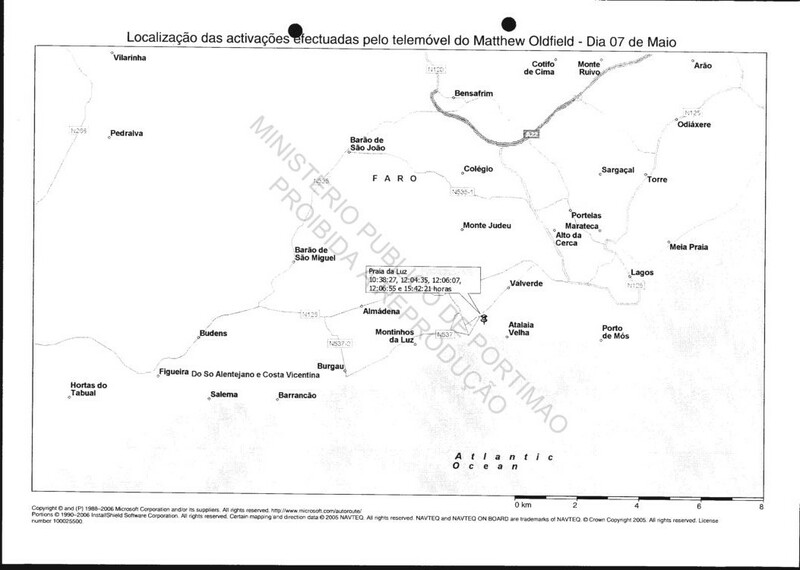 From that time until 16:35:47 on 10th, all activations occurred in the village from where Madeleine disappeared. After that time it appears, from the antennae activated, that there occurred a movement to Lisbon, specifically to the airport. The following antennae were activated: "Lagos" (16:41:35); "Lagoa" (16:59:10); "S. Bartolomeu de Messines" (17:18:24); "Almargem A2" (17:19:12); "Cerro Gordo A2" (17:33:10); "Panoias" (17:39:42, 17:41:13 and 17:42:06); "Grandola South" (18:00:09); "Vasco da Gama Bridge" (19:01:49); "Airport Luggage" (19:50:01 and 20:03:34) and "Airport (Terminal) Indoor" (20:48:10 and 20:49:17). On 11th no record exists. 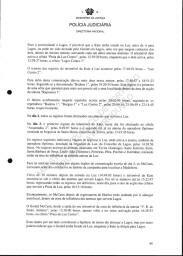 On 12th the newspapers Jornal de Notcias, Publico, Correio da Manha and 24Horas reported the movement of McCann to Morocco, where they were received by a member of the government of that country. On returning to Portugal the first record is shown on the antenna "Montijo Centre" at 16:31:36 followed by several antennae to the town where they were "located": "Pinhal Novo" (16:38:56); "Palmela_II" (16:42:14); "Palma A2" (16:54:36); "Alcacer A2" (17:02:13); "Solteiras A2" (17:50:03 and 17:50:10); "?ueda A2" (17:52:10); "Alcantarilha" (18:11:36); "Sobral IC4" (18:12:29); "Monte Alto IC4" (18:23:36); and "Praia da Luz" (18:47:32). After the return, [the phone] only came out of Praia da Luz at 10:29:24 on 13th, the time at which it activated the antenna "Lagos" moving up to Portimao. For that round trip to Praia da Luz there exist the following records: "Lagos" (10:31:00, 10:32:42 and 10:38:10); "Monte Alto IC4" (10:38:38); "Portimao Centre" (11:07:09 and 12:13:23); "Ferragudo" 12:14:23 and 12:16:26); "Est?bar" (12:17:08); "Ferragudo" (12:24:03); "Portimao Centre" (12:28:05); "Ferragudo" (12:30:21, 12:30:58, 12:34:04 and 12:41:01); "Parchal" (12:44:18); "Ferragudo" 12:52:41, 12:53:29 and 13:02:20); "Portimao Centre" (13:03:40); "Ferragudo" (13:04:25, 13:05:40, 13:06:36, 13:07:05, 13:08:37, 13:09:05, 13:09:18, 13:09:24, 13:11:20, 13:16:10, 13:24:26 and 13:47:13); "Portimao II" (13:55:44); "Arge IC4" (14:02:18); and "Praia da Luz Centre" (14:22:21). 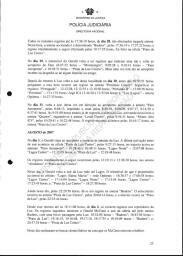 The following day, 14th, the mobile phone of Gerald McCann has its next record on the antenna "Lagos" at 08:17:08, the city where this witness will have passed on his way to the airport in Faro, seeing that at 8:20:31 and 8:21:15 it having activated the antenna called "Lagos Norte" and subsequently activating the antennae: "Lagos Centre" at 08:21:15; "Bensafrim Centre" at 08:24:05; "Praia da Luz" at 8:27:47; "Arge IC 4" at 8:30:49; "Sobral IC4" at 8:40:46; "Loul?Centre" at 8:58:38 and 8:58:44, "Patac?" at 9:11:07; "Faro Airport" at 9:29:21; "Arge IC4" at 10:34:00; "Lagos" at 10:50:07 and 10:50:13; and "Praia da Luz Centre" at 11:09:17. Gerald, together with Kate, will have gone to the airport to meet or to bid farewell to someone, given that the records point to their remaining in Portugal. After the return to Praia da Luz, at that hour, the phone of Gerald only came to produce one record outside the antennae that serve the village Praia da Luz on 15th at 9:28:14 when an activation occurs on antenna "Lagos ". 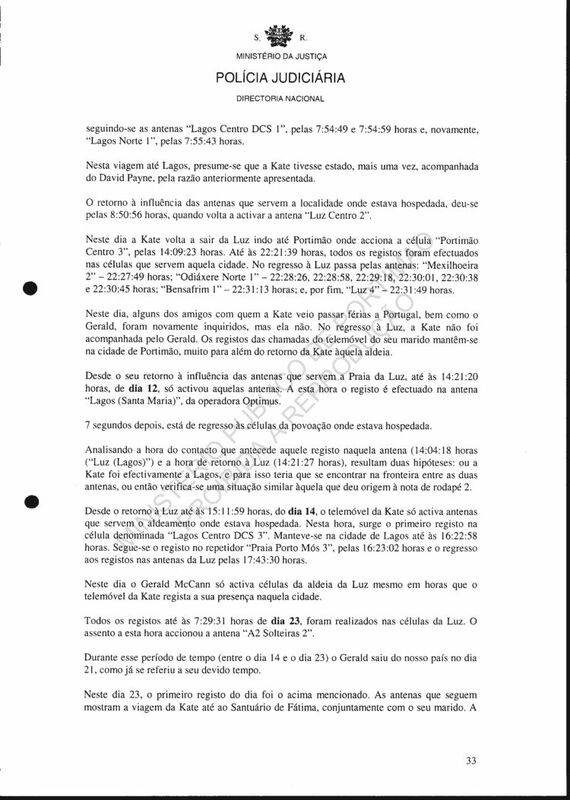 Although the phone records of Kate did not activate any antenna outside Luz, on this day it shows a gap in [the time of the records] around that time [from 9:07 to 9:28] that makes it possible that she had gone with her husband to Lagos. [His] records return to the village at 9:48:23. The records on 16th begin at 8:54.06 on the repeater "Faro Airport" where [the phone] stays also registering at 8:58:48, 9:00:43 and 9:03:49. Those [records] are followed by the antennae "Almansil" at 10:10:54, "No Boliqueime" at 10:21:25, and "Praia da Luz" at 12:36:14. Once again on this trip to the airport Gerald came in the company of his wife. On this day Gerald's mobile phone, after returning to Praia da Luz, activates two antennae outside this town: "Almadena" at 12:58:44, and "Bensafrim Centre" at 15:14:59 and 15:30:36. These activations correspond to [two] distinct [separate] exits. In the first, Kate will have accompanied him because [her phone] also activates the same antenna [Almadena], returning to Luz. In the second, Kate's phone shows no records for that area [Bensafrim], however there is a large interval of time between [her phone] records, which also allows one to say that she had gone with Gerald. Already only on 18th at 19:48:40 a record exists outside the antennae of Luz, on the antenna of "Lagos". The records "return" to the village where he was living at 20:30:20. After this exit and return to Luz the first registration on 19th at 8:20:52 was made outside those antennae, specifically on the antenna "Faro Airport". The records of 19th and 20th, the first of which on the first day [19th] occur only on the antenna "Faro Airport" (a total of 13 times), and the first five records of the second day occur on the same antenna at 20:56:07, 20:56:13, 20::56:19, 20:56:25 and 20:56:59, indicate the absence of Gerald from our country for about 35 hours. According to what was reported in the press on 21st, he travelled to the United Kingdom, alone, to resolve issues inherent in the fund created to find Madeleine. After the last activation of the antenna that serves Faro airport, the records return to Praia da Luz at 22:30:07. During the trip he was under the influence [came within range] of the antennae called "Boliqueime" at 21:41:06; [and] at 21:47:49 he was in the area of the antenna "Guia". From that time up to 9:51:37 on 21st records exist only on the antennae of Luz. This activation record is followed by: "Lagos" - 10:33:40; "Portimao Centre" - 10:54:37; "Ferragudo" - 11:31:42 and 12:01:17; "Lagos" again - 13:30:02; and "Praia da Luz Centre" - 13:49:29. On this occasion occurred another movement of the McCann couple to Portimao, possibly, for [one of] the weekly meetings they had with some senior officials of the police. On 22nd, the first record outside of Praia da Luz, also the first record of the day, is on antenna "Boliqueime" at 9:18:22, followed by the records: "Patacao" (9:33:07); "Montenegro" (9:39:16); "Faro Airport" (9:43:46, 9:45:47, 9:45:59, 9:49:29 and 9:53:05) ; "Bensafrim Centre" (10:42:05); "Lagos" (10:46:18) and "Praia da Luz Centre" (11:19:24). It is suggested that this "window" points to the fact of Gerald having gone to the airport to receive or to bid farewell to some relative or friend. On 23rd, the first two records of the day were made on the antenna "Lagos" - 1:07:06 and 7:50:04, followed at 9:25:14 by the activation of the antenna "Praia da Luz Centre". After this return, Gerald's phone comes back to activate the antenna "Lagos" at 14:33:53 on 25th, returning to Luz at 14:37:06. From that record up to 9:41:45 on 27th all records were made on the repeaters of Luz. At that time - the first record of the day - the entry occurred on the antenna "Monte Alto IC4" returning to the Luz at 10:45:29. Kate's records being analysed, it appears that the couple have left Luz, after 7:54:26, returning at 9:58:19. On this trip, according to phone records of the mother of Madeleine, the most distant antenna to be activated is "Patac? 2" (a locality very close to Faro and its airport). On 28th, after the first record at 5:37:49 on the antenna "Praia da Luz Centre" following which were six more entries in Luz, Gerald's phone activates, at 10:56:44, the antenna "Portimao". This record is succeeded by: "Portimao Centre" (11:30:29); "DCS Portimao Centre" (12:17:25); "Portimao II" (13:05:34); "Portimao" (13:07:17); "Penina" (13:15:50); "Arge IC4" (13:16:16); "Monte Alto IC4" (13:18:29); "Bensafrim Centre"(13:20:53); and "Praia da Luz Centre" (13:37:48). On 29th, the first 4 activations (8:45:57, 8:46:35, 9:00:55 and 9:23:02) are on antenna "Faro Airport". All that follow ("Montenegro" - 9:33:48; "S.ta Barbara de Nexe" - 9:49:14; "Quartos" - 9:50:37 and 9:51:48; "Praia da Luz Centre" - 10:48:04) point to the return to the place where he resided while he was in our country. On this day [the phone] leaves and returns to the village where he was living between 18:03:05 and 21:36:37. During this time period are the records: "Portimao Centre" 18:03:05 and 18:09:35; "Portimao II" 19:08:27; "Portimao Centre" 19:08:54 and 19:11:35; "Portimao II" 19:13:11; "Portimao Centre" 19:24:53 and 19:27:00; "Portimao II" 19:28:30; "Portimao" 20:14:57; ;"Monte Alto IC4" 20:30:56 and "Praia da Luz Centre" 21:36:37. 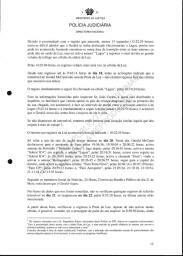 From the record mentioned in the previous paragraph up to 19:50:46 on 1 July, the time at which the record occurs on the antenna "Almansil", the only activations are on the antennae of "Praia da Luz" and "Praia da Luz Centre". Following Almancil, the antenna activated is "Montenegro" at 19:59:29 and 20:00:47. After this comes "Faro" with registration being done at 20:02:46, succeeding which is the last record of the day on "Praia da Luz Centre" at 21:32:47. After returning to Luz, only on 3rd is there a record outside the village - "Boliqueime" at 19:51:12. 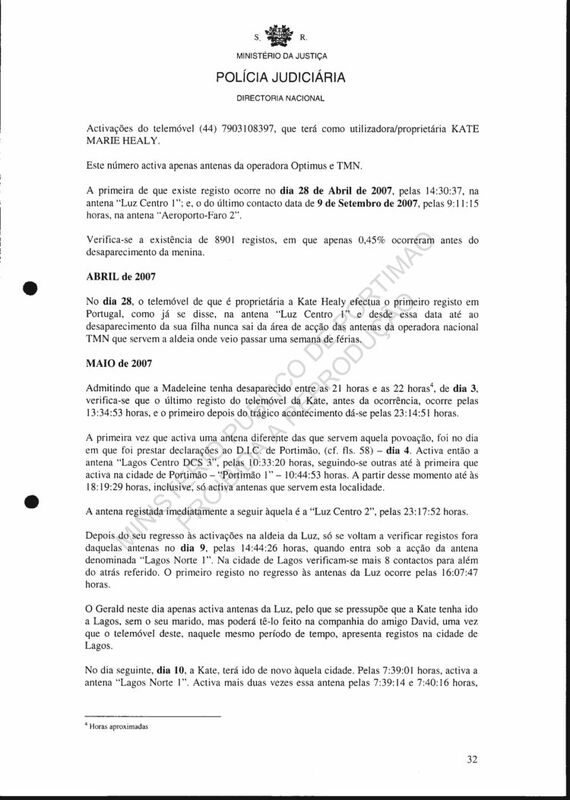 Given the time of the previous record (16:40:11 - "Praia da Luz Centre") and the one immediately afterwards (21:06:25 - "Praia da Luz Centre") and observing the contacts [records] of Kate Healy during this period of time, it would appear [seem] that this trip will have been near/close to Loule. On 4th, there is no record outside the antennae that serve the village, where he was placed with the rest of the family. On 5th, after a first contact at 9:40:59, recorded on the antenna "Praia da Luz Centre,", those that follow show a trip to and from Portimao: 10:42:10 - "Arge IC4"; 10:50:03 and 10:50:08 - "Portimao Centre"; 11:00:59 - "Ferragudo"; 11:22:53 and 11:22:59 - "Portimao Centre"; 12:00:33 - "Ferragudo"; 12:46:45 and 12:46:52 - "Arge IC4" and 13:15:04 - "Praia da Luz Centre". 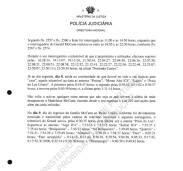 According to the newspaper Correio da Manh?of 6th, the McCann had on that day, 5th, met [held a meeting] with officers of the Judicial Police. After the return to Luz, the phone of Gerald only came back to activate another antenna outside that area on 7th at 11:40:15. This record was made on the antenna "Guia" followed by "Algarve Shopping" at 13:13:50, and the return to "Praia da Luz Centre" at 14:37:05. Coming back to make a sally on 8th, activating at 17:10:13 "Praia da Oura". After this record there follow the records: 17:31:55 - "Sobral IC4"; 17:39:43, 19:38:37, 21:56:23, 22:01:30 and 22:03:05 - "Lagoa"; and 22:13:40 - "Monte Alto IC4". The return of records at Praia da Luz occurs at 22:33:36. From this return until 10th [the phone] does not leave Luz. On this day at 18:10:56 it activates the repeater "Penina" After this record those subsequent [records] indicate one more journey to and from the airport: "Lagoa" at 18:17:31; "Faro Airport" at 18:50:07; ;"Lagos Centre" at 19:46:05; and "Praia da Luz Centre" at 19:54:26. Possibly, this movement is linked to the presence of friends - Rachael Mampilly, Fiona Payne and Russell O'Brien - in the confrontation with Robert Murat, timed for and held on 11th at 10am as recorded in the official documents at pages 1957 ff. in the case file. Subsequent to the return to Praia da Luz, and up to 8:49:09 of 12th, only the antennae in that locality were activated. At the time indicated in the preceding paragraph, the first record of the day, the antenna that signals the presence of the phone of this individual is "Monte Alto IC4". The records that follow indicate a trip to the airport in Faro: 9:32:08 - "Montenegro"; 9:37:42 and 9:39:43 - "Faro Airport"; 9:41:29 - "Montenegro"; and "Faro Airport" - 9:41:29, 9:42:13, 9:44:10, 9:45:15, 9:45:43, 9:46:27, 9:50:30, 9:51:24 and 9:58:43. Error in report: The record at 09:41:29 is only on the Montenegro antenna, not Faro Airport. No observable return to Praia da Luz points to one more journey by Gerry. 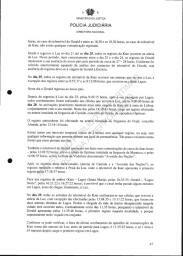 According to the morning newspapers of 14th and 15th, namely "24Horas", "Correio da Manha; and "Diario de Noticias" it was reported that the father of the child had gone to the United Kingdom. From the news in 24Horas on 17th, Kate and the twins were also in the United Kingdom on that occasion, however, and bearing in mind the communication of the mobile phones of both, they will not have gone all together. Kate and youngest children will have left on 13th. On 15th one can observe the return of both to our country. The first record at this point was on the antenna "Concentracao Motards em Faro" at 11:33:51 and 11:34:46. The subsequent records up to the return to the antennae of Praia da Luz, are: 11:36:40 - "Faro"; 11:37:14, 11:37:50, 11:38:41 and 11:39:21 - "Patac? "; 11:44:02 - "Almansil"; and 12:28:22 - "Praia da Luz Centre". [Still] On this day Gerald comes back to leave in the direction of the Faro airport, activating the following antennae: 20:21:37 - "Arge IC4"; 21:01:19 and 21:09:06 - "Montenegro"; and 21:15:04 - "Faro Airport". From the activation records of Kate's phone she also had gone to the airport by 21:15:12, having activated at this time the Optimus antenna installed in the parish of Montenegro, Faro. The return of the records of that phone to the antennae of Luz occurs at 22:34:52. So, accepting that the two had gone to the airport together, the return on this day was around this time. Only at 10:21:43 on 16th, does a new record appear on the antennae of the village where he was living, and from that time up to 9:55:34 on 17th all entries indicate [the phone's] presence in that locality. At this time occurs the first record of the day, and it appears on antenna "Lagos". The records return to the village of Luz at 10:27:57. From this time until 9:35:35 on 18th, all entries existing in that time period were made on the antennae of Luz. The next record made at 10:22:42 in Lagos and about 5 minutes later (10:27:27) the record occurs on antenna "Bensafrim Centre". Combining these records with those of Kate this movement between antennae is due to one more trip to Portimao. The records come to indicate the presence of Gerald in Luz at 14:23:01. After this return, Gerald's phone comes to activate antennae of Lagos at 11:28:35, 11:38:29 and 11:46:24 on 19th. Ending up by returning to antenna "Praia da Luz" at 11:49:28. On this day it leaves this time in the direction of Sagres, activating on the way the antenna "Budens" at 16:58:18 and 16:58:22. At 17:24:08 one sees the record on antenna "Sagres". It returns to Praia da Luz where, at 17:27:21, it receives a signal from the antenna called "Praia da Luz Centre". It should be noted that these two records deserve very close attention. The time interval of 3 minutes would mean that Gerald would be obliged to travel the 27,5 Km that separate Sagres and Luz at a speed exceeding 250 km/h. Given the time of day and time of year, we can assume that there was some traffic on the road, which would preclude such speeds. Against this background, there would appear to have been, perhaps, errors in the records submitted by Vodafone. After that return to the village of Luz, a new record comes up on the antenna "Budens" at 18:18:57, but given the difference between this record and the previous record (18:17:28 - "Praia da Luz Centre") of barely 1 minute and 29 seconds, it cannot be viable to travel about 10.5 km in that period of time. To do so one would have to travel at a speed of 420 km/h. There is still an hypothesis of being at the extreme edge of the coverage area of the antennae? and to get from one to the other during that period of time.
? According to Engineer Sotero the coverage area of the antennae will vary, depending on the morphology of the terrain, the existence of obstacles (buildings, trees, etc.). However, the standard coverage area of antennae installed in cities or villages having enough inhabitants is about 1.5 kilometres, and outside those localities it is about 5 to 8 km. There can also be situations in which a mobile phone receives a signal from an antenna located at a distance greater, as opposed to that nearest to it. For that it is enough that the nearest antenna is in a valley and that the more distant antenna and the apparatus [mobile phone] are both on top of a substantial ground elevation diametrically opposite each other. Still on this day [19th] are activated antennae going to and returning from the airport: "Lagos" - 21:01:44; "Boliqueime" - 21:24:44; "Montenegro" - 21:50:50; "Faro Airport "- 21:51:35 and "Praia da Luz Centre" - 22:58:07. Once again this exit to the airport points to Gerald having gone to the airport to receive or to bid farewell to a friend or a relative. After the return to Luz and up to 20:55:10, the last record of the day on 20th, all entries were made on the antennae of Luz. The records on 21st start at 11:35:46 on antenna "Guia Zoomarine". On this antenna, on this day, records had been recorded at: 11:35:46, 12:29:30, 12:48:02, 12:51:14, 13:00:31, 13:01:06, 13:01:31, 13:01:57, 13:14:42, 13:46:44, 13:49:35, 15:49:00, 16:33:41 and 16:34:14. It returned to the village where [GM] was living, making the following activations on the way: 16:41:53 and 16:42:51 - "Guia"; 16:47:48 - "Sobral IC4"; 17:02:09 - "Chinicato" and 18:39:15 "Praia da Luz Centre". After this return the records lead again, on 22nd, to the airport. On the way it activated the antennae: "Arge IC4" - 8:09:46; "Sobral IC4" - 8:16:03, 8:16:10, 8:16:15 and 8:16:33; "Montenegro" - 8:44:38; and "Faro Airport" - 9:00:01, 9:54:18, 9:59:54 and 10:06:49. The newspapers Correio da Manha 24Horas and Diraio de Noticias being consulted on 23 and 24 July, it was found that Gerald travelled alone on this occasion to Washington, USA. The return to Portugal occurred on 26th. The first activation happened at 16:41:06 on the antenna "Faro Airport". One minute and twenty seconds later the same antenna came to be activated, being followed by the antennae: "Pedra de ?ua"; "Boliqueime"; "Vila do Bispo"; "Budens" and "Praia da Luz" at 17:31:23, 17:32:27, 19:05:21, 19:10:35 and 19:49:38, respectively. Kate went to the airport to meet her husband. 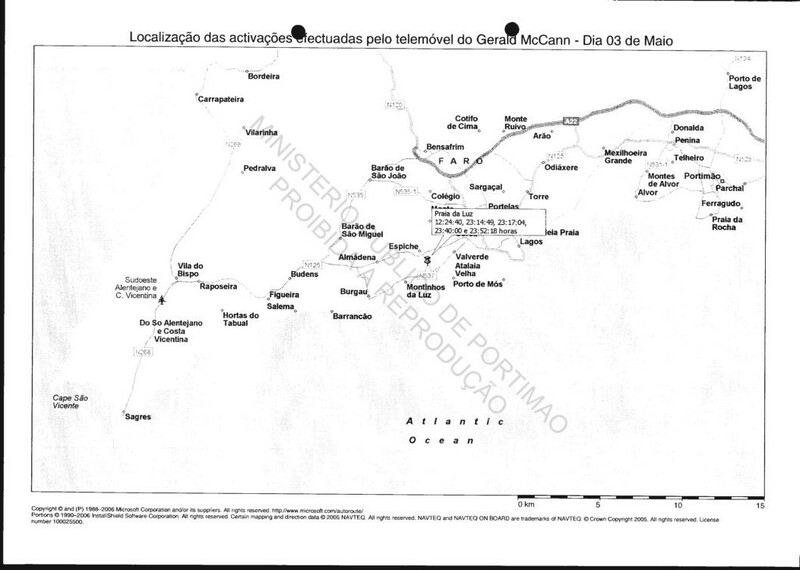 Given the [above] records it would seem that Gerald McCann will not have gone directly to the village where he resided while he was in our country, having gone to Vila do Bispo, only then he returned to the referred village at, or before 19:49:38. On 27th [the phone] leaves in the direction of Sagres. On the way to this town a contact is registered at 17:48:50 with the antenna "Budens". In the locality, supposedly the destination, it activated the antenna with that name [Sagres] at 18:47:32. According to the records it comes back to the village of Luz, the first antenna being activated is "Praia da Luz Centre" at 20:42:25. All other records until 17:36:19 on 28th are made on that antenna. At this time the antenna activated is called "Budens" at 17:36:19 and 17:37:22, the registration immediately after which at 19:17:55 was made on antenna "Praia da Luz Centre". On 29th, the phone of Gerald comes back having records that indicate a round trip to the airport in Faro (8:47:22 - "Montenegro", 9:05:28 and 9:10:41 - "Faro Airport", and 10:38:31 - "Praia da Luz Centre)". Once again he will have gone to the airport to receive or to bid farewell to some family member or friend. After the return to Luz it again leaves the locality on 30th before 10:50:51, because at this time there occurs a record on antenna "Portimao Centre". Following which are the records: "Ferragudo" - 12:12:28, 12:12:35 and 12:18:50; "Portimao II" - 13:08:56; "Portimao" - 13:11:51; "Arge IC4" 13:44, 28 and 13:52:04; and "Luz (Lagos)" - Optimus antenna - 14:27:33. On 31st it again leaves, this time towards the airport, activating the antenna "Faro Airport" at 8:48:13, repeating the signal at 8:59:39, 9:00:09, 9:07:17, 9:14:50 and 9:37:41. At 9:51:00 it would be already returning to the village of Luz, this time activating the antenna "Quartos" followed by the antenna "Loul?Centre" at 9:54:31, "Monte Alto IC4" at 10:20:41 and 10:22:48. The next record is at 10:44:17, on the antenna "Praia da Luz Centre." On 1st Gerald travels to the airport and returns to the antennae of Luz. The last activation before leaving happens on antenna "Praia da Luz Centre" at 9:27:13, along the route it activates antennae: "Faro Airport" - 10:28:48 and 10:49:11; "Lagos Norte" - 12:07:08; "Lagos Centre" - 12:12:03; and "Praia da Luz" - 12:18:48. The records immediately after occurred at 12:19:13 and 12:36:30 on the antenna "Almadena" and "Praia da Luz Centre" [respectively]. On this day Gerald leaves Luz going to Lagos. The phone that he owns triggered the antennae: "Lagos (Santa Maria)" - Optimus network - 16:36:37 and 17:08:38; "Lagos Centre" - 17:14:54; "Lagos Norte" - 17:15:54; "Lagos Centre" - 17:23:45; and "Praia da Luz Centre" - 18:27:58. Still today at 22:29:50, there is a record on the antenna "Budens". The one preceding it occurred on the antenna "Praia da Luz Centre" at 20:04:14, and the one after it occurs on "Praia da Luz" at 22:32:44. From that return until 18:11:08 on 2nd, there exist records only on the repeaters of Luz. 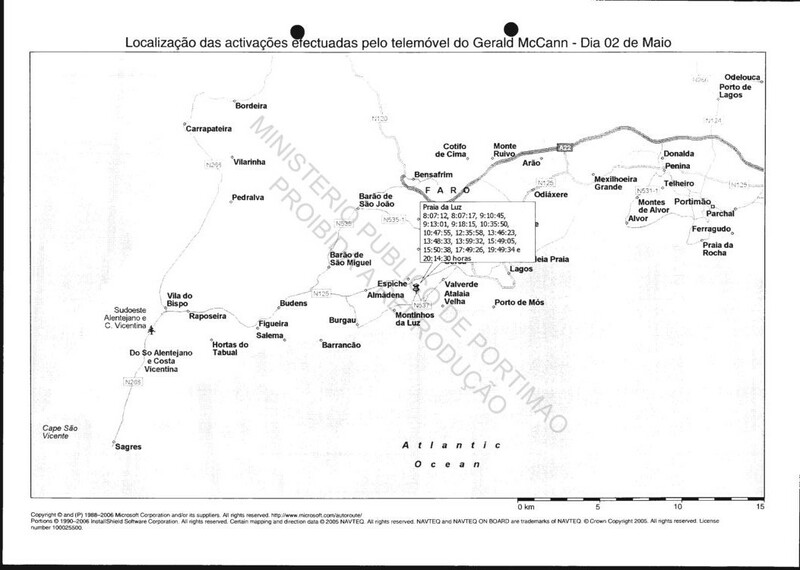 The subsequent records show Gerald McCann leaving the village up to at least Budens, with a brief passing in Luz: 18:32:05 - "Budens"; 18:43:56 - "Praia da Luz"; 19:16:15, 19:16:48, 19:17:10, 19:17:35 and 19:18:09 - "Budens"; and 20:37:35 - "Praia da Luz Centre". On this day searches were made in the house in which the McCann were living. After the return, on 3rd all the antennae activated between 1:18:24 and 20:34:52 are those that serve Praia da Luz, with the exception of the antenna "V.R. de Santo Ant?io on which is registered at 13:38:00. Consulting the news database kept by the Police, it is seen in the newspapers Jornal de Noticias and 24Horas, of 4th, the news of the presence of the couple McCann in Huelva, on 3rd, hence the record on that antenna next to the border with Spain. On 4th, Gerald leaves the coverage area of the antennae that serve the town from where Madeleine disappeared. The first record on this day occurs at 8:49:02 on the antenna "Sobral IC4" followed by the antennae; "Silves", "Arge IC4", "Ladeira do Vau", "Chinicato" and "Praia da Luz " at 8:49:28, 8:53:28, 8:53:59, 9:02:45 and 9:07:54 respectively. In this movement he will not have been, possibly, accompanied by Kate Healy. On this day her phone only activates the antennae that serve Praia da Luz. The databases of both show two entries - 8:53:28, in the case of Gerald's phone, and 8:53:30 in the case of Kate. The antenna activated by his phone is "Arge IC4" and of her phone it is "Luz Centre 2". From his return on 4th up to 9:58:59 on 6th, [his phone] only activates antennae of the village of Luz. At that time the registration is made on the antenna "Lagos". This antenna has another entry at 10:01:57. Then follow the antennae: "Ladeira do Vau" - 10:16:53; "Portimao Centre" - 10:27:38; "DCS Portimao Centre" - 10:41:22; "Portimao II" - 10: 43:58; "Portimao Centre" - 10:50:00; "Portimao II" - 10:52:26 and 10:57:47; "DCS Portimao" - 11:06:56; "DCS Portimao Centre" 11:08:44 and 11:12:44; "Portimao II" - 11:17:23; "DCS Portimao Centre " - 11:18:31; "Portimao Centre" - 11:36:52, 11:55:59, 11:59:09 and 12:23:51; "Ferragudo" - 12:26:10; "DCS Portimao" - 12:36:48; "Ladeira do Vau" - 12:40:08; "Arge IC4" - 13:00:00; "Monte Alto IC4" - 13:09:28; "Lagos Centre" - 13:15:06; "Lagos" - 13:18:08; and "Praia da Luz Centre" - 14:18:36. 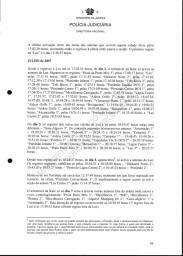 It is pointed out the fact that on this day, according to the case file at page 2186, searches were conducted in several cars, including the Renault Scenic, registration 59-DA-27. It records in that document of canine inspection that one of the dogs "marked" this car at 15:27. Gerald's trip to Portimao was, perhaps, to leave the car in order that that work be conducted. All records from the "arrival" at Luz on 6th until 9:07:52 on 8th were made in the village where he resided temporarily. The next entry occurs on antenna "Lagos Centre" at 10:24:54. It stayed in that place activating the antennae: "Lagos Hotel" at 10:30:35, 10:30:55, 10:32:06, 10:32:32, 10:51:09, 11:14:16, 11:14:21, 11:18:51, 11:19:29, 11:20:56 and 11:22:27. It returns to "Praia da Luz Centre" at 11:56:25. Still on this day the phone of Gerald makes records outside of the transponders of Luz, activating: "Lagos" - 14:37:35 and 14:37:42; "Monte Alto IC4" - 14:45:13; "Portimao Centre" - 15:03:22, 15:06:05, 15:22:02, 15:22:08, 15:37:01, 15:37:16, 16:13:31, 16:13:37, 16:13:43, 16:24:52, 16:24:57, 16:28:16, 17:05:58, 17:06:48, 17:13:24 and 17:14:16; and "Praia da Luz Centre" - 17:48:05. This trip to Portimao, in the company of Kate, was to go to retrieve the car he left two days before. From the return up to 13:27:16 on 9th it only activates antennae in Praia da Luz. The record immediately after this was made at 14:01:22 on the antenna "Chinicato". On this antenna there occurred still 5 more entries, all spaced a few seconds apart (14:01:27, 14:07:32, 14:07:48, 14:27:45 and 14:28:35). At 14:48:48, an entry is made on "Penina" the records going back to "Chinicato" at 15:01:48, 15:14:57, 15:49:44, 16:48:54, 16:49:00 and 16:51:41. The activations immediately following are on the antennae "Lagos Centre" and "Praia da Luz Centre" at 17:00:38 and 18:05:06. Only on 10th at 10:40:49 is the first activation outside the village of Praia da Luz after what passed the previous day. At that At that time is activated the antenna "Lagos" followed by "Lagos Hotel" at 10:54:45, and "Chinicato" at 11:19:14, 11:27:05, 11:53:22, 11:53:27, 11:56:54, 11:57:01, 12:12:10, 12:49:48 and 12:54:32. The return of the records to the antennae of Praia da Luz occurred at 13:33:36. After the return to Luz on 10th [the phone] only leaves the influence of the antennae that serve this location on 13th at 8:11:49 - 1st activation of the day - being at that time under the coverage area of the antenna "S.ta Barbara de Nexe". After this record one follows at 8:50:09 on the antenna "Lagos" and at 9:23:18 the antenna "Praia da Luz Centre". Given the proximity of Santa Barbara de Nexe to Faro, the fact that it was the first activation of the day and the fact that the second being already in Lagos, it is likely that Gerald had gone to the airport in Faro, to receive or to bid farewell to some relative or friend. Following which are contacts made at 16:43:53, 16:46:37 and 16:58:51 on the antennae "Praia da Luz", "Budens" and "Luz (Lagos)" - Optimus network - respectively. It is plausible that the communications made at 16:43:53 and 16:46:37 had been made when Gerald's phone was on the fringe of the coverage area between the two antennae, because it would not be possible to cover the distance of approximately 10.5 km that separates these two locations in only 2.44 minutes, unless he had travelled at 315 km/h. On this day it again leaves the coverage area of antennae that serve Luz, only returning at 10:51:18 on 16th. At this time it activates the antenna "Lagos" returning to "Praia da Luz Centre" at 11:08:13. It remains in the coverage area of the antennae that serve that area until 14:40:25 on 17th. The contact subsequent to this is made in the coverage area of the antenna called "Burgau" at 15:25:32, followed by the antenna "Almadena" at 17:31:37, returning to "Praia da Luz Centre" at 20:39:34. From that time until 8:07:15 on 19th, inclusive, [the phone] activates only the antennae that serve the village where he [GM] lived while he was in Portugal. The next record occurs at 9:52:21 on the repeater "Loul?Centre". It is followed by records: "Patac? "; "Faro Airport"; "Lagos Centre"; and "Praia da Luz" at 10:00:24; 10:03:53; 10:54:05, 11:05:24 and 11:06:18; and 11:13:05 respectively. This trip to Faro airport will have been to receive or to bid farewell to some friend, since one observes that the records return to the antennae of Luz. It is only the 20th that Gerald McCann again leaves the coverage area of the antennae of Luz. On this day at 10:04:23 and 10:06:08 only the antenna called "Lagos" is activated. They are the exceptions to the remaining 34 records. It remains in the Luz until 13:31:52 ("Praia da Luz") on 21st. On this day it comes to Lisbon. Along the way the [following] activations were made: "S.Bartolomeu de Messines" - 14:05:42; "Agueda A2" - 14:11:12; "Ferreira do Alentejo" - 14:36:30; "South Grandola" - 14:42:56 and 14:44:54; "Palmela A12" - 15:15:05 and 15:20:48; "Auto Europa" - 15:21:33; "Coina" - 15:22:40 and 15:23:34; "South Central" - 15:31:56; "Avenue of Nations" - 16:04:54, 18:05:00, 18:05:05, 18:05:39, 18:29:17, 18:44:37 and 18:55:52; "Telheiras South" - 19:13:54; and "Airport of Portela" - 19:20:19. The record following this last one occurs at 21:44:38 already on [back at] the antenna "Praia da Luz Centre". On 22nd, the first record takes place on antenna "Zoomarine Guia" at 8:29:06, followed by records on repeaters "Alcantarilha"; "Sobral IC4"; "Parchal" and "Arge IC4" at 8:31:10, 8:32:07, 8:36:37 and 8:37:19, respectively. It returns to the coverage area of the antennae of Praia da Luz at 9:30:56. The first record, after the return on the previous day, on an antenna outside the Luz was 9:36:28 on 23rd on the antenna "Lagos". The record following it returns to "Praia da Luz Centre" at 9:38:02. At 12:00:01 there is new registration on antenna "Lagos". The previous record was made at 11:49:34 on "Praia da Luz Centre", and the one immediately afterwards happened at 12:09:53 at the "Praia da Luz". 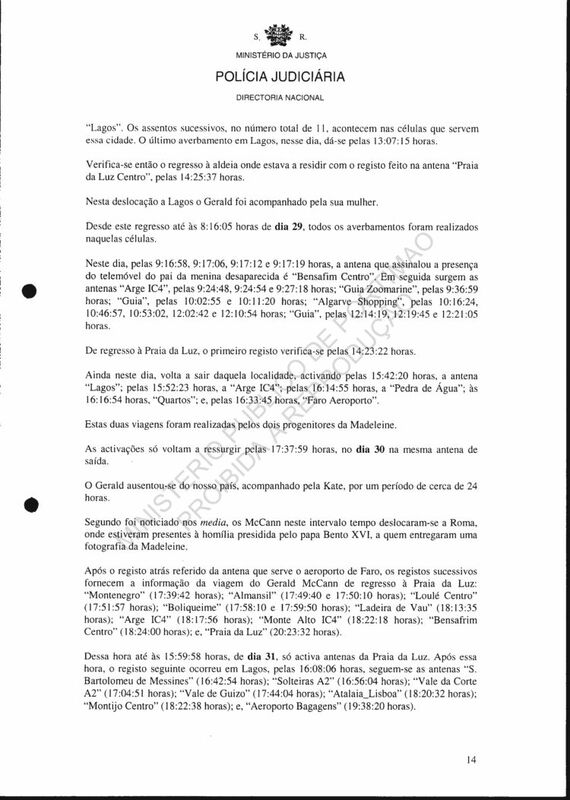 Still on this day the records of Gerald McCann's phone indicate a new trip to the airport in Faro: "Lagos" - 15:28:45; "Lagos Norte" - 15:29:46; "Bensafrim Centre" - 15: 29:51 and 15:29:59; "Ferreiras" - 15:52:45; "Pedras de ?ua" - 15:59:16; "Faro Airport" - 16:25:58, 16:39:36, 16:45:34, 16:59:42, 17:03:31, 17:04:08, 17:16:47 and 17:31:09. No other record is made until 21:15:59 on 25th on that antenna that serves the airport. According to some dailies [daily newspapers] of 25th and 26th, Gerald in that time was in Scotland, at an international festival of television to inform how he managed to get going, so quickly, the campaign to find his daughter, on a global scale. In addition to the registration mentioned above, on this day, there are only two more records: one at 21:15:49 on the same antenna, and another at 21:21:00 on the antenna "Montenegro". At 0:13:31 on 26th occurs the first record on the antenna "Praia da Luz". From that time up to 9:21:21 on 28th, inclusive, all existing records point to the phone of Gerald having remained in the village where he resided temporarily. 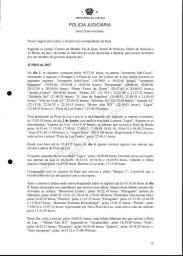 After the registration referred to in the preceding paragraph, the activations of the phone, point to the journey of the father of Madeleine to the area of Lisbon and return to Luz: "Penina" - 10:33:18, 10:34:08 and 10:34:22; "Arge IC4" - 10:34:43; "Estombar" - 10:38:25; "Lagoa" - 10:39:20; "Guia" - 10:45:31; "Paderne Macro" - 10:51:59; "S.Joao de Negrilhos" - 11:25:14; "Messejana A2" - 11:26:39; "S.Margarida do Sado" - 11:28:53; "Landeira" (network Optimus) - 11:58:51; "Marateca" (network Optimus) - 12:02:52; "Avenue of Nations" - 14:06:55; "Grandola North" - 15:06:10, 15:07:56 and 15:09:41; "Grandola South" - 15:13:50; "Bensafrim Centre" - 16:19:25 and 16:19:36; and "Lagos North" - 16:21:22 and 16:27:22. At 16:35:28 it activates one of the antennae of Praia da Luz. Gerald made this trip with Kate. On 29th the exit does not cover many kilometres, but it will have gone to the city of Lagos, activating the antennae: "Lagos"; "Lagos Centre"; "Lagos Hotel"; "Lagos Centre"; "Lagos Hotel" and "Lagos Centre" at 11:35:46, 11:54:44, 12:04:01, 12:29:18, 12:34:32 and 13:11:31, respectively. At 13:51:40 it returns to the antenna "Praia da Luz Centre". On 30th all records, except that which occurs at 11:04:59, happen on the antennae of Praia da Luz. 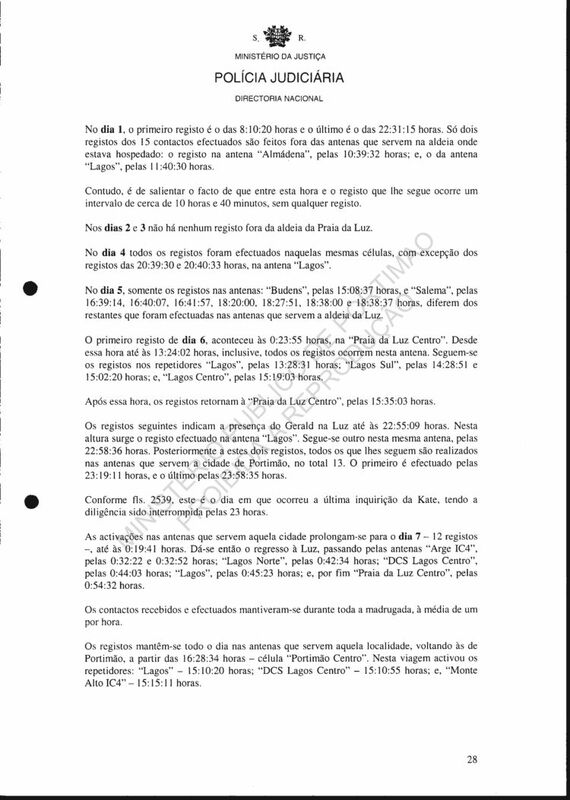 At the time indicated the record was made on the antenna "Lagos" but given the record that follows it - 11:03:43 on "Praia da Luz" - it points to a similar situation that led to footnote 2. Also one should [must] not exclude the hypothesis that it was in motion and being at the edge of the coverage of those two antennae, passing from one to the other in about a minute. The record immediately following is that of 13:16:24 on the "Praia da Luz Centre". On 1st the first record is that of 8:10:20 and the last is that of 22:31:15. Only two of the 15 records made are made outside of the antennae that serve in the village where they were staying: the record on antenna "Almadena" at 10:39:32, and that on antenna "Lagos" at 11:40:30. Nevertheless, it is important to stress the fact that between this time and the record that follows it occurs an interval of about 10 hours and 40 minutes, without any registration. On 2nd and 3rd there is no record outside the village of Praia da Luz. On 4th all records were made on those same antennae, with the exception of records of 20:39:30 and 20:40:33 on the antenna "Lagos". On 5th only the records on antennae: "Budens" at 15:08:37 and "Salema" at 16:39:14, 16:40:07, 16:41:57, 18:20:00, 18:27:51, 18:38:00 and 18:38:37 differ from the rest that were made on the antennae that serve the village of Luz. The first record on 6th happened at 0:23:55, at the "Praia da Luz Centre". From that time until 13:24:02, inclusive, all records occur in this antenna. There follow the records on the repeaters "Lagos" at 13:28:31; "Lagos South" at 14:28:51 and 15:02:20; and "Lagos Centre" at 15:19:03. After that time the records return to the "Praia da Luz Centre" at 15:35:03. The subsequent records indicate the presence of Gerald in Luz until 22:55:09. At this time the record comes out on antenna "Lagos". It is followed by another on the same antenna at 22:58:36. Subsequent to these two records all those that follow them are made on antennae that serve the city of Portimao, 13 in total. The first is made at 23:19:11, and the last at 23:58:35. According to page 2539 [of the case file] this is the day on which occurred the last questioning of Kate, that work having been interrupted at 23:00. The activations on the antennae that serve that city extend into 7th - 12 records - up to 0:19:41. 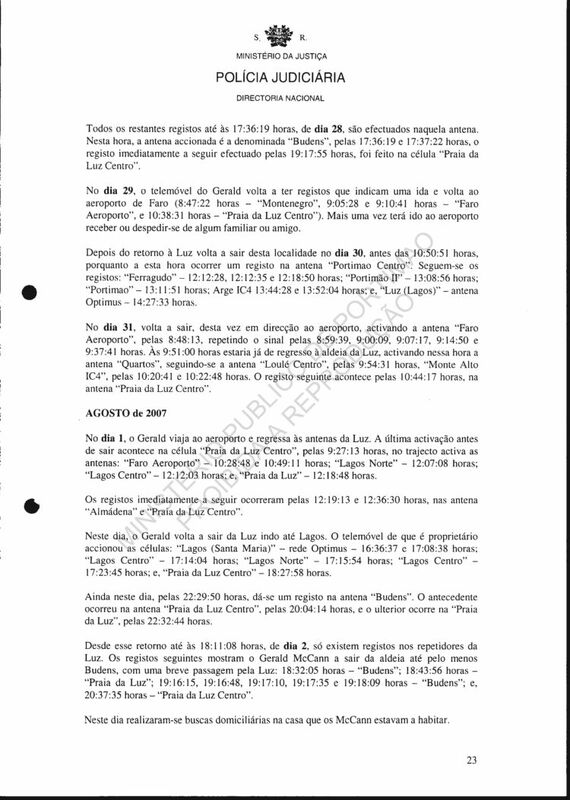 There is then a return to Luz, passing the antennae "Arge IC4" at 0:32:22 and 0:32:52; "Lagos Norte" at 0:42:34; "DCS Lagos Centre" at 0:44:03; "Lagos" at 0:45:23; and finally "Praia da Luz Centre" at 0:54:32. The contacts made and received had remained throughout the night, on the average of one per hour. The records remain throughout the day on the antennae that serve that city, returning to Portimao from 16:28:34 -antenna "Portimao Centre". On this trip it activated the repeaters: "Lagos" - 15:10:20; "DCS Lagos Centre" - 15:10:55; and "Monte Alto IC4" - 15:15:11. According to pages 2557 and 2560 Kate was questioned at 11:00 and 14:30, while the interrogation of Gerald McCann took place between 16:05 and 22:50, according to pages 2567 and 2574. During his interview the phone that he owns and uses made records at: 16:28:34, 19:13:07, 19:13:24, 21:50:34, 22:04:27, 22:04:50, 22:06:16, 22:07:58. 22:08:21, 22:08:51, 22:08:58, 22:12:32, 22:12:41, 22:22:27, 22:22:36, 22:22:44, 22:23:07, 23:50:07, 23:50:13 and 23:59:30, on the antenna "Portimao Centre". Already on the next day, 8th, still in the continuity of what should have been his journey to "home" that phone activates the antennae "Penina"; "Monte Alto IC4", "Lagos" and "Praia da Luz Centre". The first at 0:19:47; the second at 0:30:34, 0:31:02 and 0:36:57; the third at 0:40:59; and the last at 1:11:14. 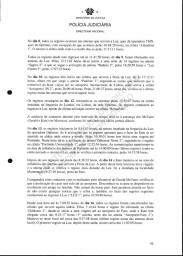 Not again activating any other antenna than those that serve the village from where the Madeleine McCann disappeared, making since its return to the Luz 210 activations in addition to those referred to above. 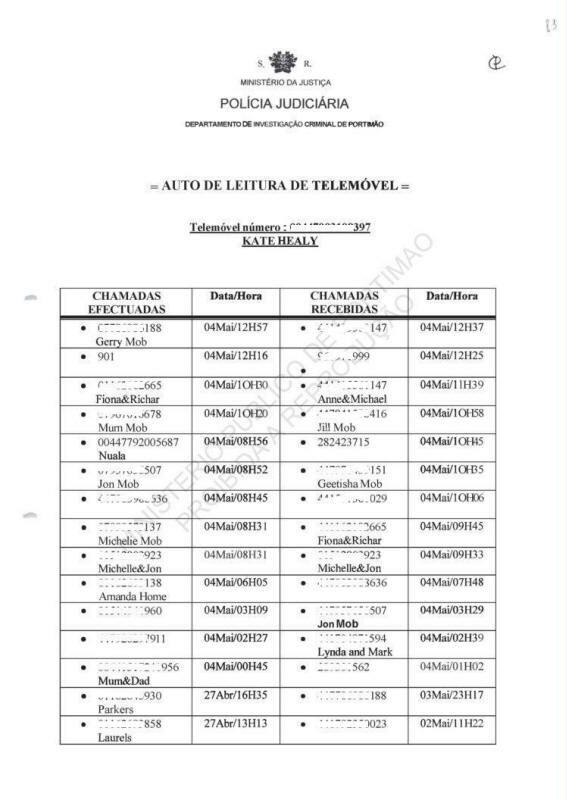 On 9th, the day of the return of the McCann family to the United Kingdom, according to what was duly reported and broadcast by television nationally and by some foreigners, the phone of Gerald activates at 6:30:35, for the last time, the antenna "Praia da Luz". There followed the antennae: "Arge IC4" - 7:31:13 and 7:31:15; "Sobral IC4" - 7:35:37 and 7:35:44; "Boliqueime" - 7:45: 32; "No Boliqueime" - 7:49:40; "Quartos" - 7:54:21, 07:54:29 and 7:55:49; "Almansil" - 7:58:29 and 7:58:37; "Faro" - 8:02:21; "Faro Airport" - 8:14:13, 8:33:40, 8:36:01, 8:39:54, 9:04:36, 9:05:33, 9:17:42, 9:17:52, 9:19:00, 9:22:14 and 9:30:18; and "Montenegro" - 9:40:39 and 9:40:42. Report pages 30 and 31. Activations of mobile phone (44)780-858-4191; Owned/used by: JANE MICHELLE TANNER. This number activates only antennae of the operator TMN. 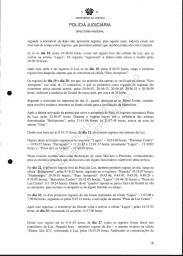 The first record from this number occurs on 29/04/2007 at 4:12:33, on antenna "Luz Centro 2"; and the last dated on 17 May, 2007, at 10:10:01 on antenna "Aeroporto-Faro 2". The existence of 294 records is observed, in which only 3,74% occur before the disappearance of the young girl. including the one referred to above, both on the antenna "Luz Centro 2". On 30th there exist only two records, at 18:31:14 and 20:41:44, also on that antenna. On 1st there exists no record. On 2nd there occur 6 records on the antenna already referred to, at 8:21:46, 10:05:20, 13:59:41, 14:33:53, 19:22:54 and 19:27:34. On 3rd, the day of the events, the mobile phone of Jane activates a single time on the antenna "Luz Centro 2" at 20:30:01.
antennae of the operator TMN that serve the village from where Madeleine disappeared occurred at 18:08:26. 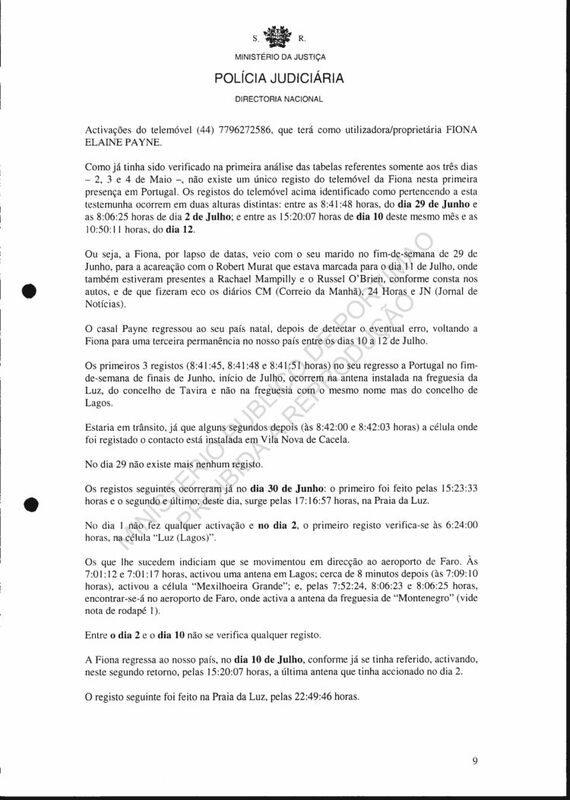 These records are confirmed by the movement of Jane to the DIC of Portimao to give her testimony, cf. pages 42ff. (Record of Questioning with start at 11:30). From the return to the village of Luz at 16:07:22 on 10th, all the records have occurred on the antennae that serve that village. At this time there started a cycle of activations on the antennae that serve the city of of Portimao which stops at 22:19:59. This movement to Portimao was her returning to be questioned, cf. pages 919 ff. On 11th the first record occurs still on one of the antennae that serve the city of Portimao - "Portimao Centro DCS 1" at 3:04:26 - following which at 9:22:57 was made the record on the antenna "Luz Centro 2". From this return until 20:52:09, inclusive, on 16th, all records materialise on the antennae that serve that tourist village. On 17th there exists a single record, it being also the last from the mobile phone of Jane in the period analysed. This record was on the antenna "Aeroporto- Faro 2" at 10:10:01.
based on the records it is deduced that Jane had not accompanied her husband on the trip to Portugal when he came to the confrontation with Robert Murat. If she did then she will not have used the mobile phone with the number that was known as hers. 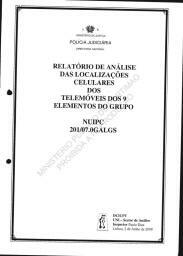 Analytical report of the ANTENNAE LOCATION RECORDS OF MOBILE PHONES OF THE 9 MEMBERS OF THE GROUP Report pages 32 to 49. Activations of the mobile phone (44)790-310-8397; Owned/used by KATE MARIE HEALY [McCann]. This number activates only antennae of operator Optimus and TMN. The first of the existing records occurs on 28 April, 2007 at 14:30:37 on the antenna "Luz Centro 1"; and the last contact date of 9 September, 2007 at 9:11:15 on the antenna "Aeroporto-Faro 2". There is observed the existence of 8901 records, of which only 0,45% occurred prior to disappearance of the young girl. 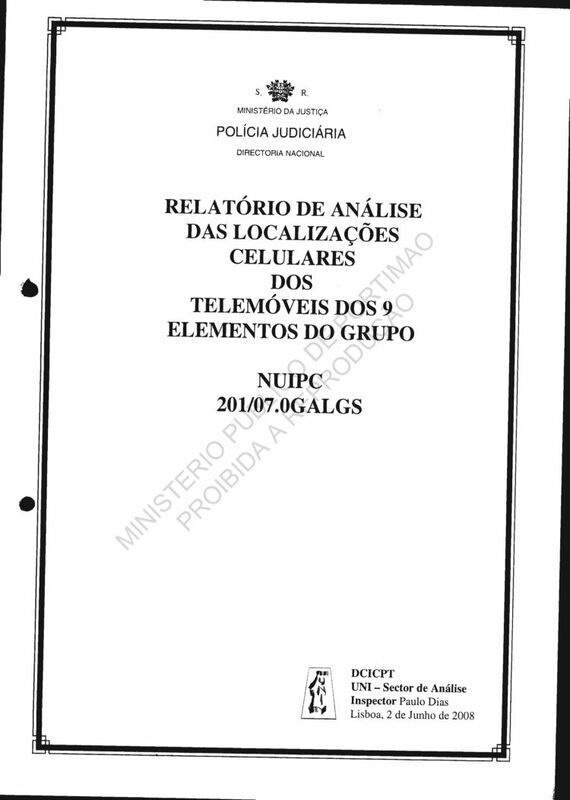 On 28th the mobile phone that is owned by Kate Healy makes its first record in Portugal, as already said, on the antenna "Luz Centro 1" and from that date until the disappearance of her daughter it never leaves the coverage area of the antennae of the national operator TMN that serve village where she came to spend a week on holiday. 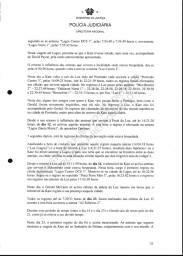 Admitting [acknowledging] that Madeleine had disappeared between 21:00 and 22:00  on 3rd, it is observed that the last record of the mobile phone of Kate prior to the occurrence [event] occurs at 13:34:53 and the first after the tragic happening was at 23:14:51. The first time that it activates an antenna different from those that serve that village was on the day on which she went to make statements to the D.I.C. of Portimao - (cf. pages 58) - on 4th. It activates then the antenna "Lagos Centro DCS 3" at 10:33:20, there following others up to the first that activates in the city of Portimao - "Portimao 1" - 10:44:53. From that moment until 18:19:29, inclusive, it activates only antennae that serve this locality. The antenna registered immediately following that one is "Luz Centro 2" at 23:17:52. After its return to activate in the village of Luz, one again observes records outside those antennae only on 9th at 14:44:26 when it enters the coverage area of the antenna called "Lagos Norte 1". In the city of Lagos one observes 8 more contacts in addition to that referred to before. The first record of the return to the antennae of Luz occurs at 16:07:47. Gerald on this day only activates antennae of Luz, from which it is presupposed that Kate had gone to Lagos without her husband, but it will be able to have been done in the company of the friend David, given that his mobile phone in the same period of time, presents records in the city of Lagos. On the following day, 10th, Kate will have gone again to that city. At 7:39:01 [her phone] activates the antenna "Lagos Norte 1". It activates that antenna twice more at 7:39:14 and 7:40:16, following which the antennae "Lagos Centro DCS 1" at 7:54:49 and 7:54:59 and, again, "Lagos Norte 1" at 7:55:43. On this trip to Lagos it is presumed that Kate had been, once again, accompanied by David Payne, for the same reason given previously. The return to the coverage area of the antennae that serve the locality where she was a guest was at 8:50:56 when it again activates the antenna "Luz Centro 2". On this day Kate again leaves Luz going to Portimao where she actions the antenna "Portimao Centro 3" at 14:09:23. Up to 22:21:39 all the records were made on the antennae that serve that city. On the return to Luz she passes the antennae: "Mexilhoeira 2" - 22:27:49; "Odiaxere Norte 1" - 22:28:26, 22:28:58, 22:29:18, 22:30:01, 22:30:38 and 22:30:45; "Bensafrim I " - 22:31: 13; and finally, "Luz 4" - 22:31:49. On this day some of the friends with whom Kate came to spend holidays in Portugal, along with Gerald, were again questioned, but she was not. On the return to Luz Kate was not accompanied by Gerald. 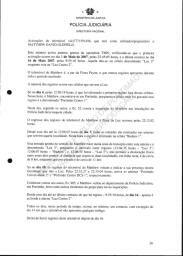 The records of the calls of the mobile phone of her husband remain in the city of Portimao, many after the return of Kate to that village. From her return to the coverage area of the antennae that serve Praia da Luz until 14:21:20 of 12th, [her phone] activated only those antennae. At this time the record is made on the antenna "Lagos (Santa Maria)", of the operator Optimus. 7 [seven] seconds later, it returns to the antennae of the village where she was a guest. Analysing the time of the contact that precedes that record on that that antenna (14:04:18 ("Luz (Lagos)") and the time of the return to Luz (14:21:27) results in two hypotheses: either Kate was really in Lagos, and for this she would have to be on the boundary between the two antennae, or one is observing a situation similar to that that gave rise to the note in footnote 2. From the return to Luz until 15:11:59 on 14th the mobile phone of Kate activates only the antennae that serve the resort where she was a guest. At this time there appears the first record on the antenna called "Lagos Centro DCS 3". It remains in the city of Lagos until 16:22:58. Following this is the record on the repeater "Praia Porto Mos 3" at 16:23:02 and the return of the records to the antennae of Luz at 17:43:30. On this day Gerald McCann activates only the antennae of the village of Luz at the same times that the mobile phone of Kate registers her presence in that town. All the records until 7:29:31 on 23rd were made on the antennae of Luz. The entry at this time activated the antenna "A2 Solteiras 2". During that period of time (between 14th and 23rd) Gerald left our country on 21st, as already referred to in his time line. On this day, 23rd, the first record of the day was that mentioned above. The antennae that follow show the journey of Kate to the Sanctuary of Fatima, together with her husband. The first activation of one of the antennae that serve that city was at 10:01:52 and the last occurred at 14:50:42. The presence of the McCann at the sanctuary was reported by the media. The return to the village where they came to spend holidays activated various antennae that need not be specified here. The first record on this day, on one of the antennae that serve Luz, occurred at 20:11:23. However, the return will have occurred earlier. According to the mobile phone records of Gerald the first activation on the antennae of Luz occurred at 18:04:17. From her return until 12:07:22 on 25th, all the records of the mobile phone of Kate occur on the antennae of Luz. The record immediately following - 14:17:16 - observed on the antenna "Portimao Infante 1", following which are the antennae: "Portimao Infante 1", "Mexilhoeira 3" and "Odiaxere Norte 2" at 14:17:50, 14:21:18 and 14:24:41 respectively; repeating on the last antenna at 14:25:04. The return of the records to the village where she was residing was at 16:47:17 on the antenna called "Luz Centro 2". On this day Gerald McCann activates only antennae of the village of Luz. There occur activations almost simultaneously, but registered on separate antennae. His mobile phone in Luz and her mobile phone in Portimao. On 26th the mobile phone of Kate starts with a record on the antennae that serve Lagos at 9:55:38 ("Lagos Este 3"). It remains in that city until 12:29:58, the time of the last record on one of the antennae repeaters of Lagos. At 14:19:36 one observes the return to the antennae of Luz ["Luz" (Lagos)], on the Optimus network. On this day, as already referred to previously, the mobile phone of Gerald McCann also activated antennae of that fishing locality from 9:24:38 to 13:07:15. From the return on 26th until 9:11:10 on 29th, there exist only records on the antennae having a coverage area in the village of Luz. The record following that is at 9:13:07 on the antenna "Lagos Norte 3", following which are the records on the antennae: "Lagos DCS 3" at 9:15:07; "Porches 1" at 9:36:08; "Guia-Algarve 1" at 9:38:42; "Algarve Shopping IN 2" at 9:43:46; "Assumadas 3" at 9:46:50; "Algarve Shopping IN 1" at 10:08:22, 10:08:36, 10:15:07, 10:15:16, 10:21:45, 10:27:32, 10:27:42 and 10:29:08; "Algarve Shopping IN 2" at 11:33:40, 11:37:21, 11:37:55, 11:37:59, 11:38:33, 11:38:39, 11:38:43 and 11:40:17; "Assumadas 2" at 12:22:29; "Benagaia 1" at 12:23:46; and "Alcantarilha 3" at 12:25:06 and 12:40:06. The return to Luz was observed at about 13:41:29 - "Luz Centro 2". On this day the mobile phone that Kate uses/owns again leaves the coverage area of the antennae that serve that resort and the last records happen at 16:24:16 on the antenna "Sta Barbara Nexe 2 1". The return to the coverage area of the antennae of the village where she was residing was at 18:32:54 on 30th. The first activation on this day was registered on the antenna "Aeroporto-Faro 2" at 17:37:39. 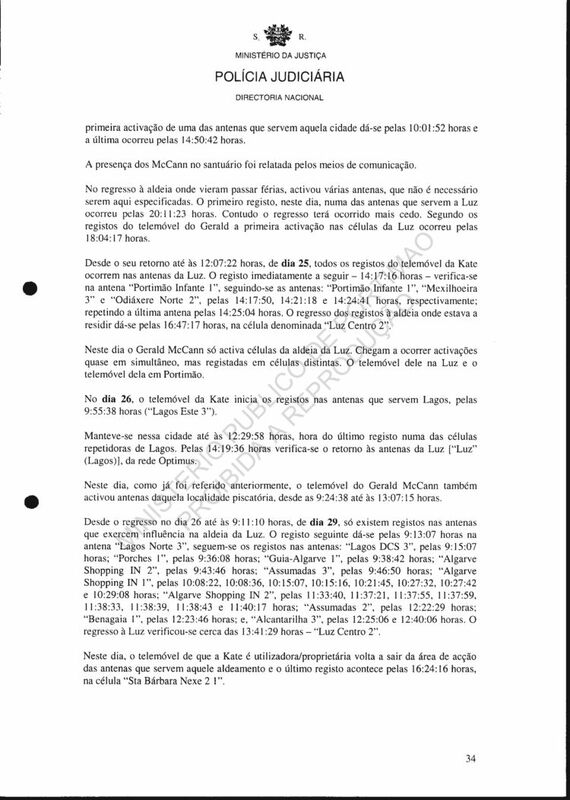 As was stated when the records of the mobile phone of Gerald were analysed, this absence of contacts during more than 24 hours was due to the McCann having gone to Rome. After the return to Luz all the records are made on the antennae that serve this village until 16:07:27 on 31st. 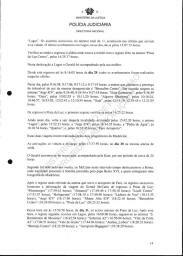 There follows the record made at 16:11:26 on the repeater "Lagos Norte 3". Those following lead to the Lisbon airport. The last record occurs on the antenna "Aeroporto 1 IN DCS 4" at 19:41:11. The records reappear only at 19:52:49 on 1st, on the antenna installed in the [parish] Santa Maria of the Olivais, Lisboa. As was duly reported by some newspapers on this day, the McCann journeyed to Madrid on this occasion. The re-entry on the antennae that serve the village of Luz was registered at 23:13:13 ("Luz Centro 2"). 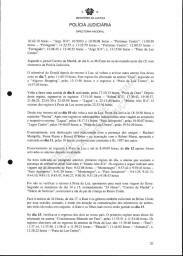 Only on 2nd at 13:58:47 did the records indicate the presence of Kate outside of Luz, when it activated the antenna "Praia Porto Mos 2". antennae of Luz was at 20:19:02 ("Luz Centro 2"). 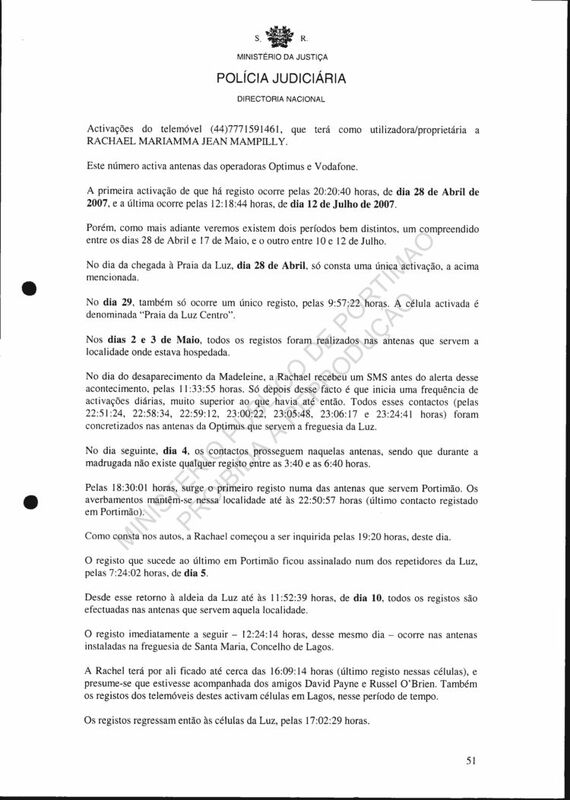 The records that occurred in this time period were: "Praia Porto Mos 3" at 13:58:53; "Bensafrim 1" at 14:00:34; "Rocha Praia DCS 2" at 15:21:25, 15:41:45, 15:52:58, 16:27:16, 16:46:25 and 18:36:16; "Portimao Infante 2" at 20:00:29 and 20:00:34; "Mexilhoeira 3" at 20:03:15; "Odiaxere Norte 1" at 20:04:50; "Praia Porto Mos 3" at 20:10:54, 20:11:01 and 20:11:08; and "Lagos Centro DCS 3" at 20:11:41. After the return until 15:29:01 on 4th all the records were made on the antennae that serve that village. The later records happened on the antenna "Burgau 1" at 16:09:24, 16:09:33 and 16:09:36. The return to Luz is observed at 16:14:37. On 5th the records indicate the journey of Kate to the coverage area of the antenna "Benagaia 2" (16:21:41). Having analysed the records of Gerald one sees that the the couple travelled to Faro airport from where they will have departed for a short stay outside of our country. As was already started while relating the analysis of the data pertaining to Gerald, the media had reported the journey of the McCann to Berlin. 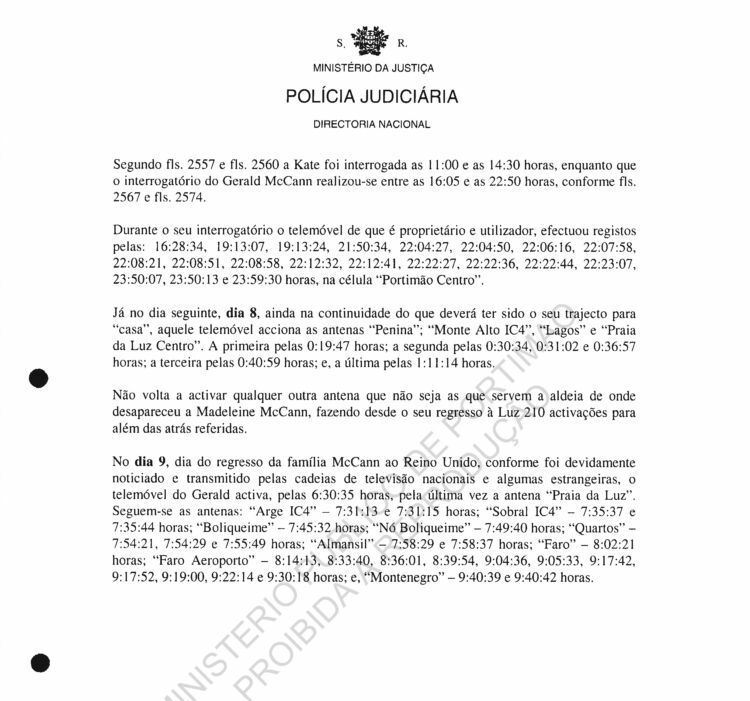 The first record indicative of the return of the McCann to Portugal, with respect to the records of Kate, is observed at 17:14:25 on 7th on the antenna of the [parish] Montenegro, of the operator Optimus. The re-entry of the records on the repeaters of the village of Luz is observed at 18:06:41. On 8th all the records occur on the antennae that serve Luz, either on the operator TMN, or that of Optimus, except for that which happens at 10:48:29 on the antenna "Almadena 1". The return to the village where she was residing was at 11:31:11. All the records from this return, until 11:41:50 on 9th, were made on the antennae of Luz. At 13:11:02 there started a series of 14 records on the antenna "Sagres 2", from which follow the activation of the antenna "Budens 2" at 16:28:59 and "Luz Centro 2" at 17:07:23. On 10th the records start on the antennae that serve Praia da Luz until 17:12:11 the time at which there appears the antenna "Paderne 3", being followed by others which indicate that the mobile phone of Kate travelled to the international airport of Lisboa, where it activates the antenna "Aeroportol IN 2" at 20:09:46. At 21:06:37 on this day one observes the last record on one of the antennae that serve that place. The records reappear on 12th, starting with the entries at 15:51:47 on the antenna installed in the [parish] of Lumiar, in Lisboa, on the Optimus network. The records lead to the return to Luz, despite the last activation occurring on the antenna "Bensafrim". The absence of contacts during that interval of time is due to the presence of the McCann (Gerald and Kate) in Morocco, according to what was reported in the various daily newspapers. On 13th the records start at 0:31:57 on the antenna installed in the [parish] of Luz, of the operator Optimus. At 6:00am activations that followed point to the fact of Kate having remained in the village where she was residing. At 10:38:01 there begins a journey to Portimao. At this time there was the activation of the antenna"Odiaxere Norte 2", following which the record on the antenna "Portimao Universidade 1" at 12:25:54. The communications remain in the coverage area of the antennae of Portimao until 14:00:00 (last record), there having then started the return to Luz, where one observes the first contact at 14:15:38. After her return until about 8:38:32 on 14th Kate remained in the coverage area of the antennae that serve Praia da Luz. was installed in the locality Montenegro (9:27:29), close to Faro. Comparing these contacts with those made by the mobile phone of Gerald McCann one observes that the movement of the couple will have been to the airport. One does not know if they had bid farewell to or received a friend or relative. They did not leave our country. This premise notes the fact that there exist no news reports of such movement and, also, the fact of the subsequent records led to the return to Luz ("LUZ 1" at 10:50:46). From that time, until 7:00:52 on 16th, all the records materialised on the antennae that serve that village. At 7:14:44 the record was made on the antenna "Odiaxere 2", starting [another] journey to the Faro airport where Kate will have arrived about 8:23:17 (the 1st entry on this day on the antenna "Aeroporto- Faro 2"). It remained in this place until about 9:37:58 (the last record on one of the antennae of that place). The first record in Luz, after this exit, occurs about 11:03:05. On this day Kate again leaves Luz, in the company of Gerald. At 12:56:32 [her phone] activates the antenna "Almadena 1", coming back to that village at 14:12:32. Due to the proximity of the antennae and the times of the contacts (12:55:41 - "Luz 3"; 12:56:32 - "Almadena 1"; 14:12:32 - "Luz 4"), we pointed out that she had left, for about an hour, from the village from where Madeleine had disappeared. It was not possible to determine, even through the newspapers for that day and the day following, where Kate might have gone. After that record, only on 18th at 16:33:11 does [the phone] again make a record outside of Luz, which happens on the antenna "Cabanas Velhas Ml". There follow the records on the antennae "Burgau 2" at 17:55:41 and 17:55:48; "Burgau 1" at 17:59:47; and "Luz Centro 2" at 18:08:15. From that time until 14:53:27 on 19th, it does not again leave the coverage area of the antennae of Luz. The next record is observed at 15:42:07 on the repeater called "Porches 1". 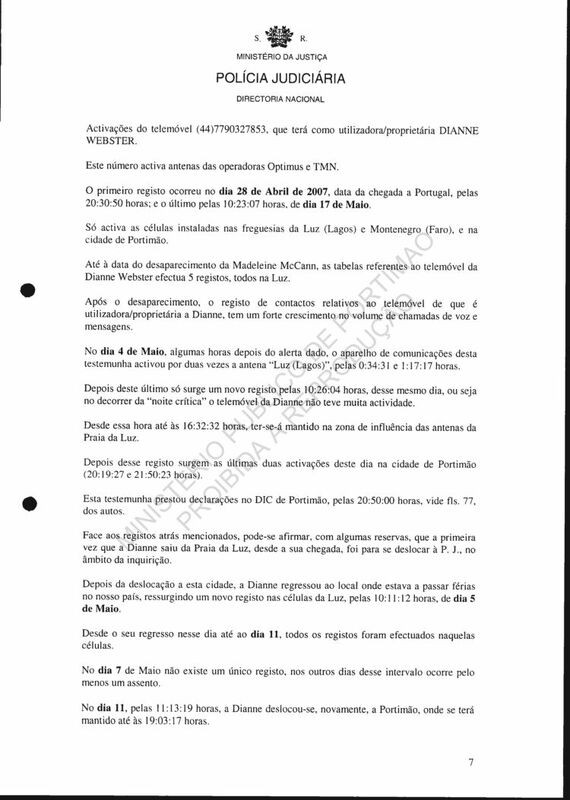 The return to Luz was about 19:10:06 ("Luz 3"), having in the meantime activated the antennae: "Assumadas 2", "Areias S Joao Centro 1", "Sta Eulalia 2", "Sta Eulalia DCS 3", "Oura DCS 3", "Areias S Joao DCS 1", "Cerro Aguia 2", "Sesmarias l" and "Lagoa Centro 1". 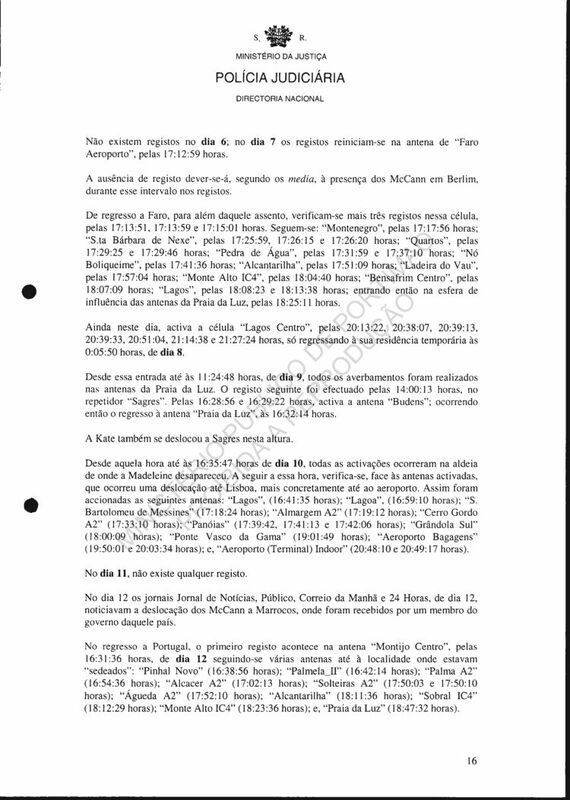 Comparing the records of the McCann couple, one sees that he left our country for about 36 hours (between 9:01:27 on 19th and 20:56:07 on 20th), as was already mentioned, while Kate remained in Portugal. On 20th, the activations begin at 7:40:26 on the antenna "Luz 2", and remain on the antennae of the locality until 20:05:10 the time at which it activates the antenna "Paderne 2", starting a movement to Faro airport, where it will have arrived at 20:31:13 ("Aeroporto-Faro 1"). Kate went to that place to meet her husband. The return to the locality where they lived while they were in our country was around 22:30. The first record of the mobile phone of Kate in Luz, on that occasion, occurred at 22:33:20 and that of Gerald McCann at 22:30:07. From this return until 10:59:56 on 21st, when the mobile phone is in the coverage area of the antenna "Portimao Centro 1", there exist records only on the antennae that serve the village of Luz. One presumes that the couple had gone to Portimao for another one of the weekly meetings they had been having with some officers of the police. The mobile phone remained in that place until about 13:16:41, the last record on one of the antennae that serve that city. One observes then it returns to Luz, where it made an entry at 14:37:33 (the 1st record after it went to Portimao). On this day the mobile phone of Kate presents further entries in the area of Lagos between 16:34:24 and 17:29:11; the rest up to the end of the day are all on the antennae of Luz. in this movement to Lagos Kate will not have been accompanied by Gerald. The 22nd begins with records on the antennae of Luz, though at 8:51:18 (antenna "Praia Porto Mos 3") Kate begins a new trip to Faro airport where she will have arrived about 9:37:27 ("Aeroporto-Faro 2"). She remained in this place until 9:56:13 (record on the same antenna), the time at which it began the return to Luz. The first record in this locality was made at 11:27:47. It will have remained in Luz until about 11:41:47 the time at which appear new records outside of that village, having been made on the antenna "Budens". On this antenna there are also registered activations at 11:42:23, 11:45:09, 11:45:40, 11:48:21 and 11:53:31. The record immediately following this last one was already on the antenna installed in the [parish] of Luz, of the operator Optimus at 12:07:59. One presumes that the movement to the airport on this day had been to go to bid farewell to or to receive some friend or relative. From this return the mobile phone of Kate only again presents a record outside of the antennae that serve Luz on 26th at 8:27:00 when it activates the antenna "Odiaxere Norte 2". With this record starts a series of records that indicate a new movement to the airport of Faro. The first record on one of the antennae that cover the airport occurs at 9:09:27 ("Aeroporto-Faro 2"). It remained in this place for about 20 minutes. At 9:32:05 it activates the antenna "Montenegro 2", initiating the return to the village of Luz. The first record of this return happens at 11:04:25 on the antenna "Luz Centro". On this journey she was not accompanied by Gerald, who had remained, according to the records do his mobile phone, in Luz. On 27th the records begin on the antenna "Luz Centro 2" at 7:53:25 and 7:54:26 followed by the antennae: "Porches 1" at 8:20:33; "Benagaia 2" at 8:22:30; "Assumadas 2" at 8:25:50; "Paderne 2" at 8:27:23 and 8:27:27; "Campina 1" at 8:32:15; "Loule 3" at 8:33:51 and 8:34:24; "S.Joao Venda 2" at 8:42:53; "Patacao 2" at 8:45:32; "S.Joao Venda 2" at 9:09:45; "S.Joao Venda DCS 1" at 9:10:30; and "Paderne 1" at 9:21:09. The records return to the village of Luz, more specifically to antenna "Luz Centro 2", at 9:21:09. From that return until 10:39:12 on 28th records exist only on the antennae that serve Luz. At this time the mobile phone of Kate activates one of the antennae that serve the city of "Portimao", on the Optimus network. Inexplicably, after this record there appear immediately following another two (10:41:07 and 10:42:15) on the antenna installed in the [parish] of Santa Maria, of the Municipality of Lagos, from that same network. From this contact was then started a series of records indicating the movement of Kate to Portimao. On the way it activated the antennae of Optimus installed in the localities: Bensafrim (10:42:50, 10:44:55 and 10:45:52) and Mexilhoeira Grande (10:50:06), arriving at Portimao about 10:50:35 (the 1st activation in this movement, admitting that that other may be an error in the records of the computer system of the operator in question). The last activation on this day on one of the antennae that serve that city was at 13:02:29 occurring then the return to the village where she was residing. The first record in "Luz" is at 13:26:57. From the return to Luz until 17:02:54 on 2nd, the mobile phone of Kate activates only the antennae of Luz. Followed by the records: "Praia da Porto Mos 3" at 17:08:17; "Luz" at 17:11:51; "N/E" at 17:11:54; "Odiaxere Norte 2" at 17:12:10, 17:12:38 and 17:13:04; "Portimao Infante 1" at 17:18:36; "Tres Bicos 3" at 17:24:48; "Tres Bicos 1" at 17:25:11; "Portimao Estadio DCS 2" at 17:26:11; "Portimao Centro 1" at 17:31:09; "Portimao Centro DCS 1" at 17:36:55 and 17:37:00; "Mexilhoeira Carregacao 3" at 17:45:34; "Lagoa Centro 1", 17:51:57, 17:52:02 and 17:52:05; "Aldeia Golfe 2" at 18:45:12, 18:45:18, 18:47:00, 18:48:11, 18:49:28 and 18:49:54; "Vilamoura Norte 1" at 18:51:17; "Aldeia Golfe 1" at 19:00:45; "Boliqueime" 1, 19:04:18, 19:04:20 and 19:04:22; "Aldeia Golfe 1" at 19:04:59 and 19:05:46; "Boliqueime 1" at 19:08:27; "Alcantarilha 3" at 19:24:11; "Portimao Infante 1" at 19:33:48; and "Luz Centro 2" at 19:53:45. On 3rd, the records begin on the antennae of Luz and only at 18:19:47 appears one different - "Guia-Algarve 3". 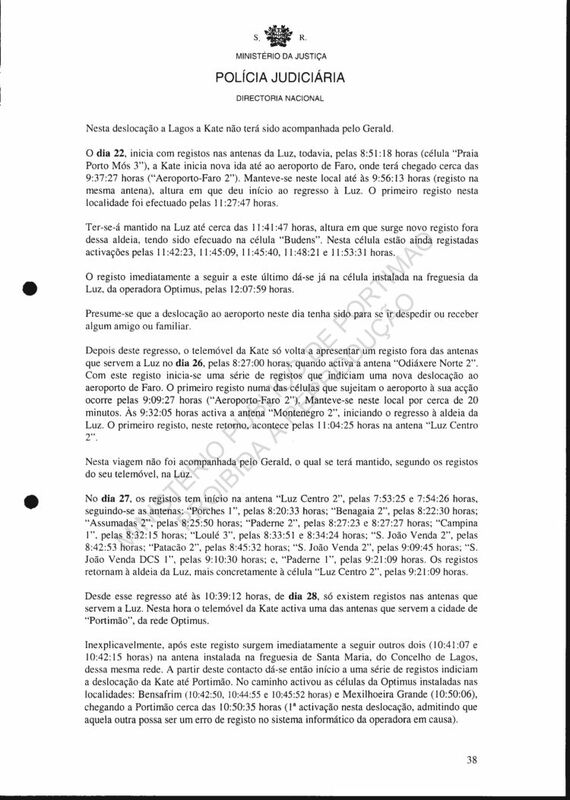 The subsequent contacts occurred on the antennae: "Assumadas 3" - 18:20:24 and 18:20:31; "Paderne 1" - 18:24:15 and 18:24:18 "Campina 3" - 18:25:44; "Aldeia Golfe 2" - 18:53:51; "Campina 1" - 19:48:45, 19:49:26 and 19:51:03; "Porches 3" - 20:04:51; "Tapadinha Vla Tr DCS 2" - 20:07:18; "Portimao Infante 1" - 20:09:14; "Bensafrim 1" - 20:18:27; "Lagos Centro 3" 20:20:10; "Praia Porto Mos 3" - 20:20:25 and 20:20:30; and "Luz 3" - 20:23:17. From that record until 10:28:27 on 5th, Thursday , it activates only the antennae of Luz. 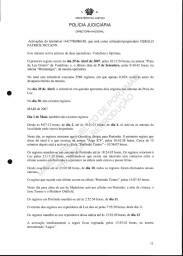 The following records are observed at 10:34:51 and 10:35:00 - "Odiaxere Norte 2"; 10:43:20 and 10:43:27 - "Porto of Lagos Centro 2"; and 10:45:24 - "Portimao 2". It remained in Portimao until about 12:37:49, the moment at which there was registered a contact on the antenna "Portimao Universidade 3". The one immediately following occurs already in the coverage of the antenna "Luz Centro 1" at 13:14:37. 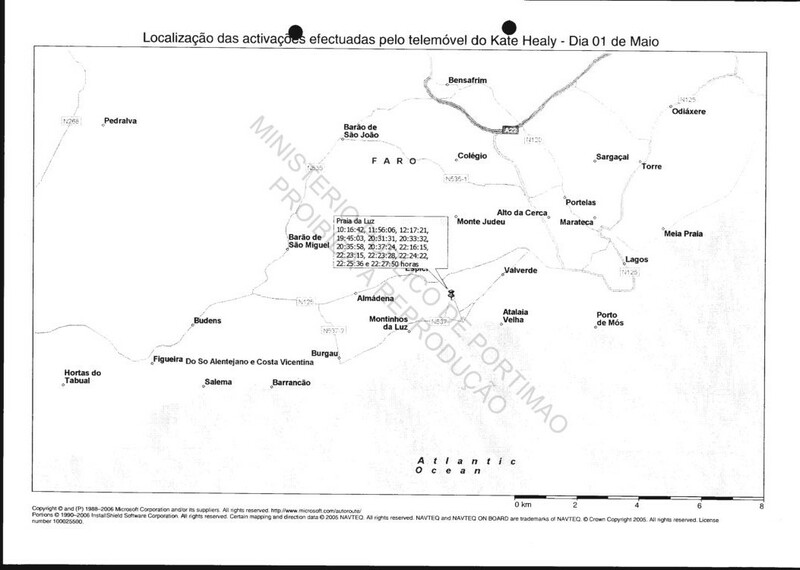 The mobile phone of Kate only on 7th again activates other antennae outside the village where she was living, chronologically: "Praia Porto Mos 3", "Mexilhoeira 3", "N/E", "Mexilhoeira 1", "Penina 1", "Mexilhoeira Carregacao 1", "Algarve Shopping IN 2", "Guia-Algarve 1" and "Assumadas 3". That change of records occurred between 10:50:18 (1st record outside of Luz) and 13:58:42 (last record outside of Luz). 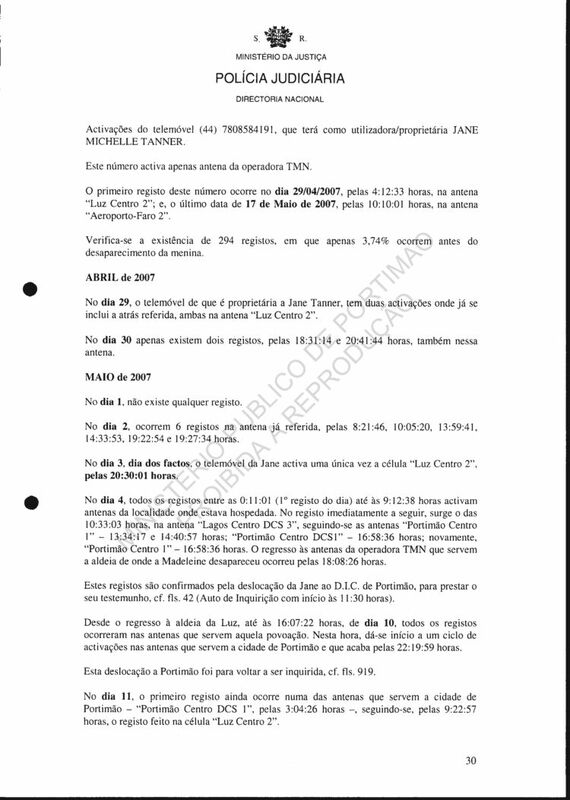 FOOTNOTE  After observation that there would exist an almost weekly pattern in the movements to Portimao since the disappearance of Madeleine, with the most incidence on Thursdays, and after contact with the Inspector Sr. Joao Carlos, to whom is distributed the inquiry, it was possible to determine that the McCann couple went effectively once per week to the English Consulate, where they meet with people of the police, having from a determined time that those meetings were convened on that day of the week, making both parts always possible. The return of the records to the antennae of village where she was living occurred at 14:59:32. 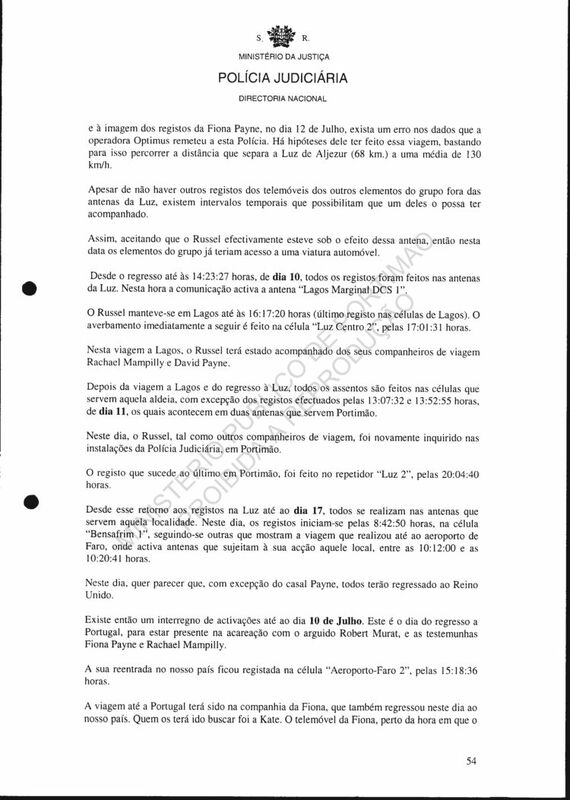 On 8th the analysed records of the communications apparatus indicate an exit from the area of residence of Kate in Portugal at 16:18:56 with the return at 22:26:00 - "Luz (Lagos)". During that period it made records on the antennae: "Portimao Infante 2", "Assumadas 2", "Oura 2", "Areias S Joao DCS 1", "Albufeira DCS 1", "Lagoa Centro 3", "Lagoa Centro 1", "Lagoa Centro 2", "Mexilhoeira l" and "Lagos (Santa Maria)". From 22:26:00 on 8th until 14:40:18 on 10th, the records all materialise on the antennae of Luz. 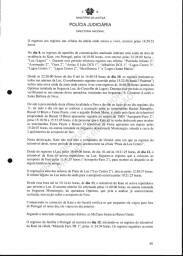 The next registration occurred at 15:22:58 ("Paderne")	indicating a new exit from the area where she was living with return at 16:49:06 (antenna of Optimus installed in the [parish] Luz, Municipality of Lagos). During that period the records were observed on the antennae of that operator, installed on the [parishes]: S.Clemente (Loule) and Santa Barbara of Nexe. Due to the proximity of this last locality to Faro and due to the fact of the next day, 11th, having been the day on which was realised the confrontation between the witnesses Rachel Mampilly, Russel O'Brien and Fiona Payne, with the arguido Robert Murat, and further by the fact of the mobile phone owned by Russel O'Brien presents records on the antenna of TMN "Aeroporto-Faro 2" at 15:18:36 and 15:33:45 it is presumable that Kate had gone there [the airport] to receive the witnesses Fiona Payne and Russel. The mobile phone of Fiona presents a record at 15:20:07 on the antenna installed in the [parish] called Montenegro, situated about 2 kilometres from Faro airport. On this trip, Kate will not have had the company of Gerald, given that the records of his mobile phone, in that period of time, happened on the antenna "Praia da Luz Centro". From the return to Luz at 16:49:06 on 10th until 10:21:25 on 12th, the mobile phone of Kate activates only repeaters in Luz. Followed by records that put it in the airport of Faro at 11:41:57 ("Aeroporto-Faro 2"), to receive or to bid farewell to some relative or friend. The return to one of the antennae of Praia da Luz ("Luz Centro 2") was at 12:58:37. The last record in Luz prior to the exit to the airport occurred at 10:21:25. From that time until 10:14:44 on 13th, the mobile phone of Kate activates only repeaters that serve Luz. The next entry was made at 11:00:06 on the antenna installed in the [parish] Montenegro, of the operator Optimus, which from the analysis already made previously, covers the airport of Faro. Comparing the contacts of Kate and Gerald one observes that while she travelled outside Portugal only on this day, he travelled the day before. 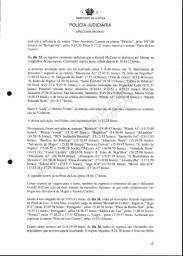 According to what was reported in some daily newspapers the McCann went to the United Kingdom. 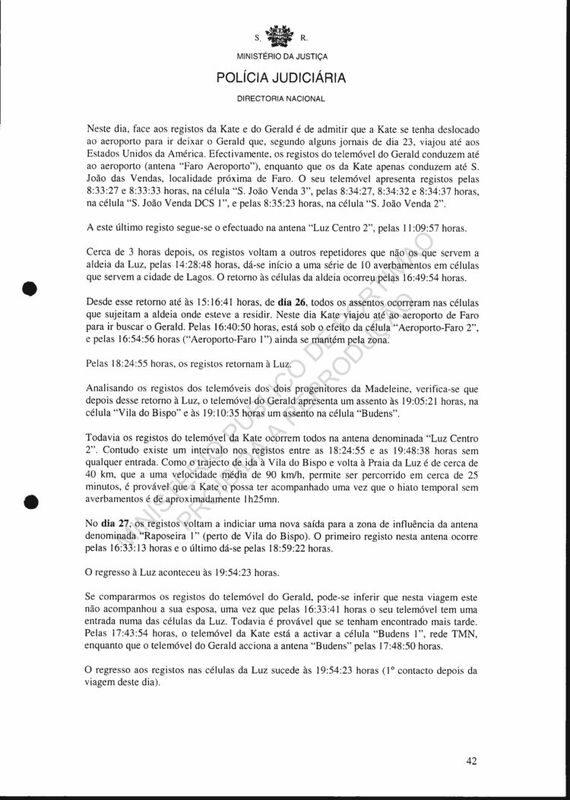 The return of the family to Portugal only occurred on 15th, starting with the record of the mobile phone of Kate on the antenna "Motards Faro TR 1" at 11:34:39. The subsequent records occur on the antenna "Montenegro 2" at 11:35:07, 11:35:13 and 11:35:35. The first record in this return to Luz occurred at 14:53:09. On this day Kate, together with her husband, according to the records of both, again went to the airport of that Portuguese district. Once again was activated the antenna installed in the [parish] of Montenegro at 21:06:05. The final record on this antenna occurred at 21:19:22 then began the return to Luz. 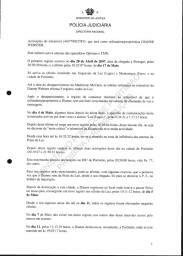 On the way were activated the antennae installed in the [parishes] S. Clemente (Loule) and Ferreiras, of the operator Optimus, and that called "Odiaxere Norte 2", of TMN. The record of arrival in the village occurred about 22:34:52 if one admits to a contact exactly at that moment. From that registration until 18th, all the records occurred on the repeaters that serve Luz. On this day occurred another movement to Portimao. 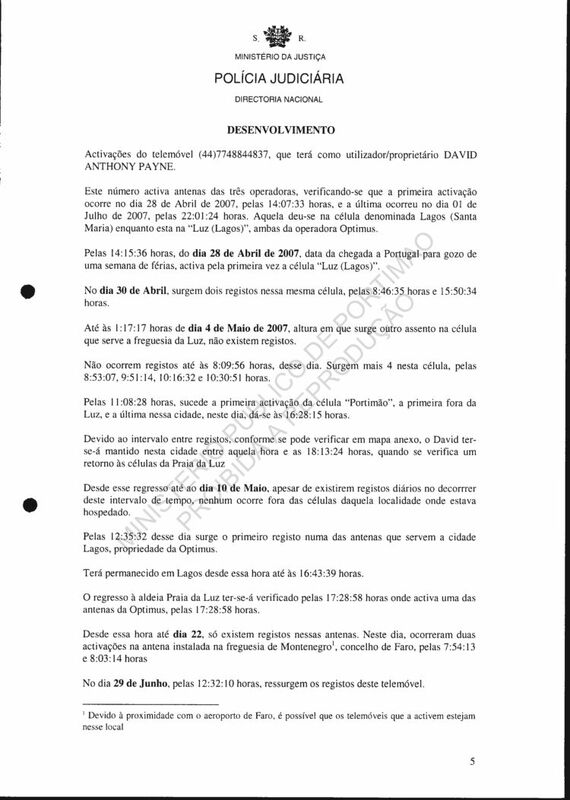 At 11:12:16 occurs the registration of "entry to the city" on the repeater "Portimao Centro 2". Between this record and the previous one there is an interval of about one hour and forty minutes, this record having been made on the antenna "Luz Centro 2". The first activation indicator that Kate will have returned to Luz is registered at 15:22:14 - "Luz Centro 2". 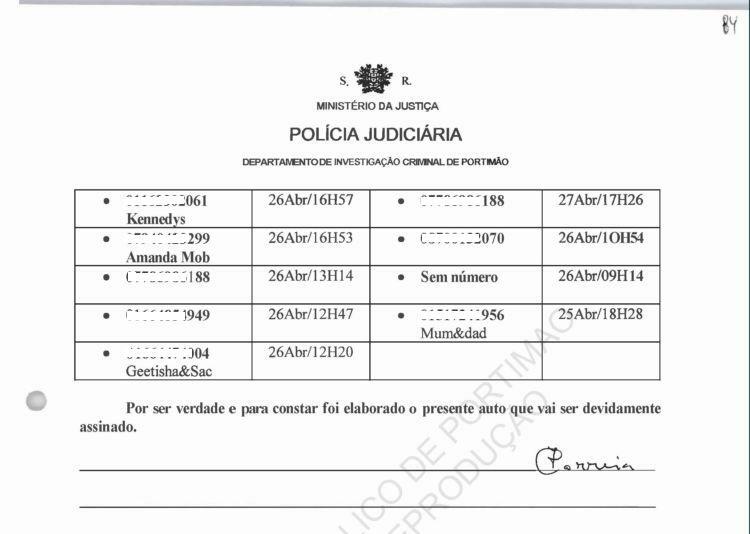 Still on this day Kate, very probably accompanied by Gerald, again left Luz, having activated at 18:11:16 and 18:12:24 the antennae "Burgau 1" and "Raposeira 1" respectively. It points to Gerald having accompanied her, not by the fact of his mobile phone activating any antenna in that area, but due to the fact of his mobile phone being without any contact for about 45 minutes, between 18:01:55 and 18:44:46. 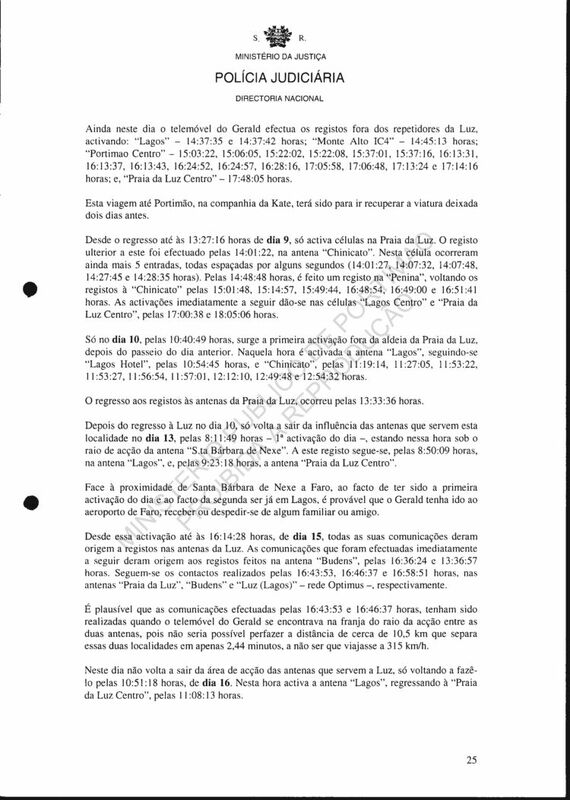 According to the computer program "Microsoft AutoRoute 2007", the distance between Luz and Raposeira can be covered in 16 minutes, which fits into the interval of time in which there exist no contacts on the mobile phone of Gerald. It is added further the fact that the coverage area of the antennae permits a certain distance to the place in which it is installed (see footnote 3). 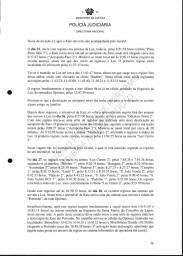 The return to Praia da Luz after the trip to the village of Raposeira was observed at 18:39:42 On 19th, the records of the mobile phone of Kate again indicate a journey to a locality that is in the coverage area of the repeater "Raposeira 1" (17:21:12). At 17:24:08 the mobile phone of Gerald activates the antenna called "Sagres". From this one infers that the two were together in that area of the Algarve. Until arriving at that place the mobile phone of Kate presents records at 16:58:18 and 16:58:22 on the antenna "Budens". 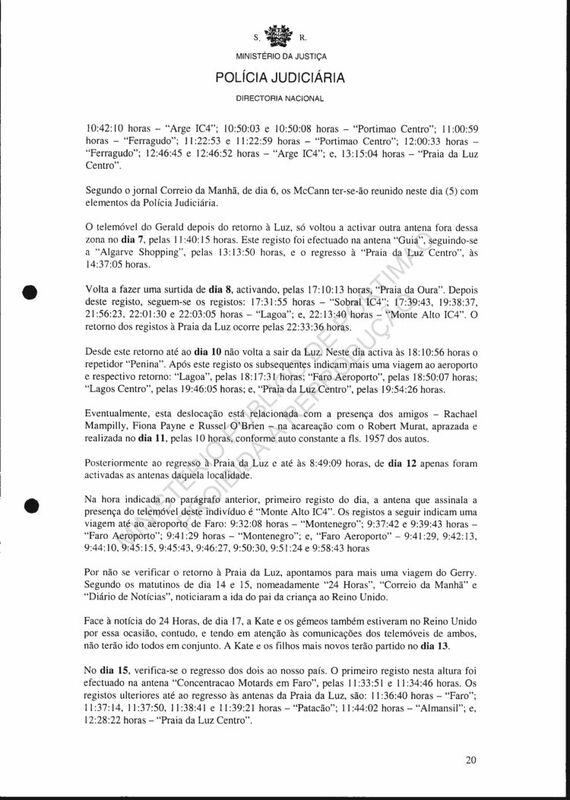 The return to Luz will have occurred about 17:20 - 17:40: at 17:41:24 occurs the first record on the antenna "Luz Centro 2", from the mobile phone of Kate, while the record from the mobile phone of Gerald, in this return to Luz, occurs at 17:27:21. From the return until 22nd there exist no records outside of the antennae of Luz. On this day in view of the records of Kate and Gerald one is granting that Kate had travelled to the airport to drop off Gerald who, according to some newspapers on 23rd, journeyed to the USA. 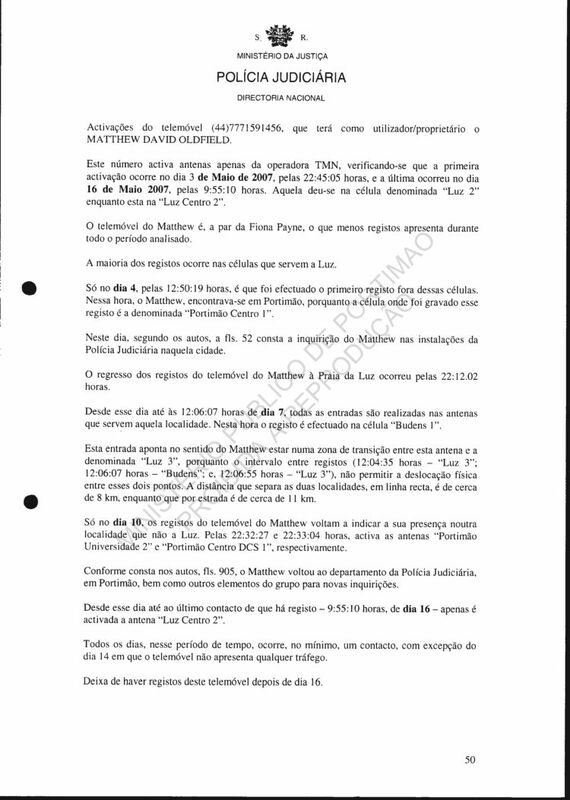 Effectively, the records of the mobile phone of Gerald lead to to the airport (antenna "Faro Aeroporto"), while those of Kate only lead to S.Joao das Vendas, a locality close to Faro. 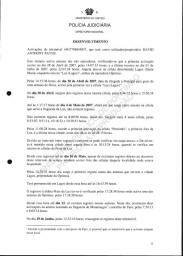 Her mobile phone presents records at 8:33:27 and 8:33:33 on the antenna "S.Joao Venda 3" at 8:34:27, 8:34:32 and 8:34:37 on the antenna "S.Joao Venda DCS 1", and at 8:35:23 on the antenna "S.Joao Venda 2". This last record is followed by one made on the antenna "Luz Centro 2" at 11:09:57. About 3 hours later the records return to other repeaters that do not serve the village of Luz, at 14:28:48, beginning a series of 10 registrations on antennae that serve the city of Lagos. The return to the antennae of the village occurred at 16:49:54. From that return until 15:16:41 on 26th all the entries occurred on the antennae in the village where she had resided. On this day Kate journeyed to the airport of Faro to find Gerald. At 16:40:50 she is under cover of the antenna "Aeroporto-Faro 2", and at 16:54:56 ("Aeroporto-Faro 1") still remaining in the area. At 18:24:55 the records return to Luz. 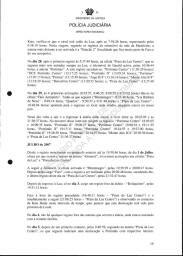 Analysing the records of the mobile phones of the two parents of Madeleine, it is observed that after that return to Luz, the mobile phone of Gerald presents one entry at 19:05:21 on the antenna "Vila do Bispo" and at 19:10:35 one entry on the antenna "Budens". But all the records of the mobile phone of Kate occur on the antenna called "Luz Centro 2". But there exists a gap in the records between 18:24:55 and 19:48:38 without any entry. As the route of going to Vila do Bispo and returning to Praia da Luz is about 40 km, and that an average speed of 90 km/h permits [that distance] to be covered in about of 25 minutes, it is probable that Kate could have accompanied given that the time gap without registrations is approximately 1 hour and 25 minutes. On 27 the records again indicate a new exit to the coverage area of the antenna called "Raposeira 1" (close to Vila do Bispo). The first record on this antenna occurs at 16:33:13 and the last was at 18:59:22. The return to Luz happened at 19:54:23. If we compare the records of the mobile phone of Gerald, one can infer that on this journey he had not accompanied his wife, given that at 16:33:41 his mobile phone has an entry on one of the antennae of Luz. However it is probable that that they had met later. At 17:43:54 the mobile phone of Kate is activating the antenna "Budens 1", TMN network, while the mobile phone of Gerald actions the antenna "Budens" at 17:48:50. The return of the records to the antennae of Luz succeeds at 19:54:23 (the 1st contact after the journey of this day). On 28th the records begin on the antenna "Paderne 2" at 9:04:09, followed by other records with short intervals of time between them, which follow the direction of the airport of Faro - "Aeroporto-Faro 2" at 9:28:36. The last record on one of the antennae that serve that airport follows at 10:07:16 "Aeroporto-Faro 1". From this record there follow others that show the return to Luz. At 11:39:15 it activates the antenna "Luz 1". Still on this day the mobile phone presents records outside of the antennae of Luz at 17:57:58 and 18:26:16 on the antennae "Budens 1" and "Burgau 1", respectively. The rest up to to the end of the day occur on the antennae of Luz. On 29th the records of the mobile phone of Kate are all made on those same antennae. 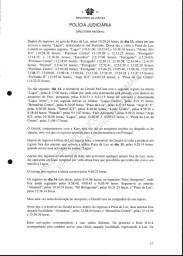 Contrary to what happens with the records of Gerald, as was already referred to above in the analysis of the contacts of his mobile phone, which place him around 9:00am in the airport of Faro. On 30th the entries begin on the antenna "Luz Centro 2". After some contacts there appear other records on antennae that reveal a journey to Portimao. The record of "entrance" on one of the antennae that serve this city occurs at 10:38:08 - "Portimao Infante 2". [The phone] will have remained in the coverage area of the antennae that serve that city until about 13:21:19 - "Portimao Infante 2". 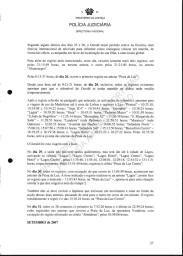 From this contact the records point to the return to the village of Luz, where [the phone] will have arrived between 14:18:38 ("Praia Porto Mos 3") and 14:33:32 (antenna of the operator Optimus, installed in the [parish] of Luz, Municipality of Lagos). On 31, all the records are made on the antennae that serve the locality Luz. 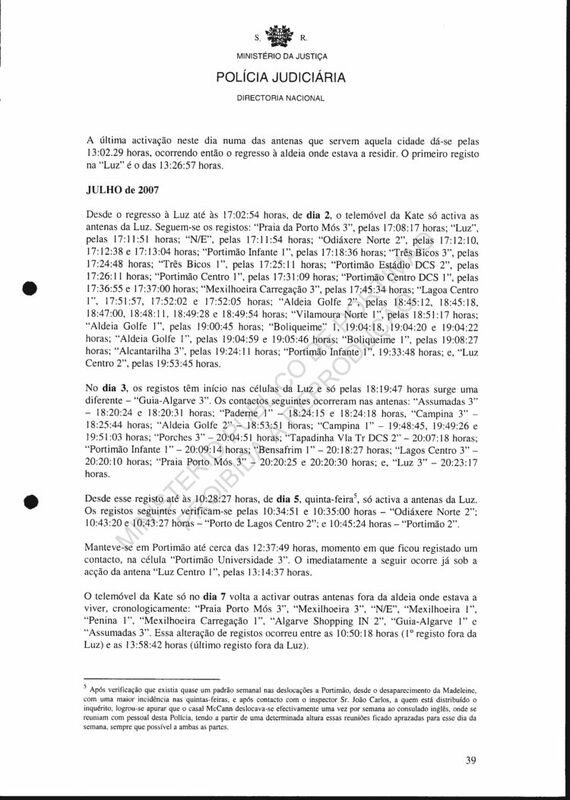 On 1 August the records of the mobile phone of Kate start on the antennae in the village where she lived in Portugal, observing that from 10:02:46 ("Assumadas 3") there began a movement in the direction of the airport of Faro ("Aeroporto Faro 1" at 10:33:52 and 10:34:08). Once again Kate made the journey in the company of her husband. They went to receive or to bid farewell to someone they knew or relative. After the record at 10:34:08 the records show the start of the journey of return to Luz, activating at 11:40:13 the antenna "Porches 1". 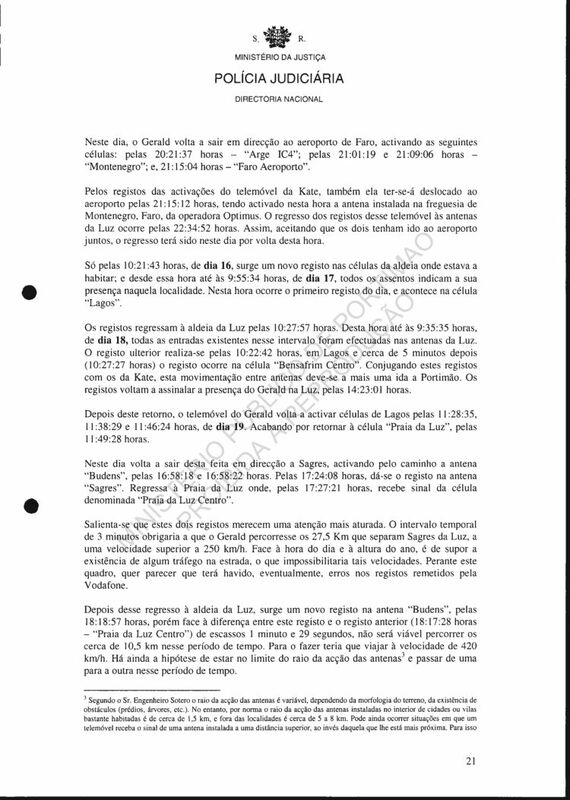 that serve Luz, but others do, they point to her presence in Lagos, where [the phone] activates at 12:39:27 the antenna "Lagos Centro 3" (the 1st record in this city on this day) and remains there until 17:36:11. 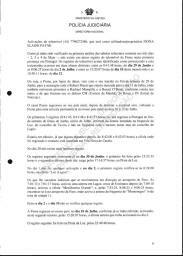 However, the mobile phone of Gerald after the exit from the airport, where, as already stated, he will have gone with Kate, presents entries on the antennae that serve Lagos at 12:07:08 and 12:12:03 followed at 12:18:48 the record on the antenna "Praia da Luz". Given the proximity to Lagos, it is probable that Kate had been in Luz prior to going to Lagos, or could have been left [dropped off] by Gerald in Lagos, given that there are contacts of both, within the same minute, each activating a different [distinct] antennae. His mobile phone activates the antenna "Praia da Luz Centro" at 12:39:29 while hers activates at 12:39:27 the antenna "Lagos Centro 3". 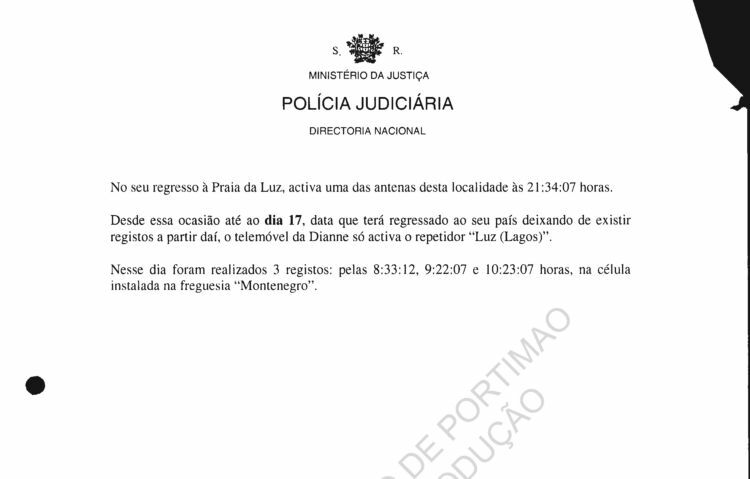 The return of the records of the mobile phone of Kate to Luz happens at 17:48:52 - "Luz Centro 2". On the other side of this communication are two more on that antenna: at 17:48:57 and 18:51:23. Followed by one called "Budens 1" at 19:20:34. 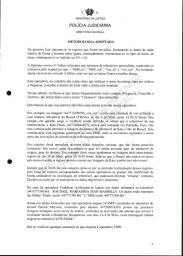 This record is the first of a series that point to another trip to a locality within the coverage area of the antenna "Raposeira 1". The last registration on that repeater occurs at 20:02:09 followed by the repeaters "Budens 1", "Burgau 1" and "Luz Centro 2" at 20:04:16, 21:06:49 and 22:14:45 respectively. On 2nd all the records were made on the antennae that serve Luz. On 3rd the first record of the mobile phone of Kate on this day was made on the antenna "Assumadas 2" at 8:49:07 and the second was already on the antenna of the operator Optimus installed in the [parish] of Santa Maria, municipal area of Tavira at 13:45:45. 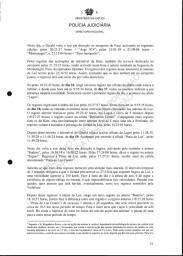 The subsequent records indicate the journey of return to Luz, where it activates the antenna, also of the operator Optimus, installed in the [parish] of Luz, of the Municipality of Lagos at 14:38:56. On the route are activated the antennae installed in Tavira (Santiago), Santo Estevao, Estoi, Santa Barbara of Nexe, Loule (Sao Clemente), Ferreiras, Pera, Porches and Estombar, entering then into the coverage area of the antenna of Luz. According to the news related by some organs of the written media on 4th, the McCann were on this day in Huelva as part of their campaign to locate Madeleine. About 10 minutes after entering Luz (14:49:05) the mobile phone of Kate was on the antennae that serve Lagos. It remained there until 15:22:47 returning then the records to the antennae that serve Praia da Luz at 16:13:16. Possibly, the McCann after they had returned from Huelva will have stopped to go for lunch in a place within the coverage area of the antennae that serve Lagos. 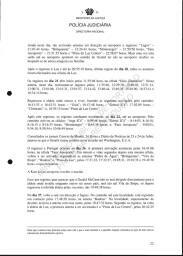 Gerald McCann, from the [time of the] exit of his mobile phone from the coverage area of the antenna "V.R. 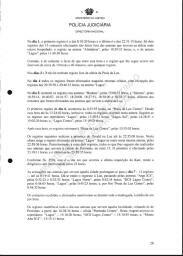 of Santo Antonio" at 13:38:00, was to have another activation only again at 16:28:53 on the antenna "Praia da Luz Centro" This data on the one hand corroborates the hypothesis of they having gone to lunch at Lagos, but on the other it can indicate that Gerald had stayed in Luz while Kate had gone to Lagos. 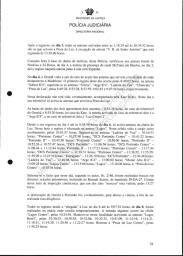 On 4th, while the mobile phone of Kate made no records outside of the antennae of Luz, the mobile phone of Gerald begins its entries on the antenna "Sobral IC 4" at 8:49:02 followed by "Silves" at 8:49:28. On 5th the mobile phone of Kate again presents records solely on the antennae of Luz, despite there occurring at times [from time to time] intervals between contacts of greater than 1 hour, for example: between 19:27:13 and 21:05:31 (about 1 hour 40 minutes). Under cover of that interval there is sufficient time to make a journey between Luz and, for example, Albufeira and back again, at an average speed of 90 km/h. Also it is admitted that the time gap may only be an absence of contacts. On 6th the mobile phone of Kate only presents records on the antennae of Luz. Conversely, the mobile phone of Gerald activates, among others, some antennae that serve Portimao. 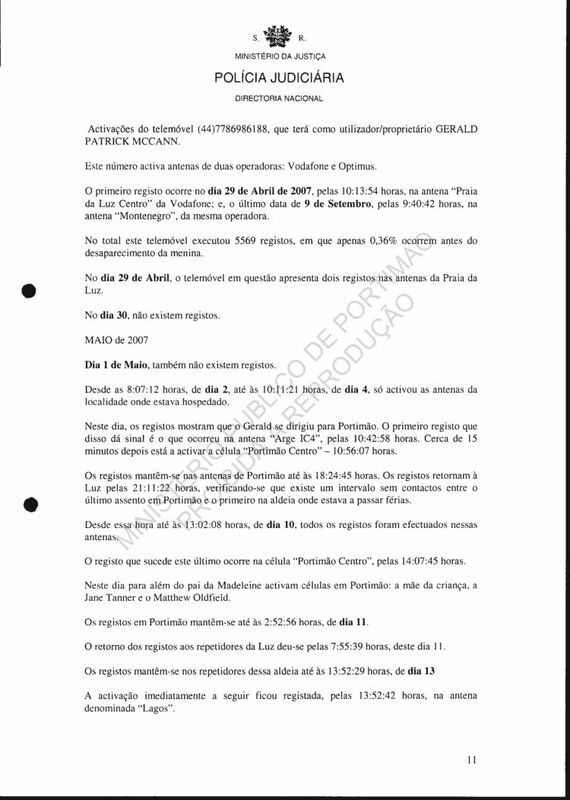 As stated above in the analysis of the contacts of the mobile phone of Gerald, there exists the possibility of him having gone to Portimao to leave the Renault Scenic vehicle, licence 59-DA-27. On 7th the records of the mobile phone of Kate remain, like before, solely in Luz. On 8th the antennae activated by the mobile phone of Kate indicate her presence in Lagos between 9:40:34 and 11:32:44. Later, between 15:00:42 and 17:15:34 the records of her mobile phone reveal her presence in Portimao. The record immediately following the last in Portimao occurs on one of the antennae of Luz ("Luz Centro 1") at 17:49:23 not again on this day, after this return, activating any other antenna outside of Luz. 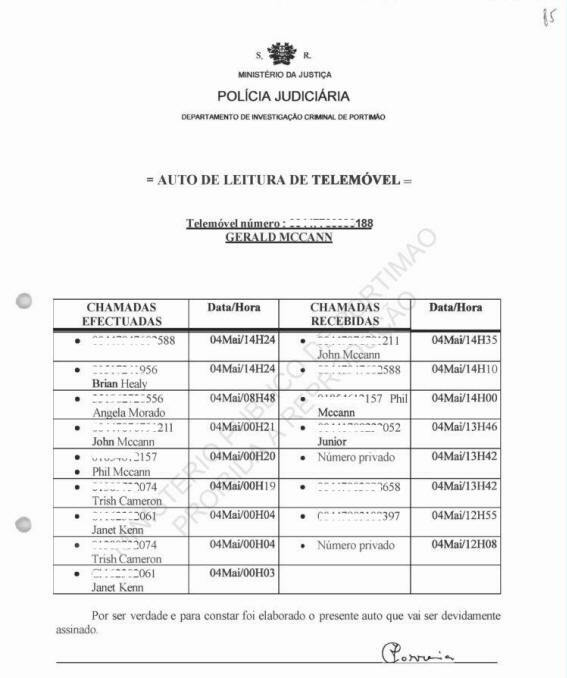 This movement to Portimao of the McCann will have been to effect, possibly, another meeting with some senior persons of the police, and/or for them to have picked up the vehicle that Gerald had left on 6th. On 9th the records of the mobile phone of Kate begin on the antennae that serve the village where she resided, and remain there until about 13:41:54 ("LUZ 2"). The next record is made at 14:52:51 on the antenna "Odiaxere 2". 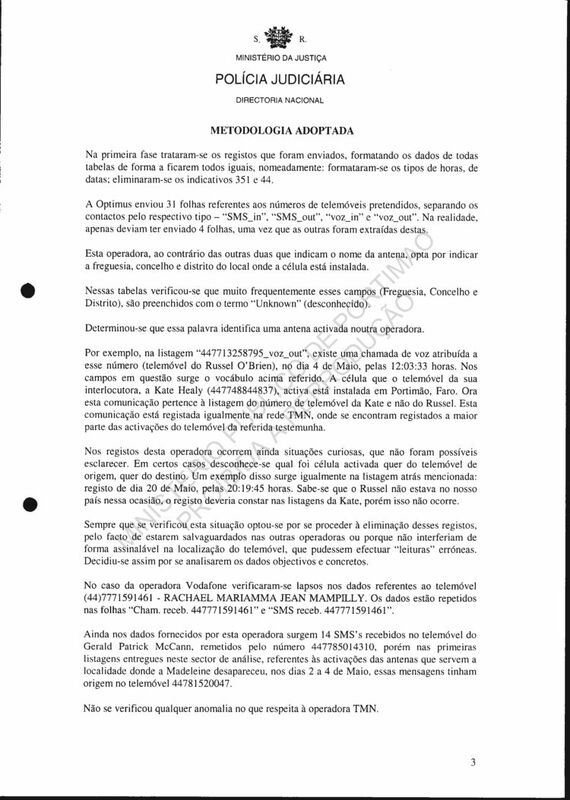 The entries following point to Kate having circulated between that antenna and the antennae that serve the localities of Mexilhoeira, Odiaxere and Lagos. Re- entering the antennae that serve Praia da Luz at 17:19:20 where it remained for the the rest of the day. On 10th the mobile phone of Kate presents records on the antennae of Luz between 8:14:14 and 10:41:39; on the antenna "Lagos Este 3" at 10:59:27; on the antenna "Odiaxere 2" between 11:24:02 and 12:56:53; on the antenna "Mexilhoeira 2" at 12:59:34; again on the antenna "Odiaxere 2" between 13:00:04 and 13:00:56; on the antenna "Lagos Norte 3" at 13:10:49; and on the antenna "Praia Porto Mos 3", between 13:14:08 and 13:14:30. There follows the re-entry on the antennae of Luz from 13:28:10. This is the second day on which the McCann circulate in the triangle formed by the localities Lagos, Odiaxere, Mexilhoeira Grande. One does not know the purpose, having no other sources that might possibly determine the reason and the destination of the couple. From 11th until 16:41:04 on 15th all the records are made on the antennae that serve the village where the McCann resided. At that time the mobile phone of Kate is in the coverage area of the repeater "Burgau 1". If one looks at the records of the mobile phone of Gerald, during the time intervals between records of the mobile phone of Kate, and accepting the premise that they had travelled together, there being strong probabilities of that having happened, then Kate will have gone a little beyond the locality called Burgau. After that activation in Burgau, the successive records up to the end of the day happen on the antennae of Luz, it being that the indication of the return to those antennae occurs at 17:11:08. Only on 17th do there again appear registrations outside of the village of Luz, which occurred between 15:17:18 and 16:41:11 on the antennae "Budens 1" (2 entries) and "Burgau 1" (8 entries). The most entries on this day were made on the antennae of Luz, where appear the 1st records after the "walk" at 17:40:14. On 18th and 19th all the records remain in Luz. However, on 19th one observes a time gap of about of 1 hour 50 minutes, between 9:16:50 and 11:06:22. 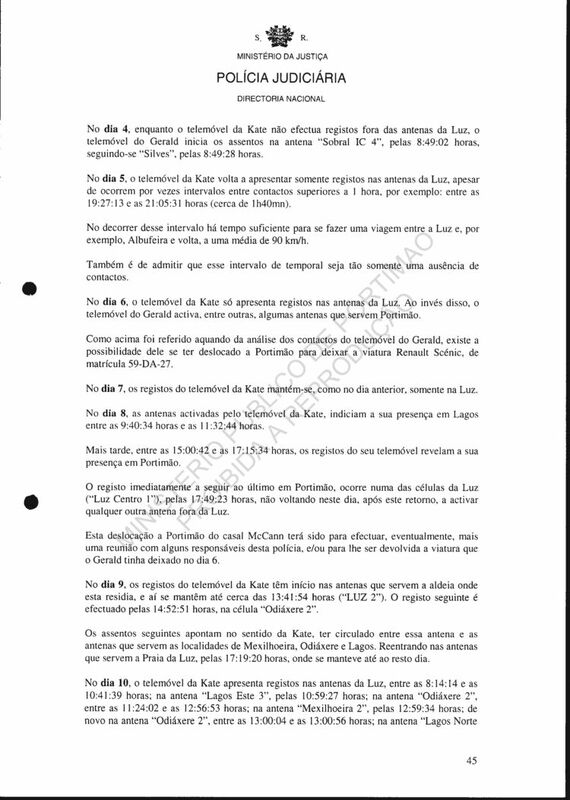 The entries of the activations of the mobile phone of Gerald in that interval of time occur on the antennae "Patacao" (10:00:24) and "Faro Aeroporto" (10:03:53), due to which it is probable Kate had gone with her husband to Faro, to receive or bid farewell to a friend or relative, there being enough time for them to have journeyed at an average speed of 100 km/hour. 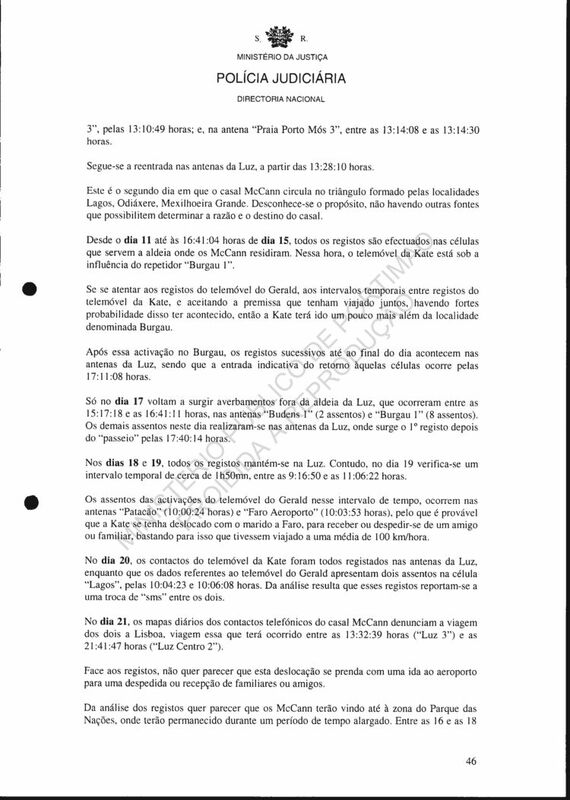 On 20th the contacts of the mobile phone of Kate were all registered on the antennae of Luz, while the reference data of the mobile phone of Gerald presents two entries on the antenna "Lagos" at 10:04:23 and 10:06:08. From the analysis it results that those records are reporting an exchange of "sms" between the two. 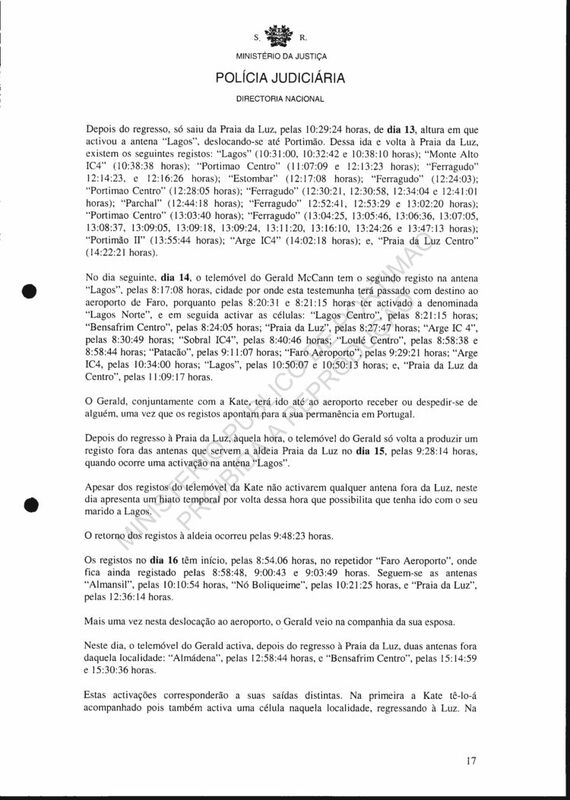 On 21st the daily maps [diagrams] of the phone contacts of the McCann denounce the journey of the pair to Lisboa, a journey that will have occurred between 13:32:39 ("Luz 3") and 21:41:47 ("Luz Centro 2"). From the records, it does not appear that this movement ties up with a trip to the airport for a farewell or reception of relatives or friends. 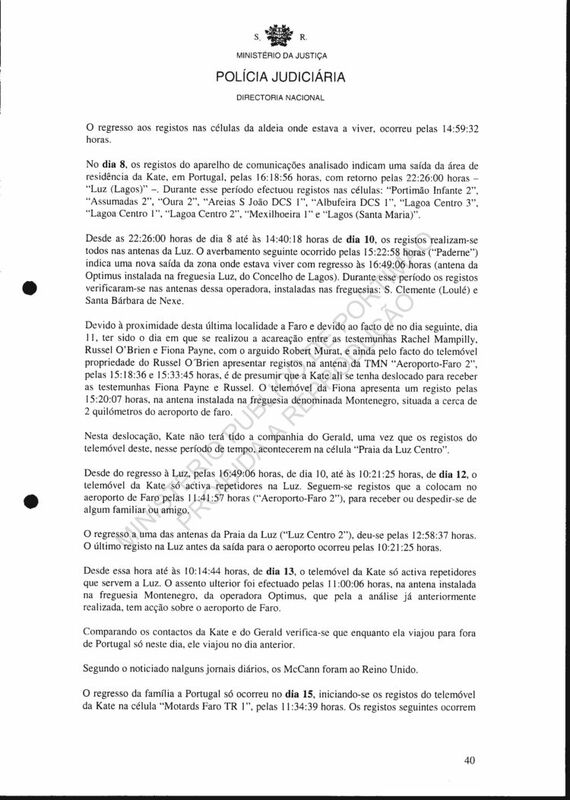 From the analysis of the records it does appear that the McCann will have come to the area of the Parque das Nacoes [Park of Nations], where they will have stayed for a prolonged period of time. Between 16:00 and 18:00 in the case of the mobile phone of Gerald and between 16:30 and 18:30 in the case of the mobile phone of Kate, there exist no other registered communication. From the return to Luz on 21st until 25th all the records of Kate occur in the village of Luz. In that period, more specifically between 23rd and 24th, the records of Gerald demonstrated his absence from our country for a period of about 27-28 hours. As was stated previously in the analysis of the contacts of the mobile phone of Gerald, this absence of records is due to the journey of Gerald to Scotland. On 25th all the records of the mobile phone of Kate occur on the antennae that serve Luz, except for the records between 8:53:37 and 9:12:06 that occur in the city Lagos. On this day Gerald returns to our country. After the return to Luz on 25th at 9:49:15 after her passage through Lagos, all registrations were made on the antennae that serve Luz until 9:00:00 on 28th. The activations afterwards demonstrate another journey of Kate to the area of Lisboa, together with her husband. On this day at 14:19:41 appears one record made on the antenna installed in the [parish] of Carnide, municipal area of Oeiras, from the operator Optimus. The preceding record was made on the antenna installed in the [parish] do Feijo, municipal area of Almada at 12:18:14. Thus there exists a time gap (of about 2 hours) without any records, that is, without any information that permits one to suggest a place of stay. Even less exist other sources that can support that. Also the mobile phone of Gerald presents a gap without communications about the pair - at 12:02:52 it activates the antenna of Optimus installed in the [parish] of Marateca, and at 14:06:55 it activates the antenna of Vodafone called "Avenida das Nacoes". 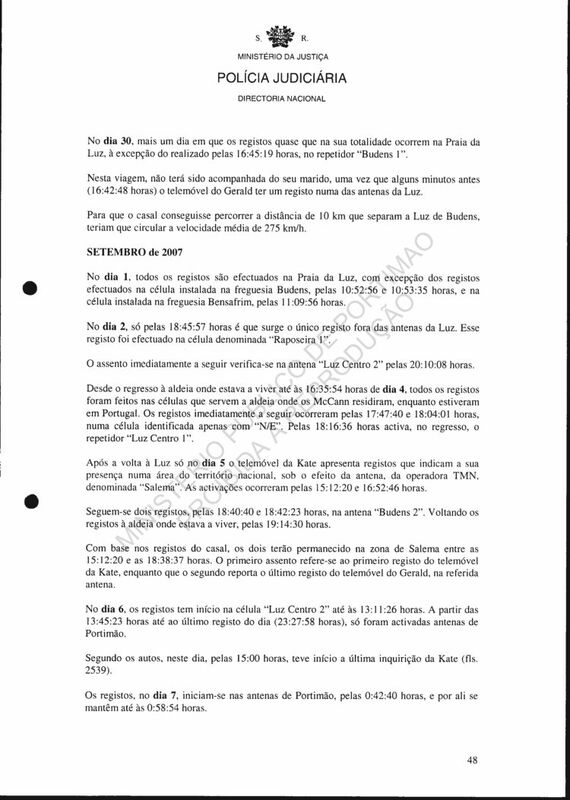 After the records mentioned before (antennae of Carnide and the "Avenida das Nacoes"), the records shown the return to Praia da Luz, where the mobile phone of Kate presents the first record at 17:28:37. 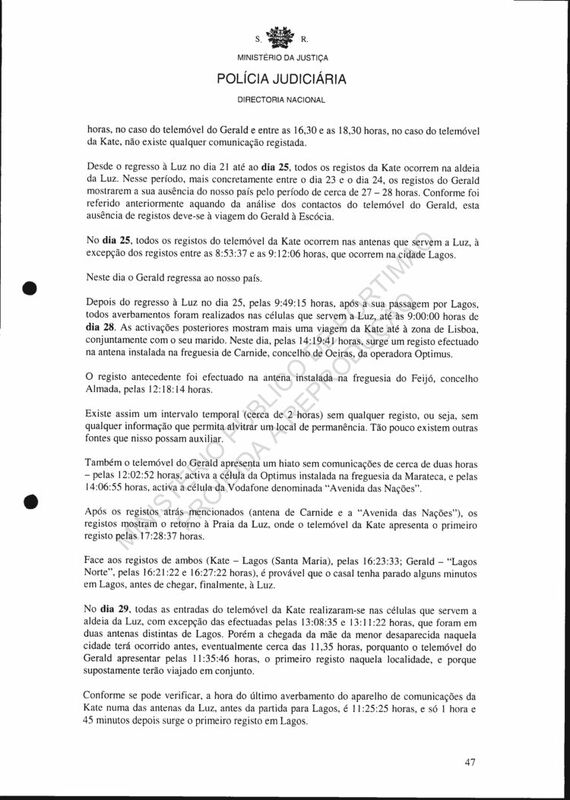 From the records of both (Kate - Lagos (Santa Maria) at 16:23:33; Gerald - "Lagos Norte" at 16:21:22 and 16:27:22), it is probable that the couple had stopped for some minutes in Lagos, prior to arriving, finally, at Luz. On 29th all the entries of the mobile phone of Kate were made on the antennae that serve the village of Luz, except for those made at 13:08:35 and 13:11:22 that were on two separate antennae of Lagos. However the arrival of the mother of the missing minor in that city will have occurred prior to, possibly, about 11:35 since the mobile phone of Gerald presents at 11:35:46 the first records in that locality, and because supposedly they will have journeyed together. 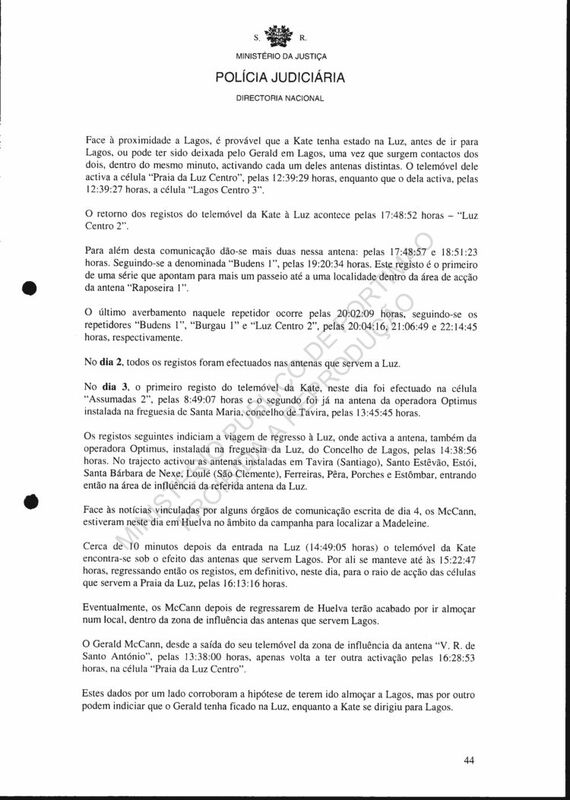 As one can observe, the time of the last registration of the communications apparatus of Kate on one of the antennae of Luz, prior to the departure to Lagos, is 11:25:25 and only 1 hour and 45 minutes after appears the first records in Lagos. On 30th one more day in which the records almost entirely occur in Praia da Luz, except for that made at 16:45:19 on the repeater "Budens 1". On this journey, she will not have been accompanied by her husband, given that some minutes prior to it (16:42:48) the mobile phone of Gerald having a record on one of the antennae of Luz. For the couple to have managed to cover the distance of 10 km that separated Luz from Budens, they would have had to travel at an average speed 275 km/h. On 1st all the records are made in Praia da Luz, except the records made on the antenna installed in the [parish] Budens at 10:52:56 and 10:53:35 and on the antenna installed in the [parish] Bensafrim at 11:09:56. On 2nd only at 18:45:57 appears the only record outside of the antennae of Luz. That record was made on the antenna called "Raposeira 1' The entry immediately following is observed on the antenna "Luz Centro 2" at 20:10:08. From the return to the village where she was living, until 16:35:54 on 4th, all the records were made on the antennae that serve the village where the McCann resided while they were in Portugal. The records immediately following occurred at 17:47:40 and 18:04:01 on the antenna identified only as "N/E". At 18:16:36 it activates, on the return, the repeater "Luz Centro 1". 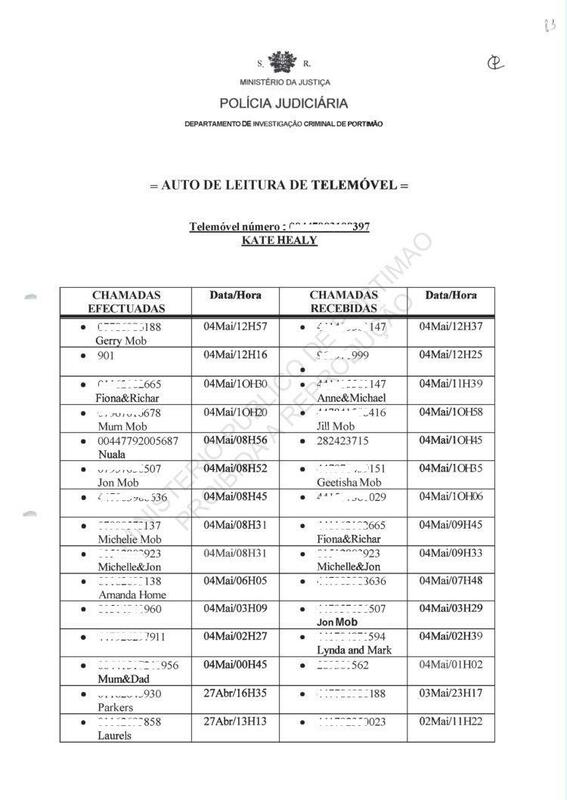 After the return to Luz only on 5th does the mobile phone of Kate present records that indicate her presence in an area of the national territory, on the antenna of the operator TMN called "Salema". The activations occurred at 15:12:20 and 16:52:46. There follows two records at 18:40:40 and 18:42:23 on the antenna "Budens 2". The records return to the village where she was living at 19:14:30. Based on the records of the couple, the couple will have stayed in the area of Salema between 15:12:20 and 18:38:37. The first entry refers to the first record of the mobile phone of Kate, while the second reports the last record of the mobile phone of Gerald on the referred antenna. On 6th the records begin on the antenna "Luz Centro 2" until 13:11:26. From 13:45:23 until the last record of the day (23:27:58), only the antennae of Portimao were activated. 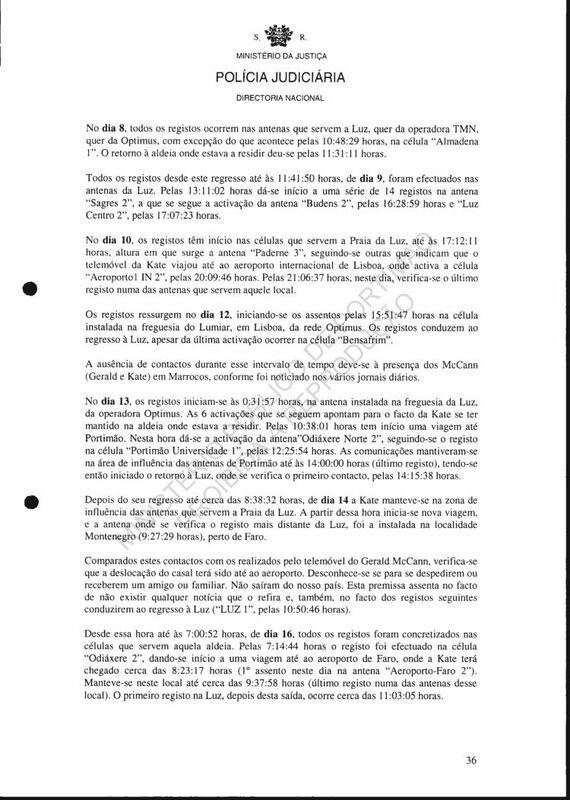 According to the case file documents, on this day at 15:00 there began the last questioning of Kate (pages 2539 ff. The records, on 7th, begin on the antennae of Portimao at 0:42:40 and remain there until 0:58:54. The registration immediately following, the first on the antenna of Luz on this day, was made at 1:22:23. During this night, and until leaving the coverage area of the antennae that serve Luz, the mobile phone of Kate had a large flow of contacts, with an average of about 12 minutes between records. The interval of greatest duration without any activity was of about of 2 hours and 25 minutes, and the smallest was of about of 0:00:03 . At 10:32:29 occurred the last record in Luz prior to going to Portimao. The first entry outside of the antennae of the village of Luz was made on the antenna "Praia Porto of Mos 3". 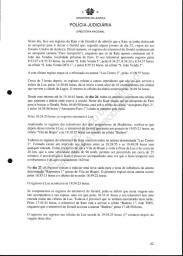 There follow three records on the antenna called "Odiaxere Norte 2", entering then at 11:13:30 in the coverage area of the antennae that serve the city of Portimao, where Kate was questioned in the D.I.C. 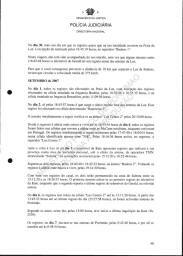 of Portimao from 11:00 until 14:30 according to the respective case file document (page 2557). The last entry on the antennae that serve Portimao occurred at 16:07:42 returning to those that serve the village of Luz at 16:33:26. The last record of this day was made at 23:59:40 on the antenna "Luz Centro 2". 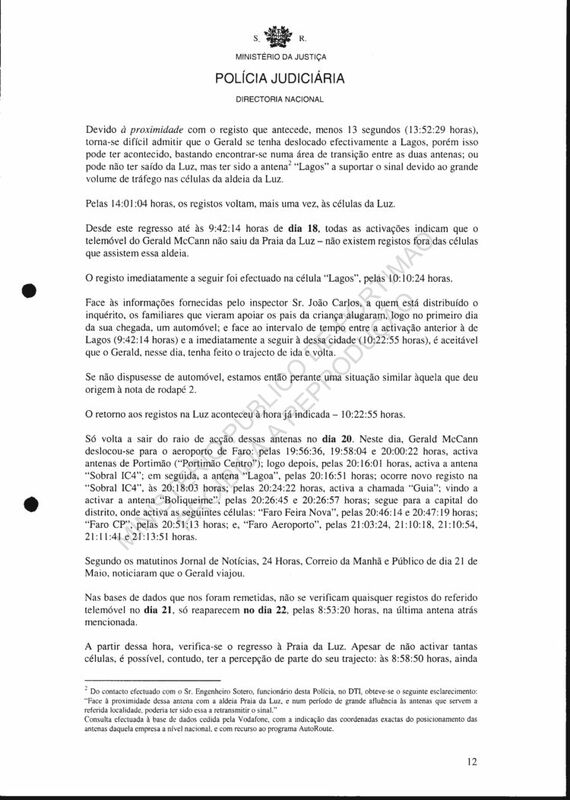 This record refers to the one message received from the mobile phone of Gerald that was in Portimao, where he was questioned between 16:05 and 22:50 (pages 2567 and ff). On 8th all the contacts were registered on the antennae "Luz 2" and "Luz Centro 2". On 9th the records made announce the trip to to the airport of Faro, where it will have arrived about 8:05:15 (first record made on the antenna "Aerporto-Faro 2"). The rest of the 9 records, the last recorded on the tables analysed, were made on that same antenna. Footnote  Reception of a long message, automatically split into two by its own transmission method. latter is on "Luz Centro 2". least number of records during the entire period analysed. The majority of records occur on the antennae that serve Luz. recorded is called "Portimao Centro 1". questioning of Matthew in the premises of the Policia Judiciaria in that city. while by road it is about 11 m.
antennae "Portimao Universidade 2" and "Portimao Centro DCS 1", respectively. other members of the group for new questioning. activated the antenna "Luz Centro 2". the 14th on which the mobile phone does not show any traffic. There are no records from this mobile phone after 16th. Report pages 51 and 52. This number activates antennae of the operators Optimus and Vodafone. 2007, and the last occurs at 12:18:44 on 12 July, 2007. April and 17 May, and the other between 10 and 12 July. activated is called "Praia da Luz Centro". serve the locality where she was a guest. antennae of Optimus that serve the [parish] of Luz. At 18:30:01 appears the first record on one of the antennae that serve Portimao. repeaters of Luz at 7:24:02 on 5th. are made on the antennae that serve that locality. antennae installed in the [parish] of Santa Maria, Municipality of Lagos. antennae in Lagos in that period of time. The records return then to the antennae of Luz at 17:02:29.
presence of Rachel in Portimao is tied in again with questioning. begins the return journey to Luz where she will have arrived at 19:33:55.
locality on 17th at 8:39:08.
followed indicate the return of this witness to her native country. 10:56:49, 10:57:53, 10:58:08 and 11:00:03.
antenna installed in the [parish] of Montenegro. Effectively, the records on 11th show the presence of Rachael in Portimao. At 14:09:42 the records return to the antennae of the [parish] of Luz. entries (the last farewell - 12:18:44). having been driven to the airport by Kate. 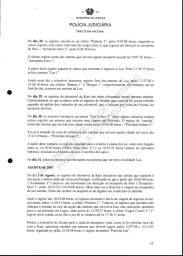 Report pages 53 to 55. This number activates antennae of the operators TMN and Optimus. (antenna "Faro Bom Joao 3"). the other between 10 and 12 July. On 29th there exist no records. in the village where he came to spend his holidays with his family and friends. The first after the alert having been given happens at 8:13:19 on 4th. 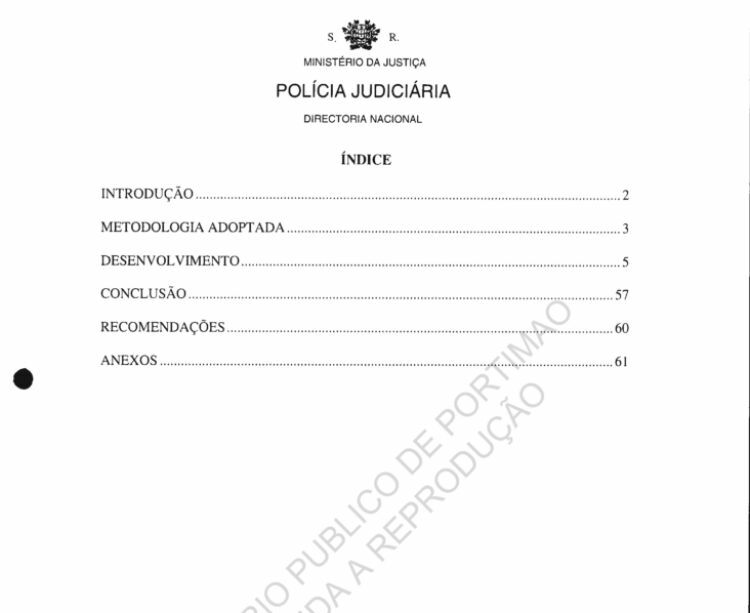 was questioned in the department of the Police situated em Portimao. The records return to the antennae of Luz at 14:24:00.
made that journey, there being sufficient time for him to cover the distance that separates Luz from Aljezur (68 km.) at an average [speed] of 130 km/h. records] that make it possible for one of them to have accompanied him. access to a motor vehicle. Russell remained in Lagos until 16:17:20 (last record on the antennae of Lagos). companions Rachael Mampilly and David Payne. 13:07:32 and 13:52:55 on 11th, which happen on two antennae that serve Portimao. at the premises of the Policia Judiciaria in Portimao. The record that succeeds the last in Portimao was made on the repeater "Luz 2"
presence in that place between 10:12:00 and 10:20:41.
returned to the United Kingdom. Robert Murat, and the witnesses Fiona Payne and Rachael Mampilly. (Santa Barbara de Nexe), at around that time. repeater "Luz Centro 2" follows at 17:53:23. 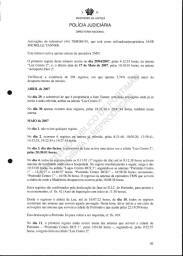 Luz, except that recorded at 13:18:21 on the antenna "Tres Bicos DCS 1". following day, 12th, making its way to the airport to return to its county of origen. The last activation in Portugal is registered on the antenna "Faro Bom Joao 3", at 15:53:35. ---> 344 Gerry on 2 and 3 May. ---> 345 Gerry on 3 May. This map shows Kate's phone activity on 1 May. There is no map for Gerry on 1 May. But here is Gerry on 2 and 3 May. Activations of mobile (44) 777159 ####, will have the user / owner Matthew David Oldfield. From that day until the 7th of 12:06:07, all entries are made in antennas that serve that area. At this moment the registration is made in cell "Budens 1". This entry along the lines of Matthew to be in a transition zone between this antenna and called "Light 3", since the interval between records (12:04:35 hours - "Light 3"; 12:06:07 hours - "Budens"; and 12:06:55 hours - "Luz3"), does not allow the physical movement between these two points. The distance separating the two sites, as the crow flies, is about 8km, while by road is about 11km.